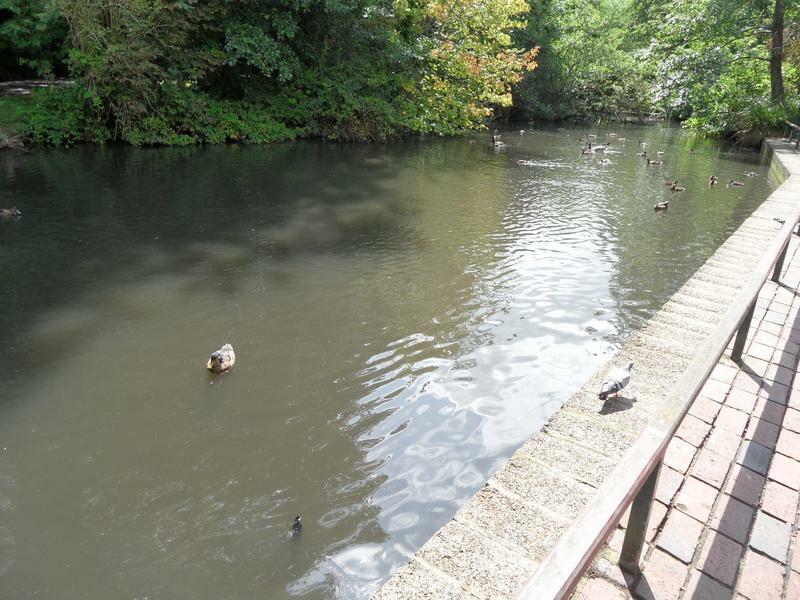 Bromley Council and is about 100 years old. 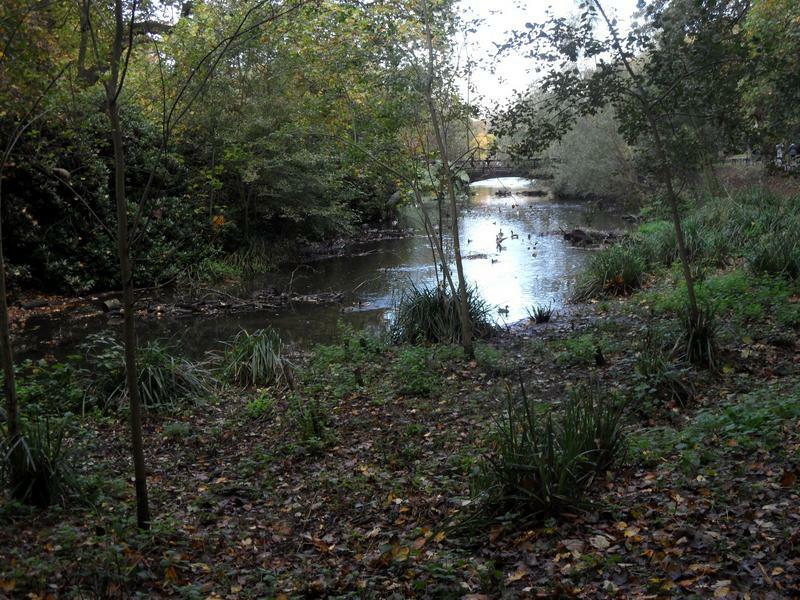 borders and planting appear to be the west side. 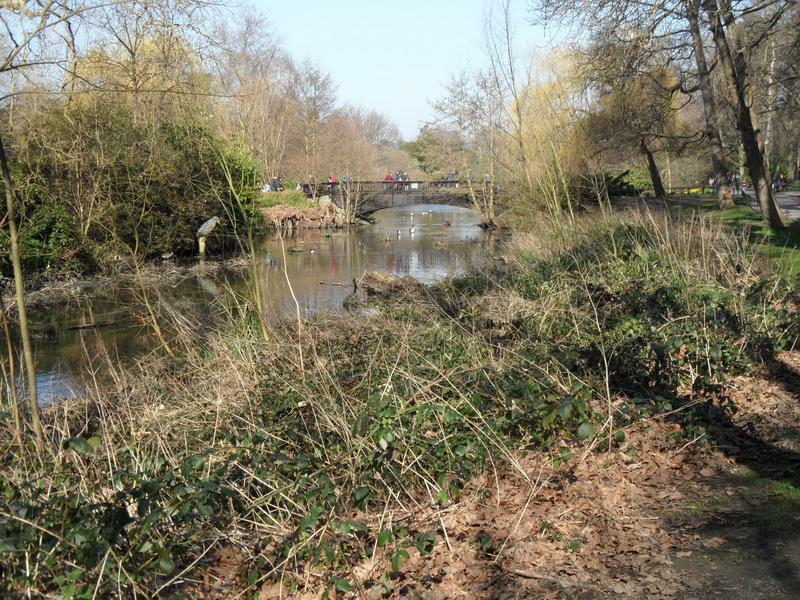 Unfortunately, the west side of the park is barred to dogs (even on leads). 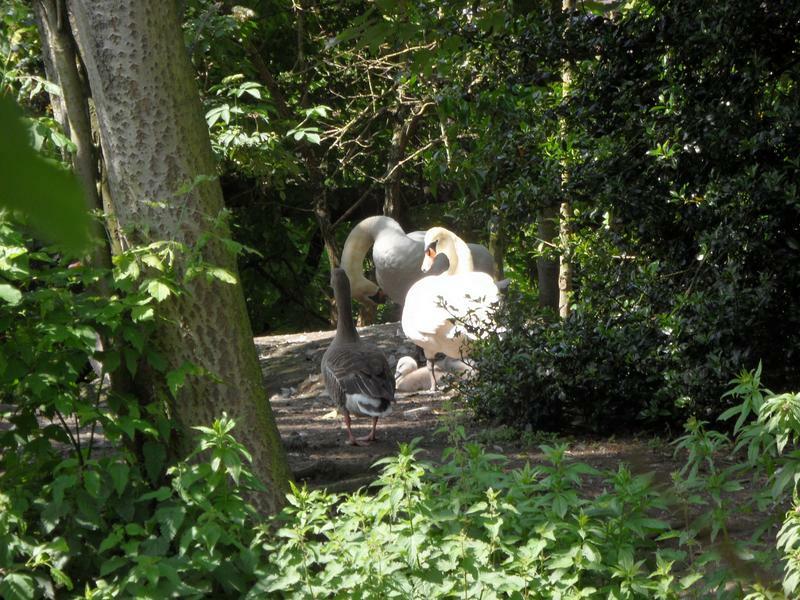 including Mandarin, Wood, Muscovy and Appleyard Ducks, Greylag and Egyptian Geese, and Swan cygnets. 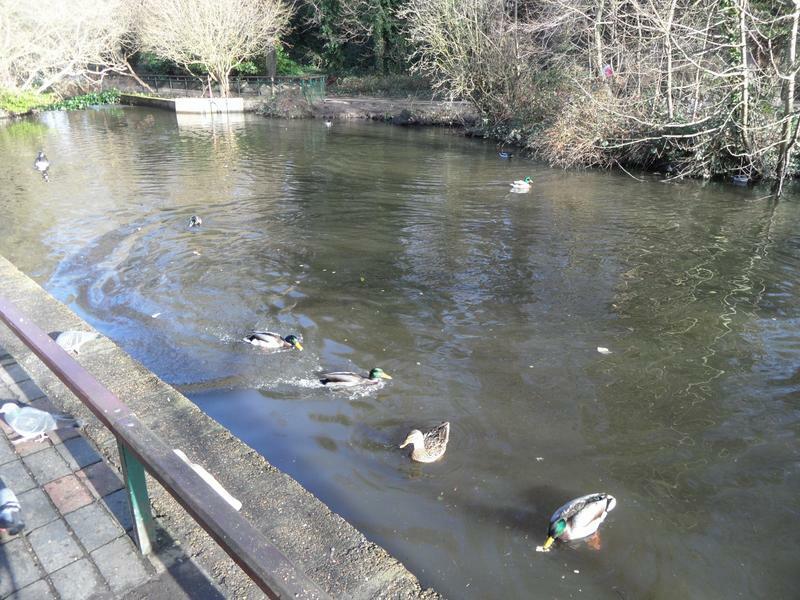 2nd February 2014, the northern pond is relatively quiet, no geese or gulls, just a few mallards. 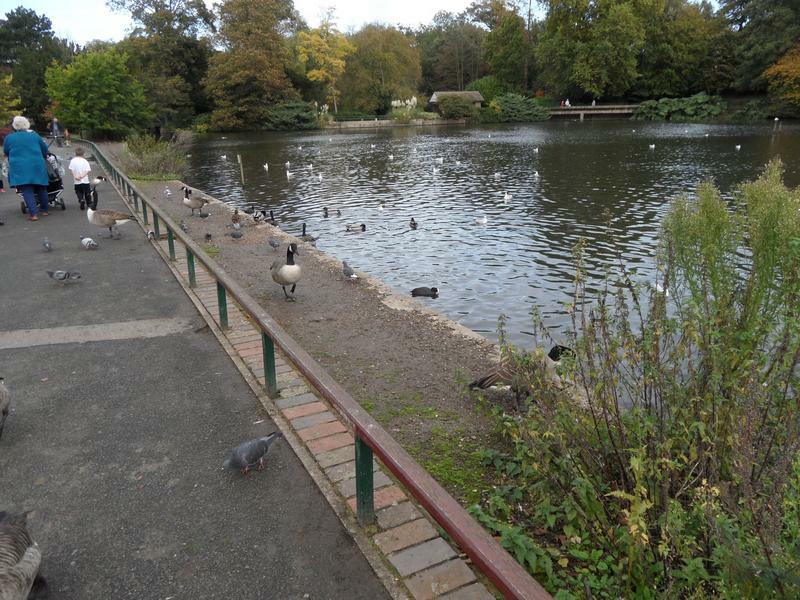 The park is very muddy after six weeks of heavy rain, some geese on this lake and the usual pair of Muscovy Ducks. 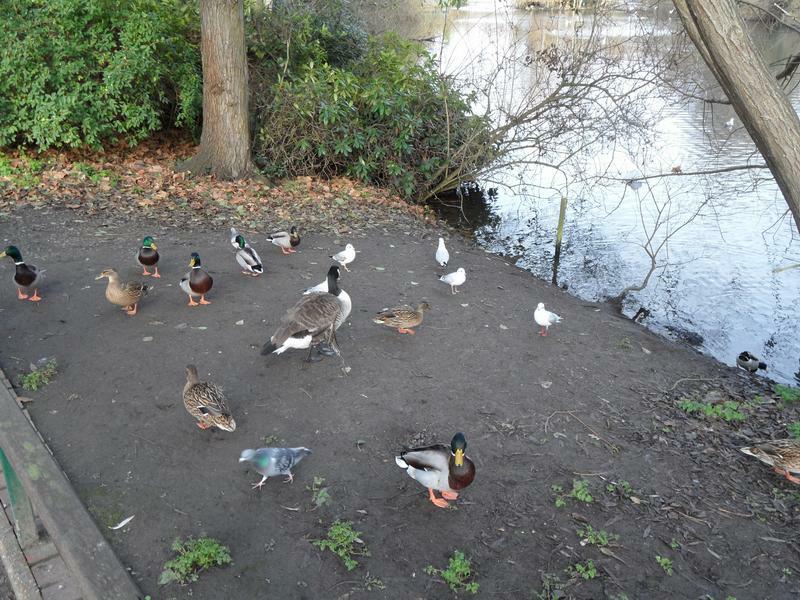 Some of the ducks are hungry. 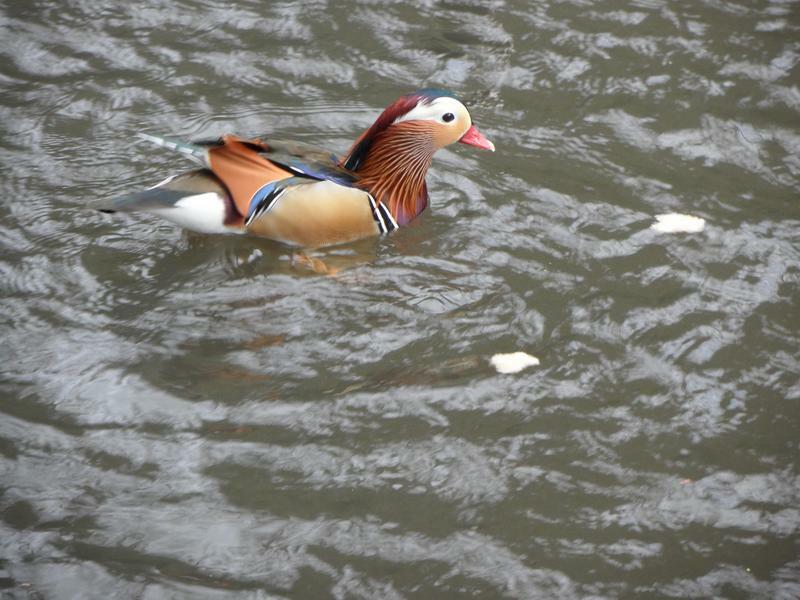 One of the colourful Mandarin Ducks on the upper pond. 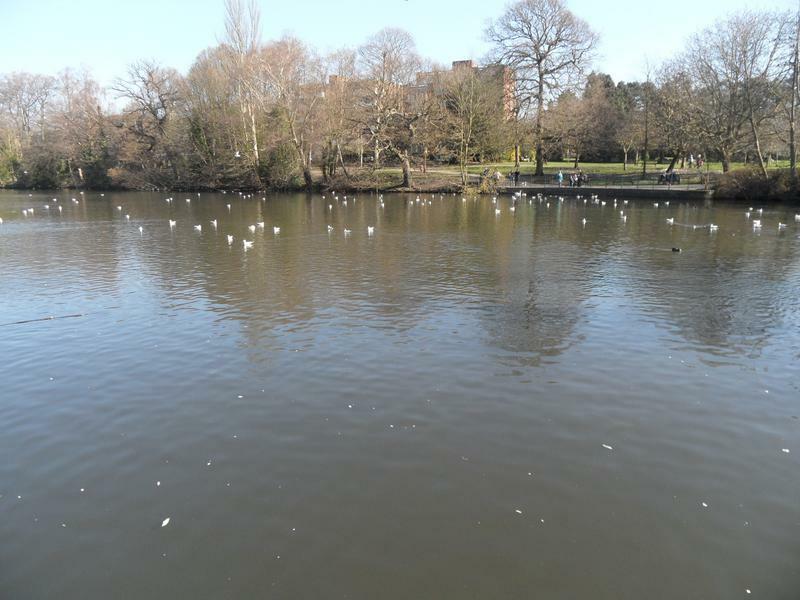 A lot of sea gulls on the main lake, few geese and ducks. 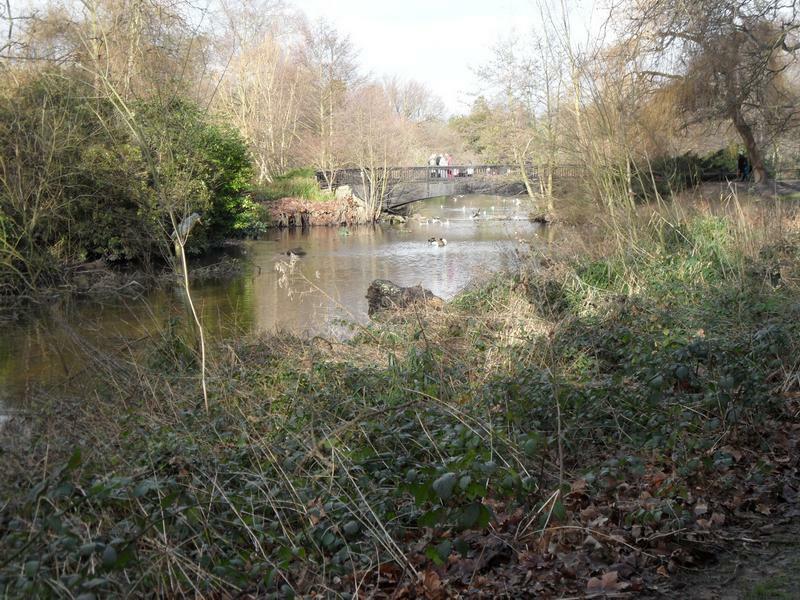 A lot of tree clearing during the winter gives a new view of the lower pond, just beyond the bridge. 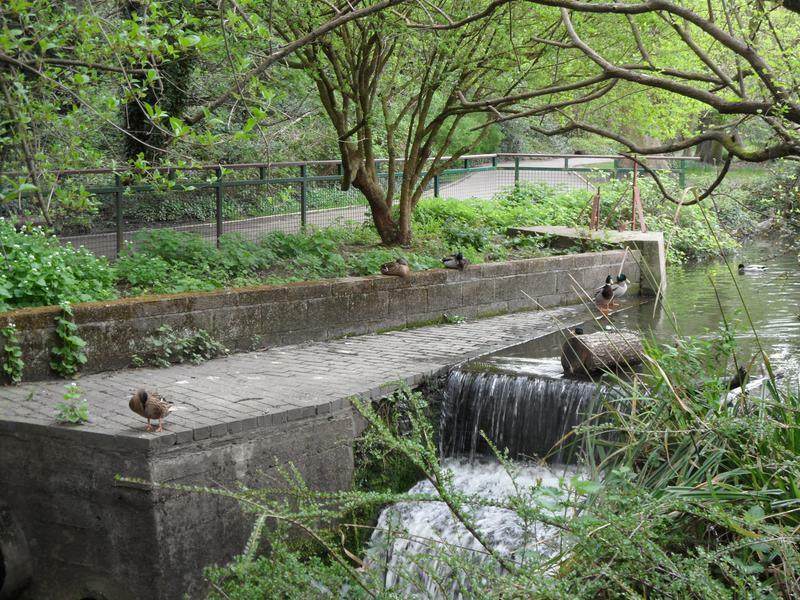 The bridge to the lower pond, a strong flow of water over the weir from heavy rain during the past six weeks. 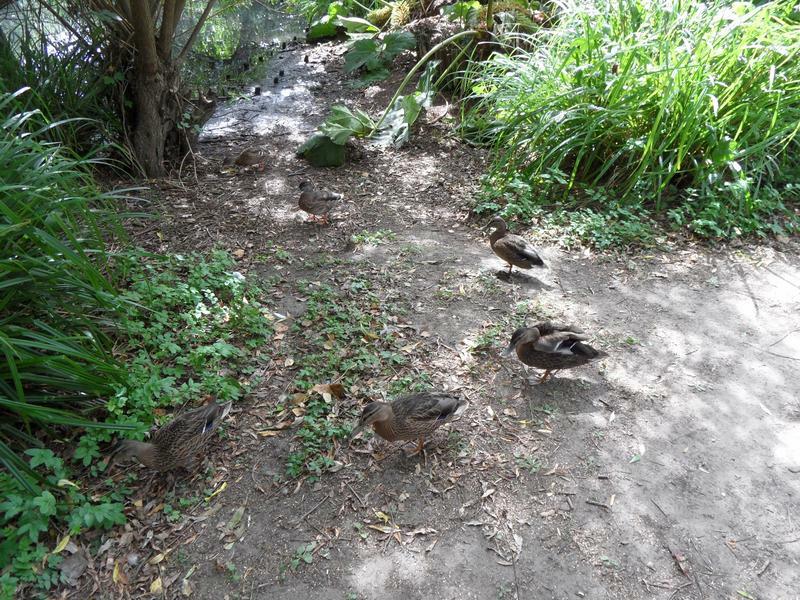 Several Mandarin Ducks on the stream entering the bottom of the park, three boys and a girl here. 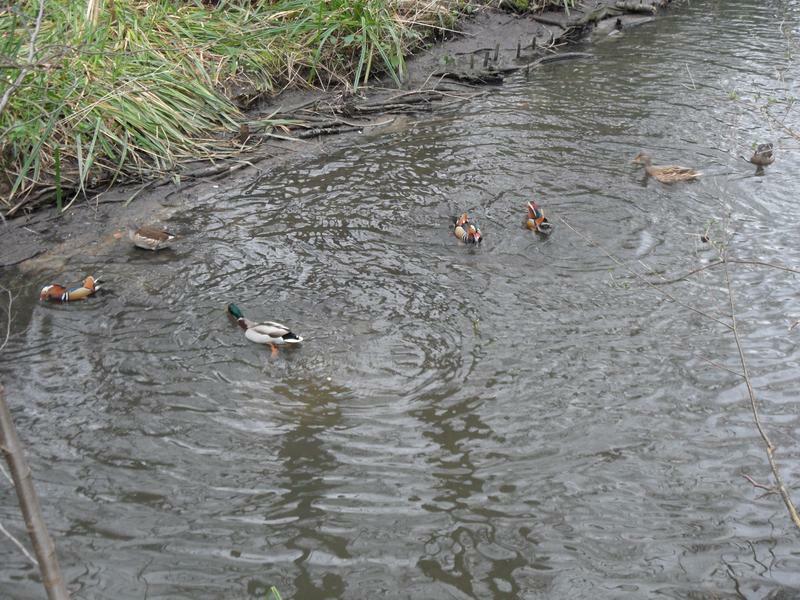 Six Mandarins on the stream, probably keeping away from all the other ducks and geese on the larger ponds and lake. 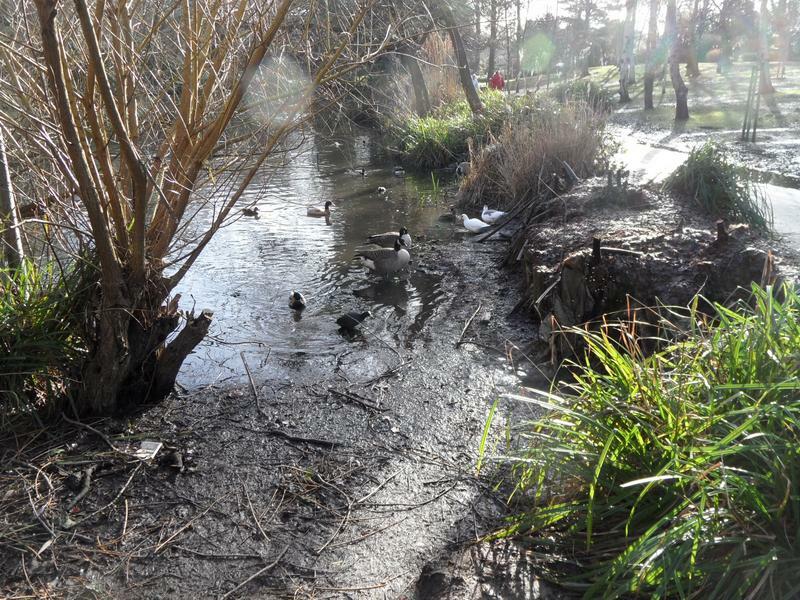 more than we normally get over an entire year (average 600mm). 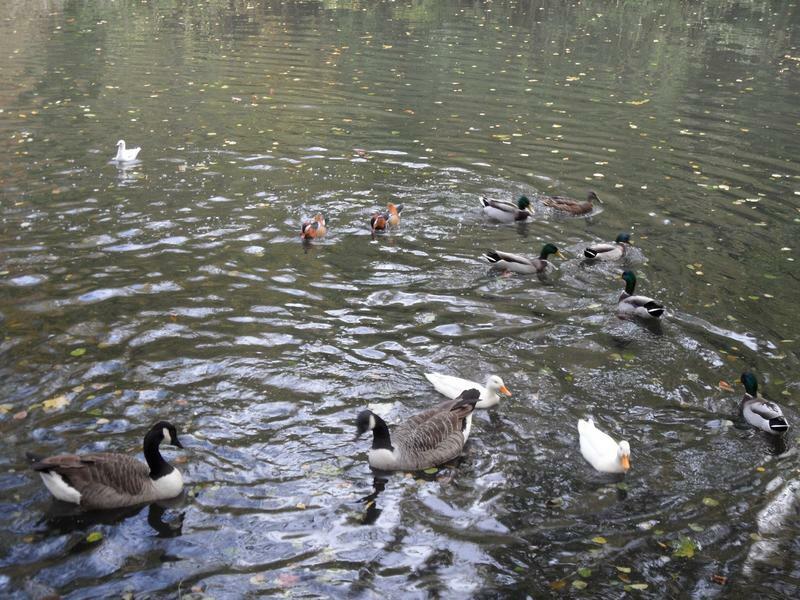 Hungry Mallards and Canada geese on the upper pond. 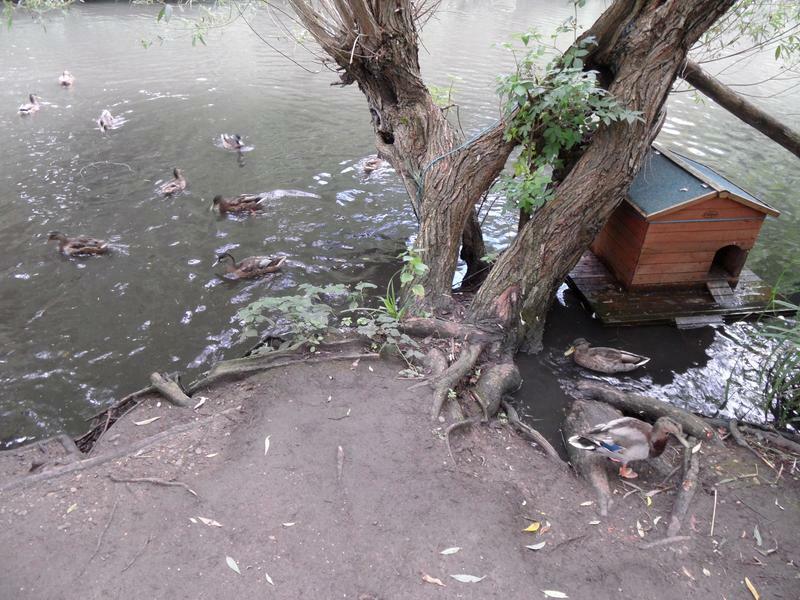 The Muscovy Ducks arriving for some food, with a Coot. 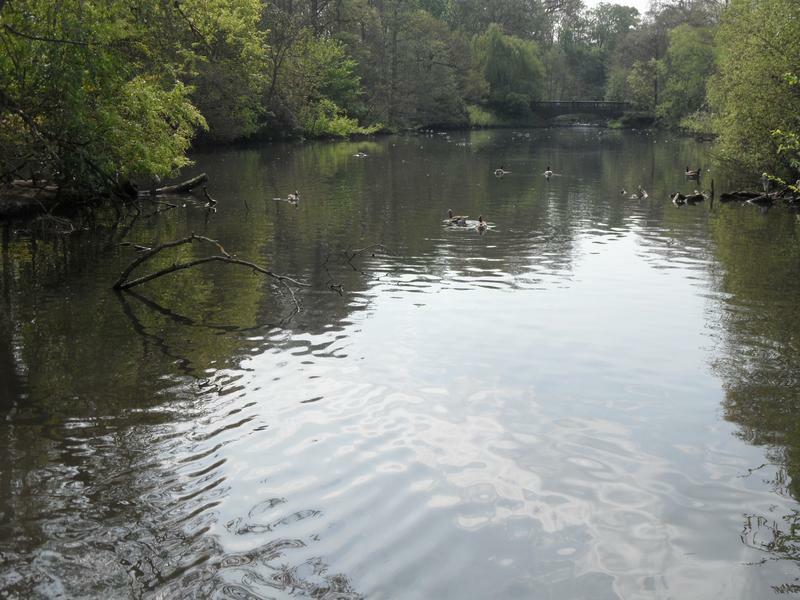 This lake seems very quiet. 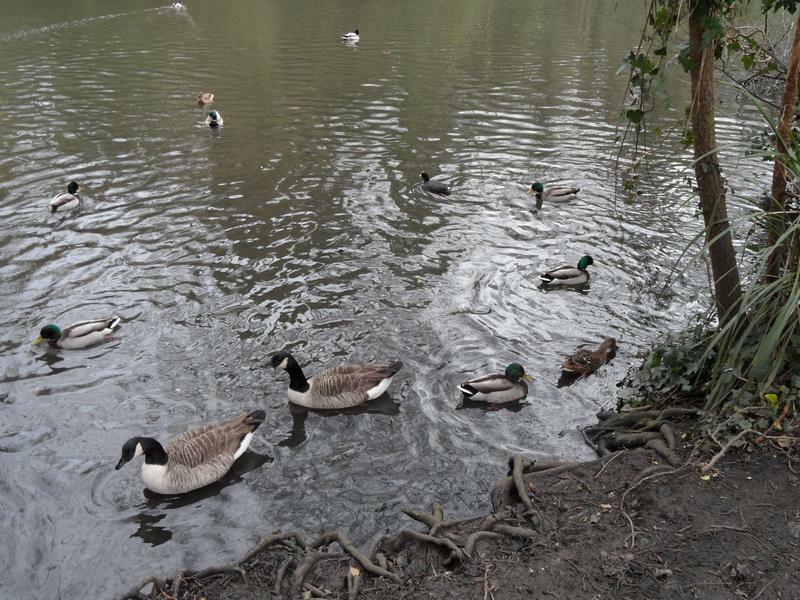 Although there are ducks and geese around the edges. 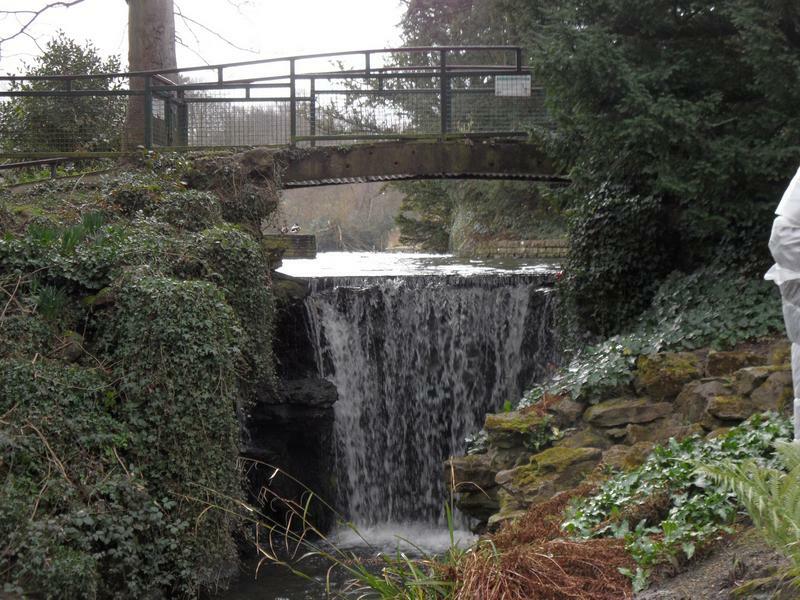 The long water fall in the middle of the park. 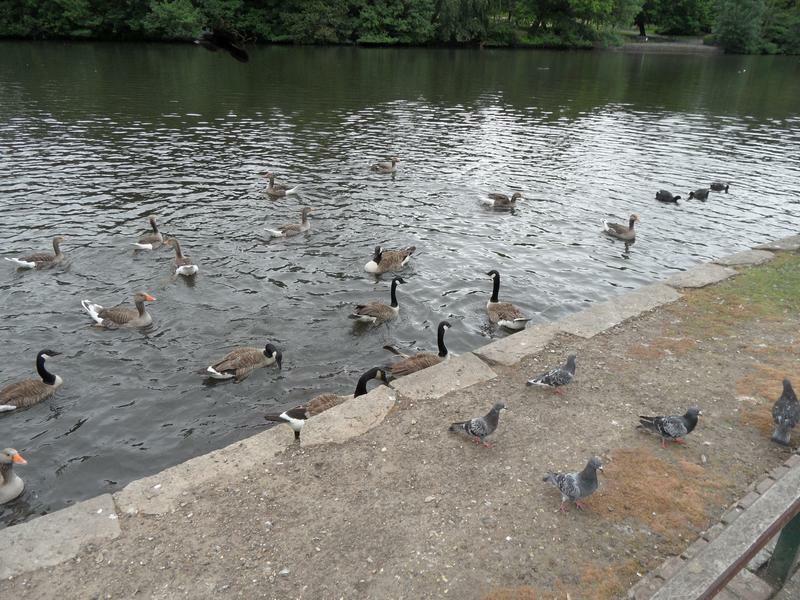 A lot of Canada Geese on the main lake. 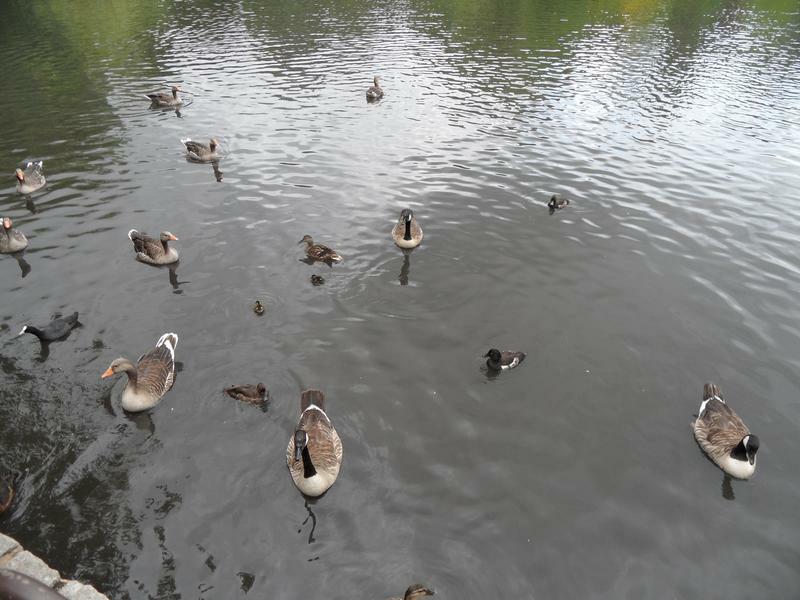 Also some Greylag Geese and a pair of Tufted Ducks. 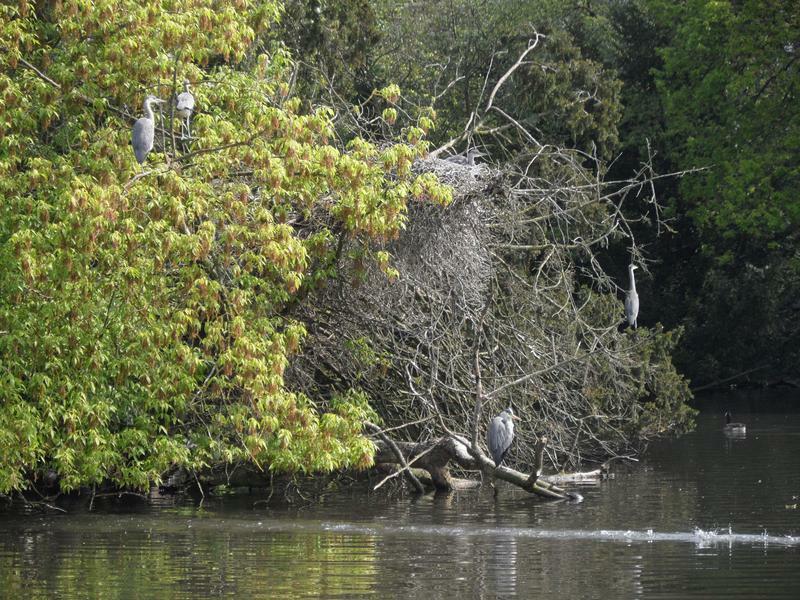 Heron Island in the middle of the lake has it's usual residents scanning the water for fish. 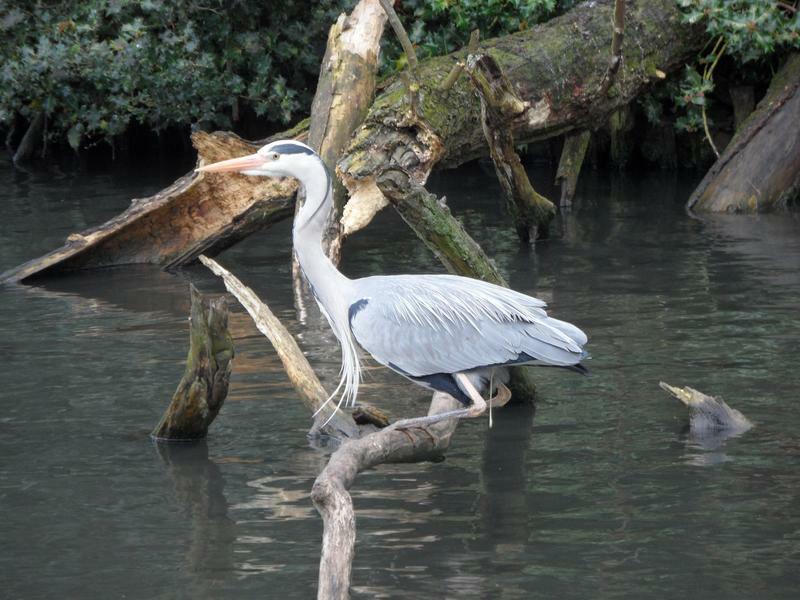 Another Heron looking for food. 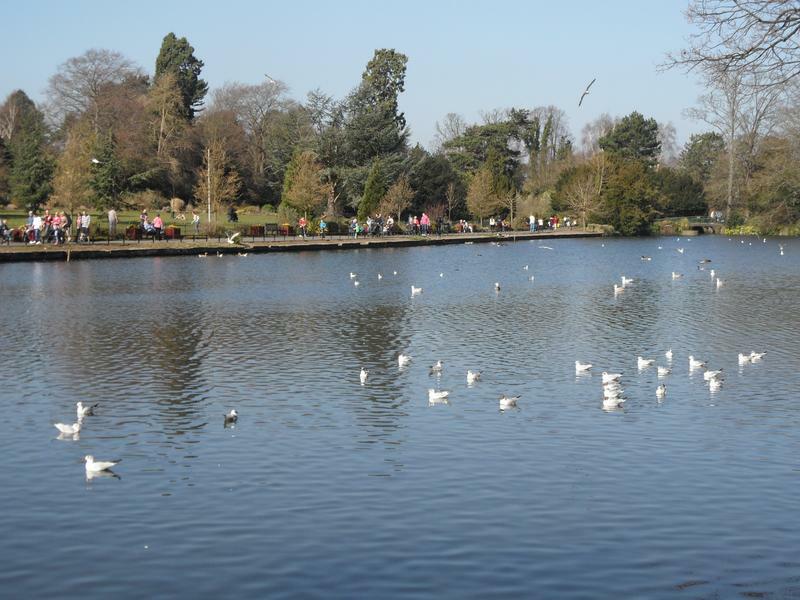 The smaller island near the bottom of the main lake. 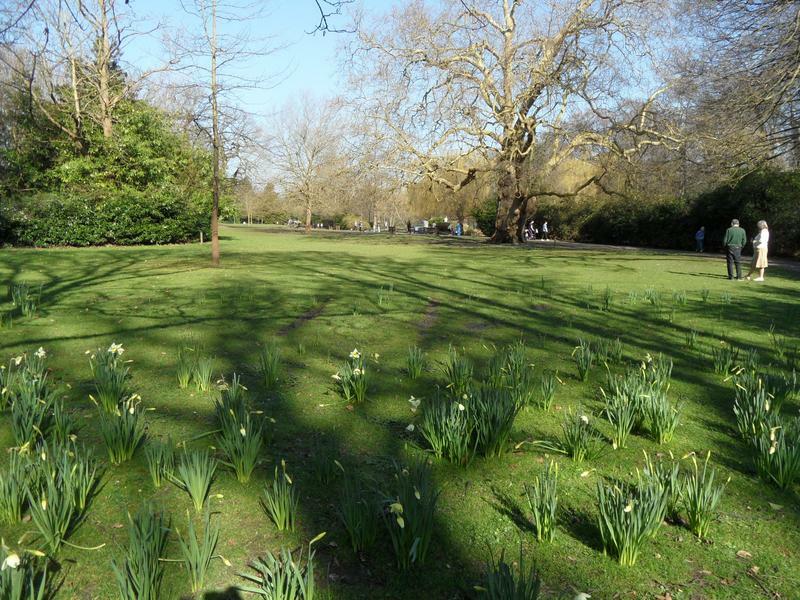 been moved to a new home in Wandsworth Common. 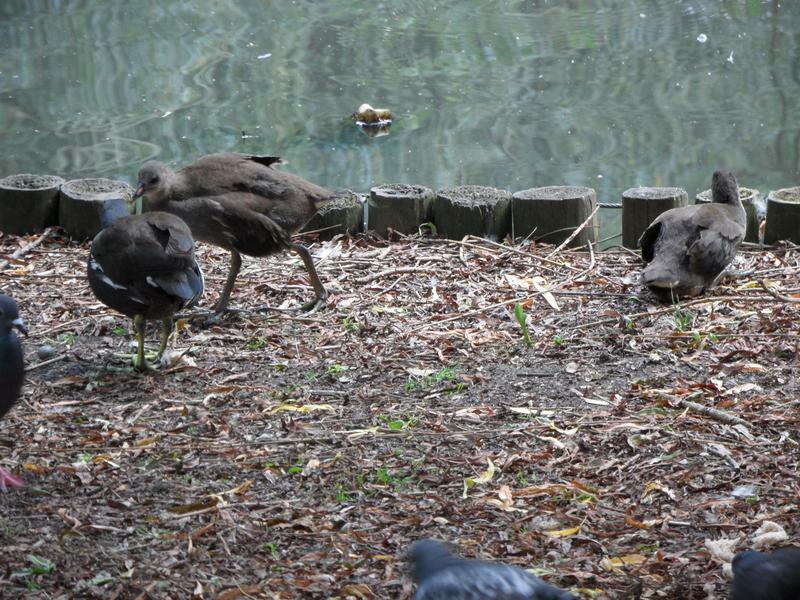 For some reason, a several Moorhens are scavenging around this lawn, away from the safely of the water. 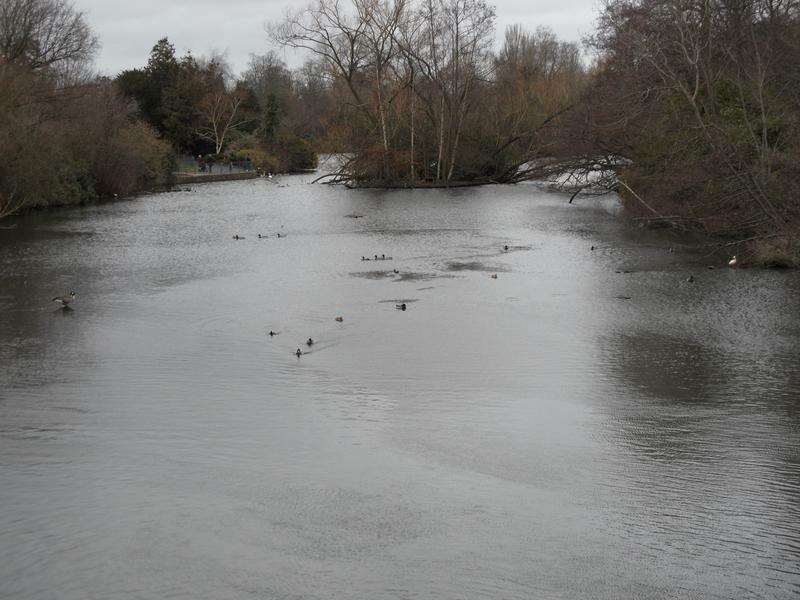 Several birds heading our way on the main lake looking for food. 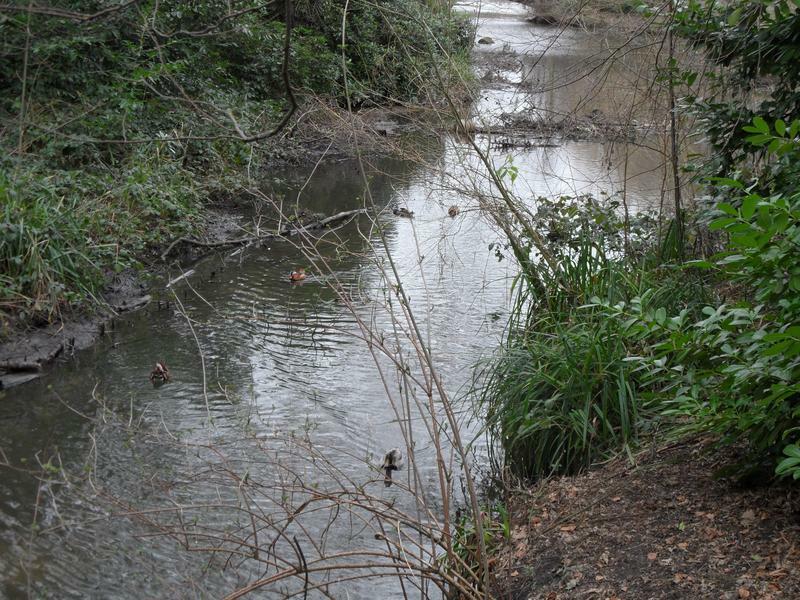 The Mandarin Ducks are still living on the bottom stream. 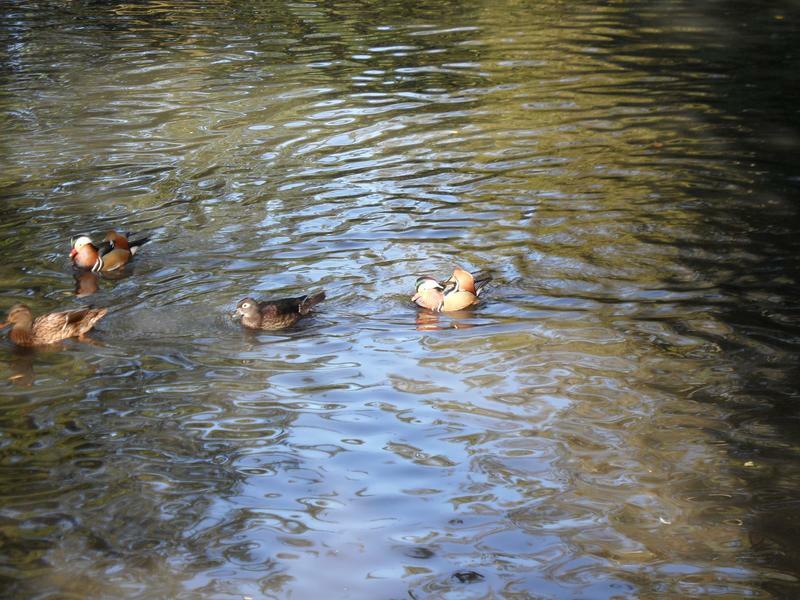 Two girl and three boy Mandarin ducks. 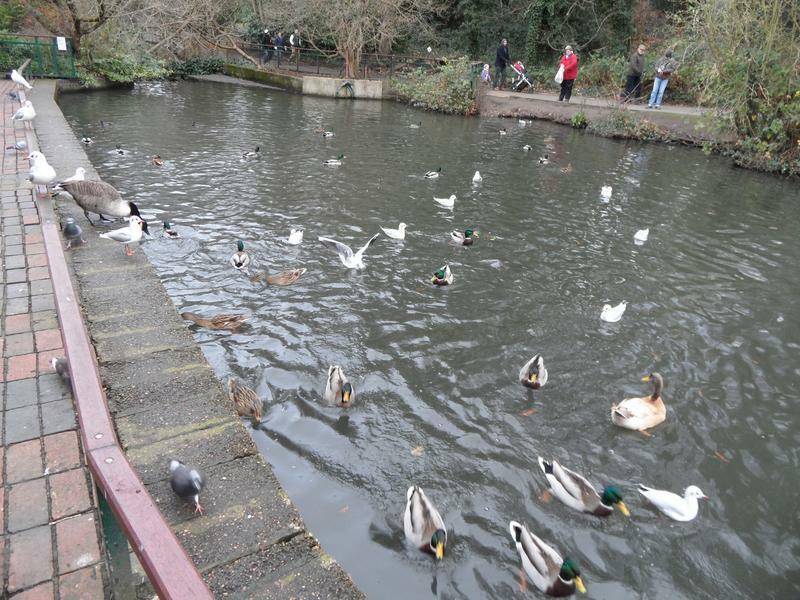 have eaten twice as much on the last two visits when the park was cold, wet and quiet. 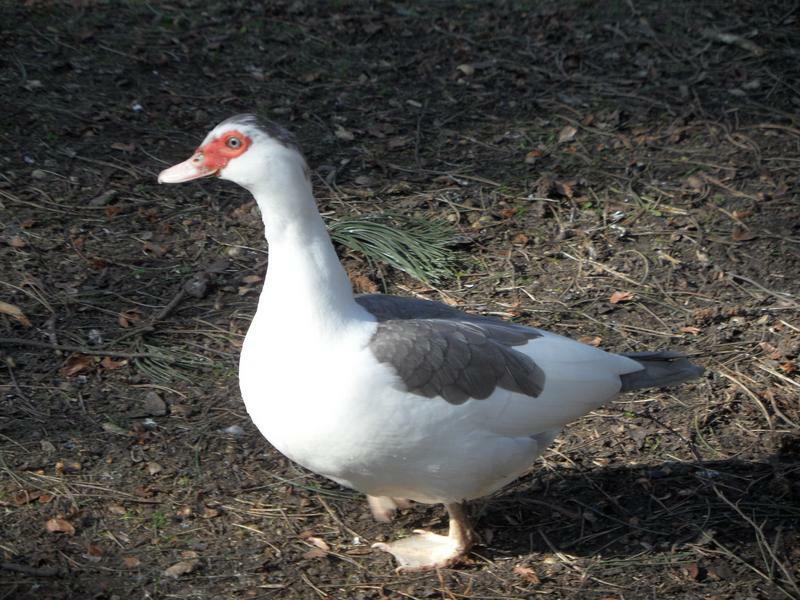 Only see one of the Muscovy Ducks today, on the grass, wonder where the other one has gone? 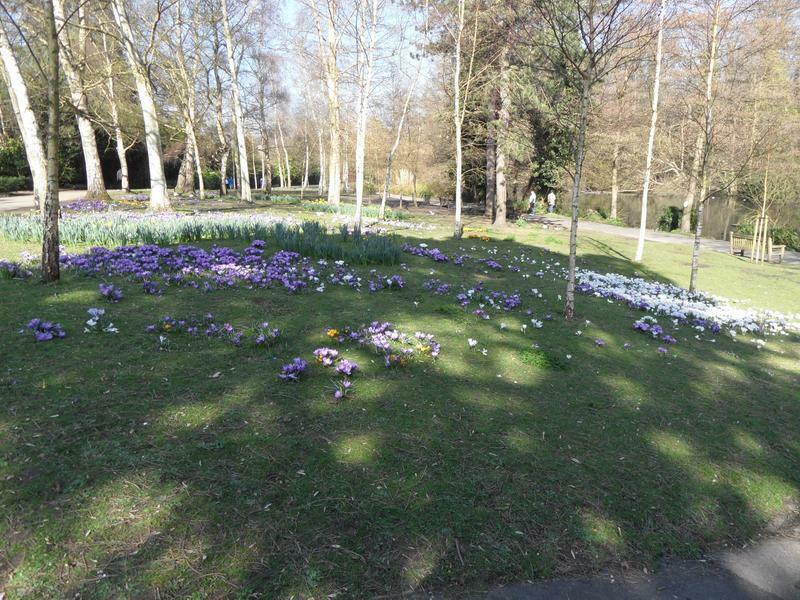 While very wet, winter was warm with no snow or real frosts, and spring flowers are early. 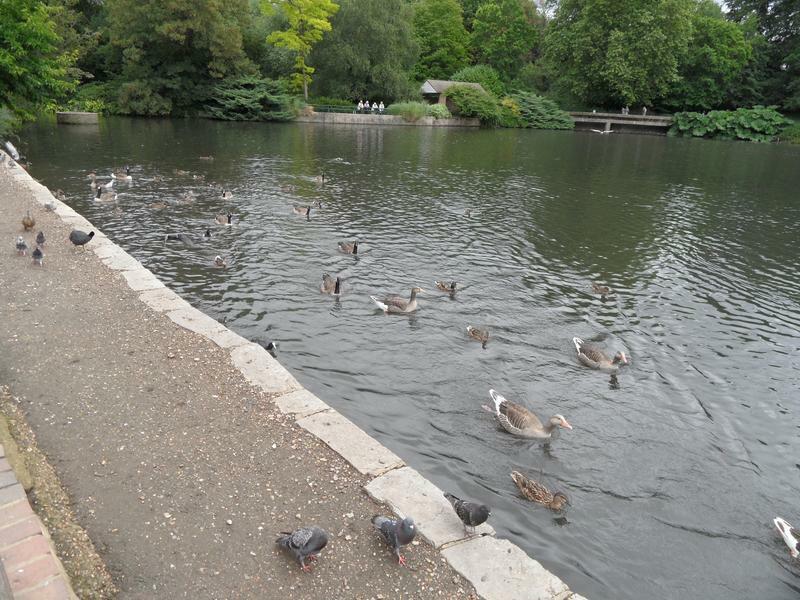 No birds waiting to be fed on the main lake. 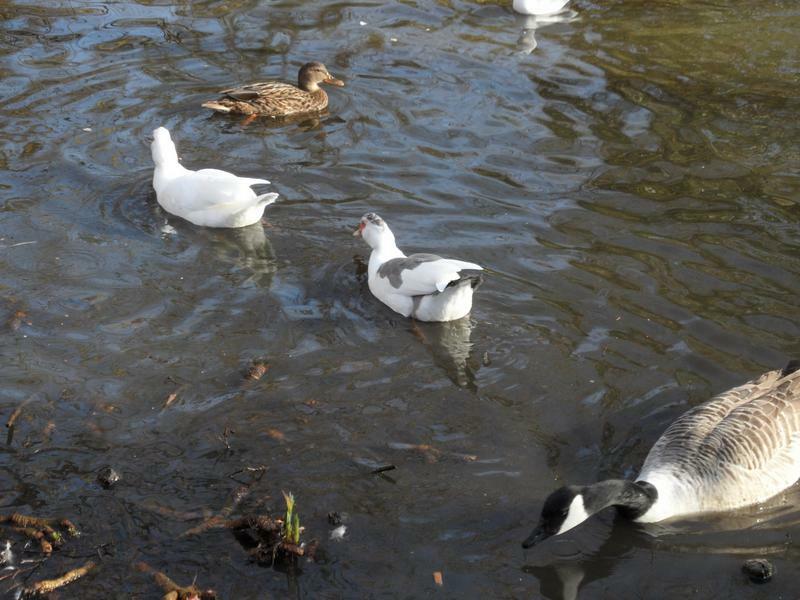 Most of the ducks and geese seem to be hiding around the lake edges, just sea gulls here. 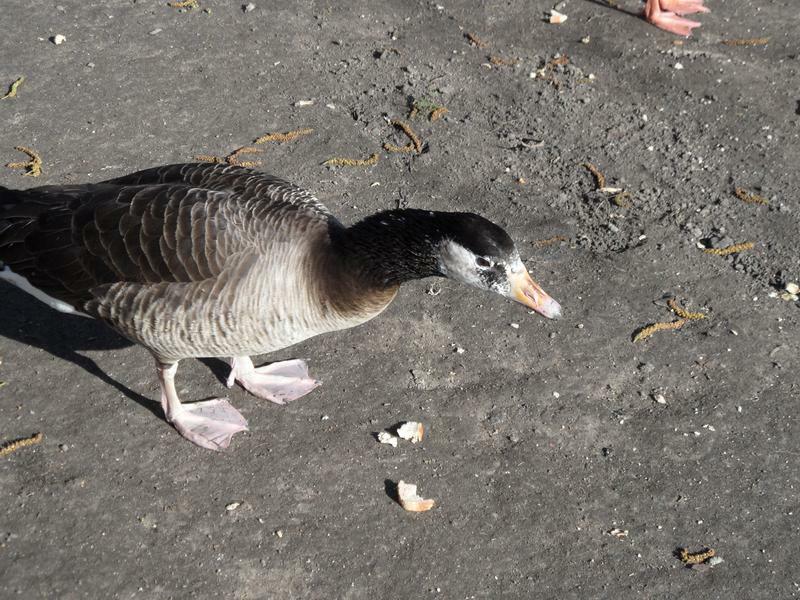 Graylag Goose at the back, not sure of this one, possibly a Barnacle Goose, very pale legs. 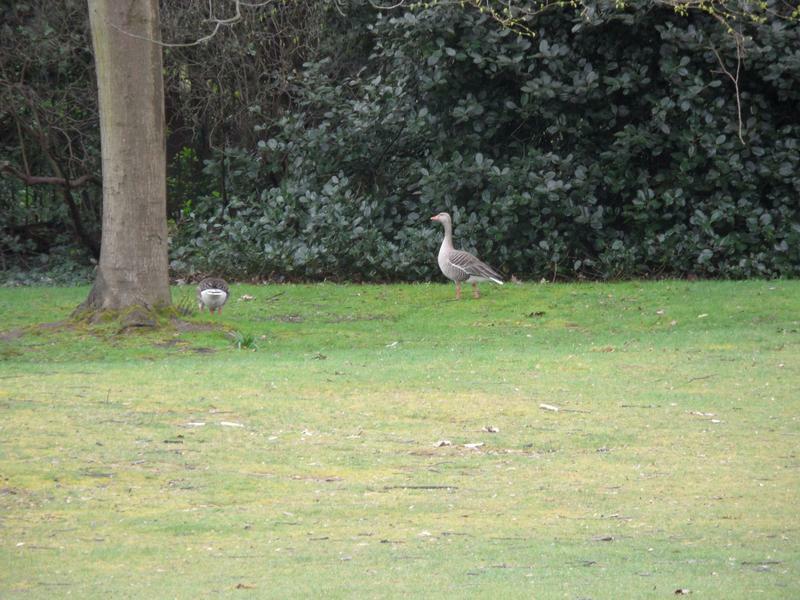 The possible Barnacle Goose again. 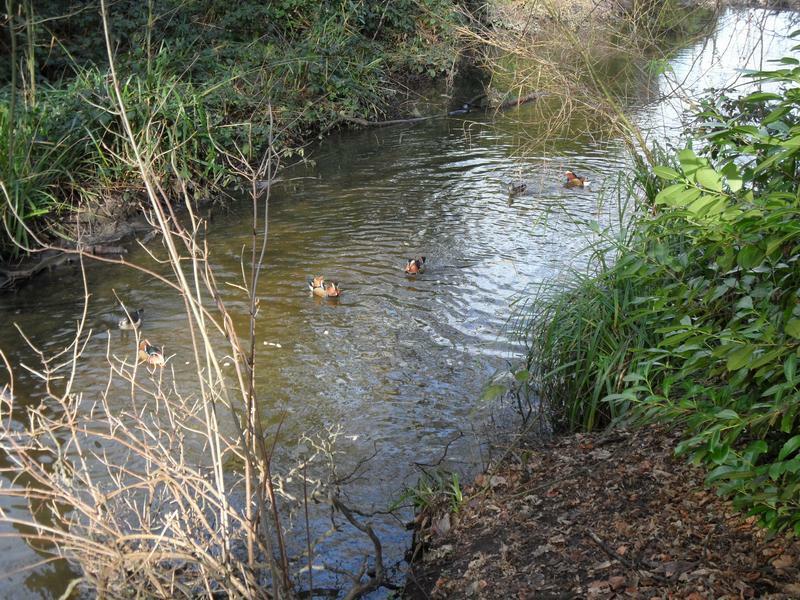 Mandarin Ducks on the lower stream. 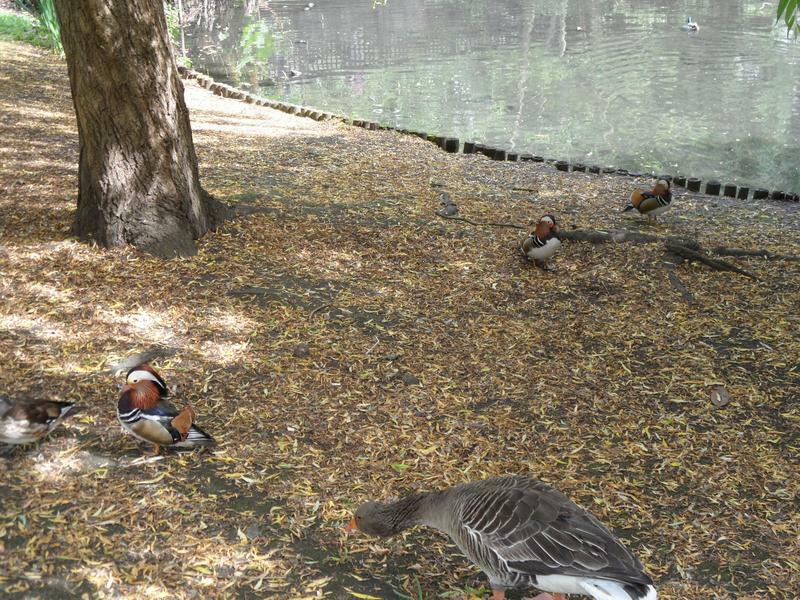 At least the Mandarins seem hungry today. 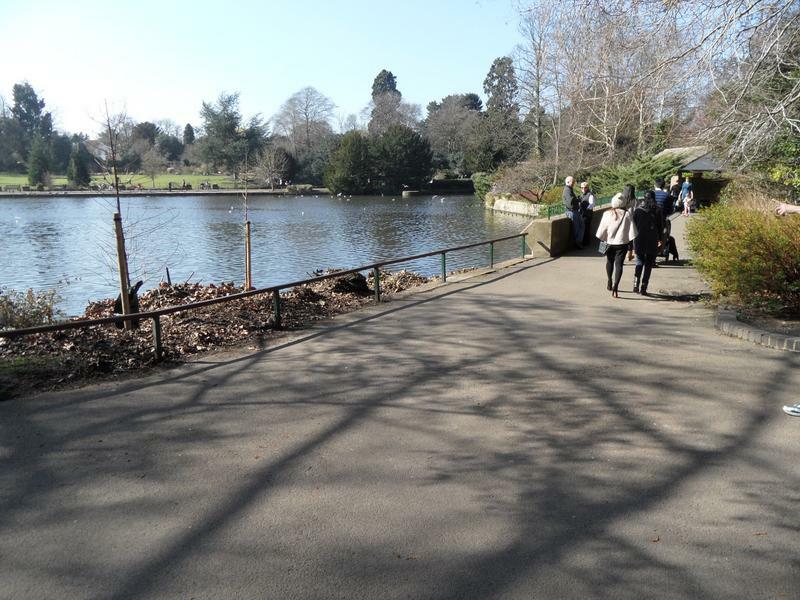 The park paths are very busy today, everyone enjoying the sun. 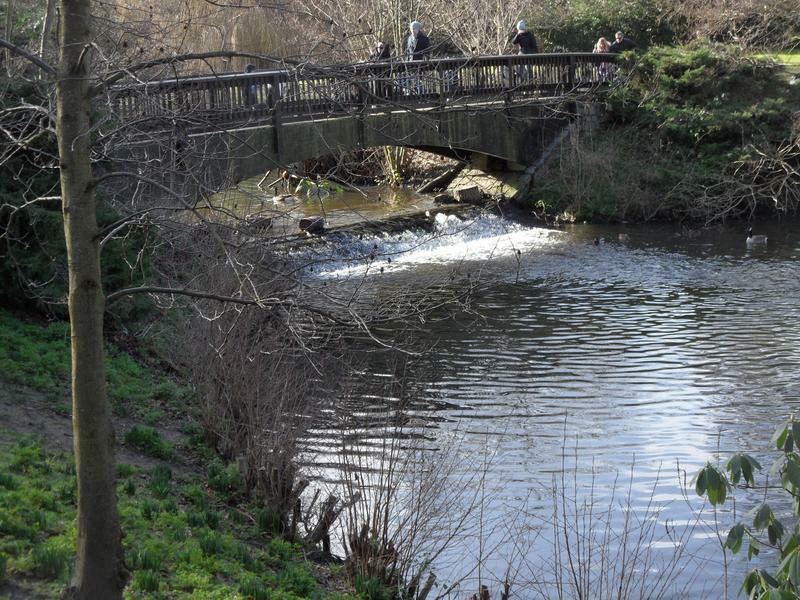 The stream entering the bottom of the park. 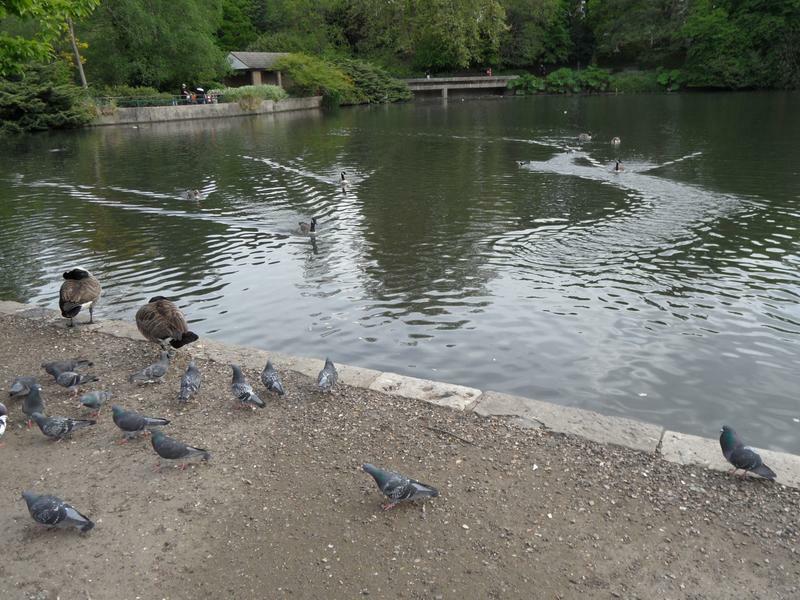 The lower pond, the large bird is concrete. 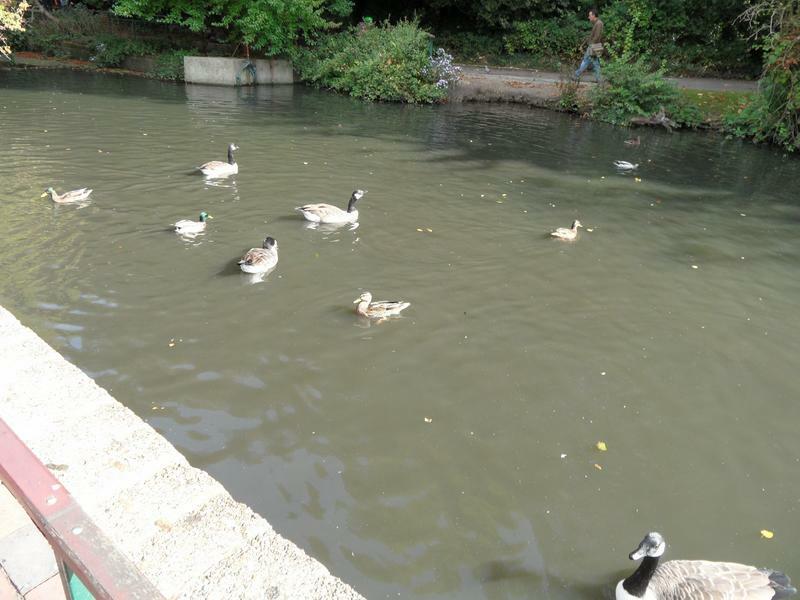 Again few birds looking for food. 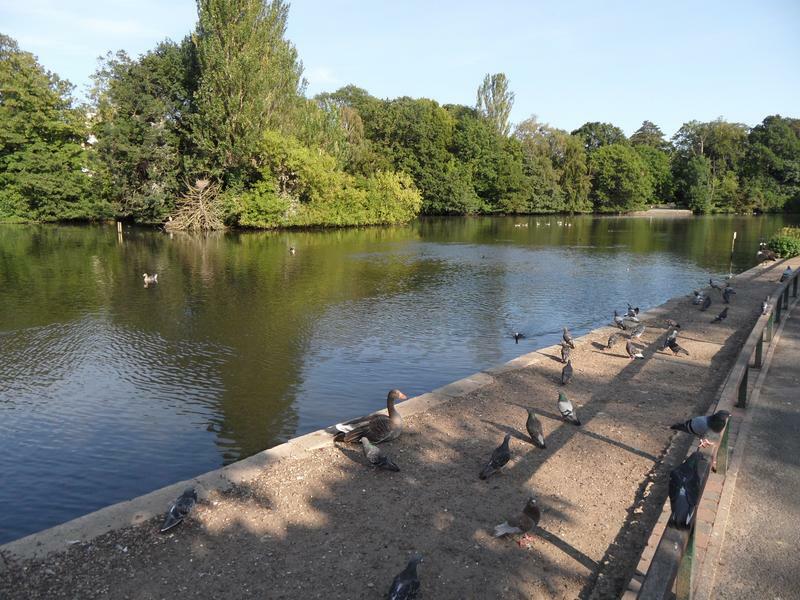 Even the sea birds have gone. 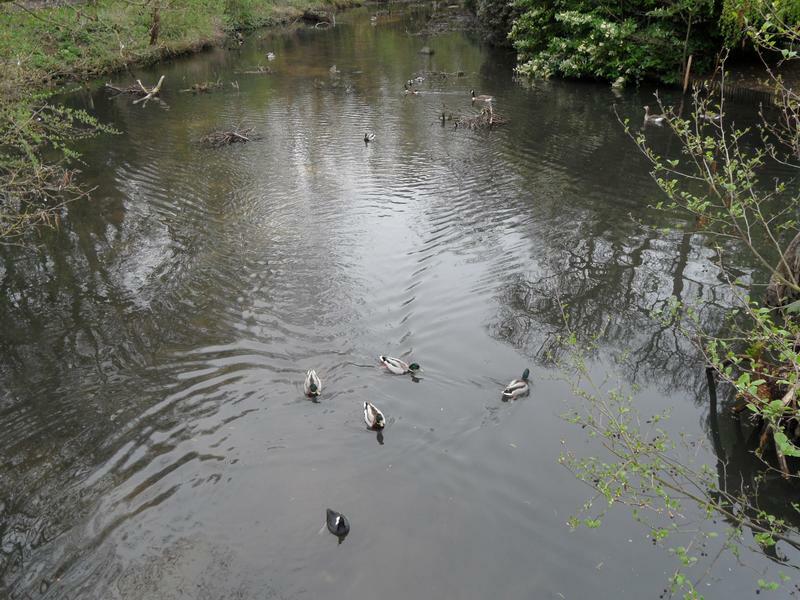 6th April 2014, the upper pond is very quiet, no geese and just a few Mallards. 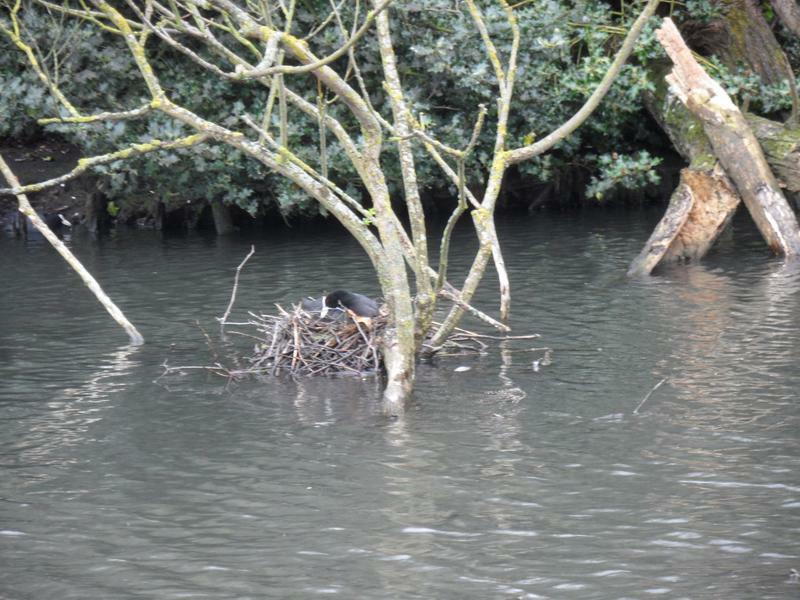 The first of several Coot nests in the park. 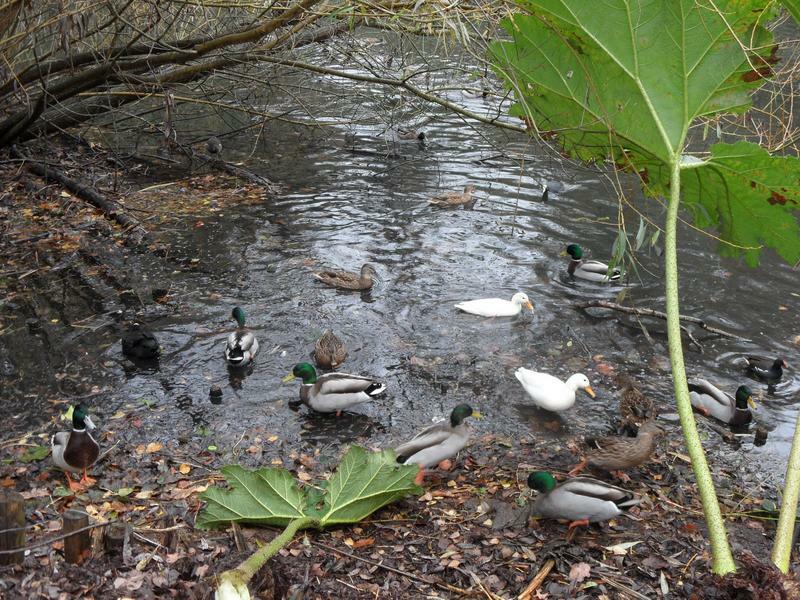 A little more activity on the next pond. 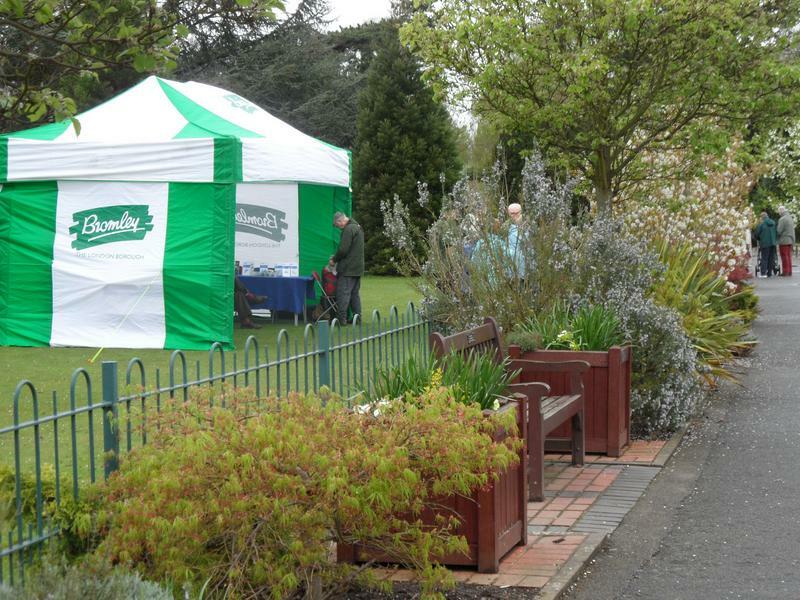 Wonderful display by the main park entrance and visitor's centre. 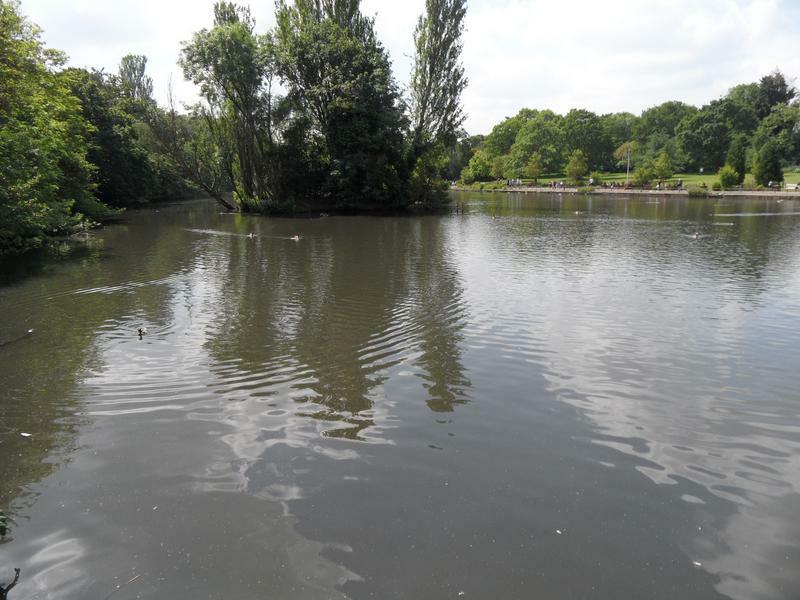 Even the main lake is quiet, heron island in the distance. 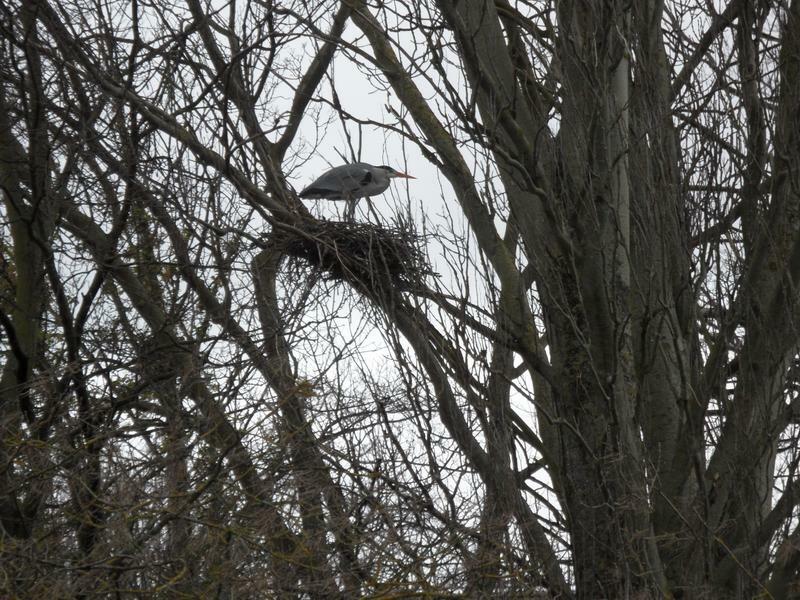 Several herons nesting on the island. 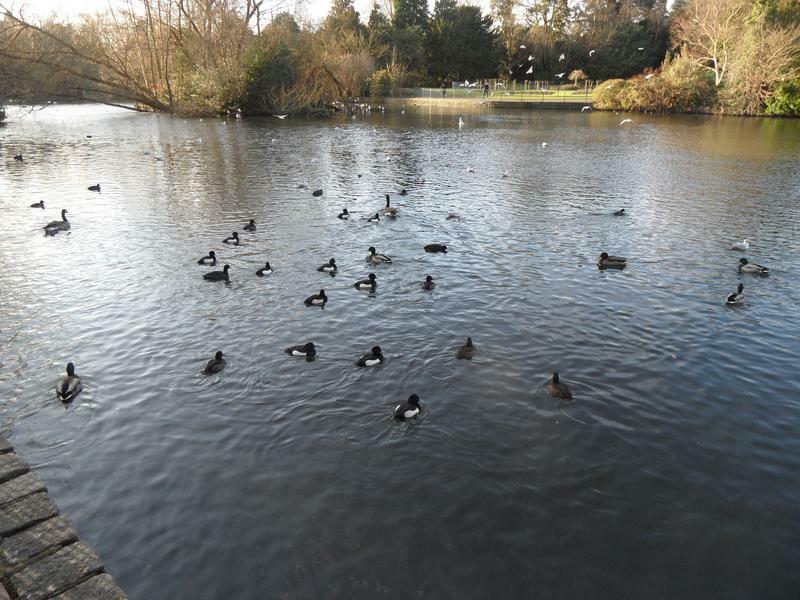 A few Tufted Ducks arrive. 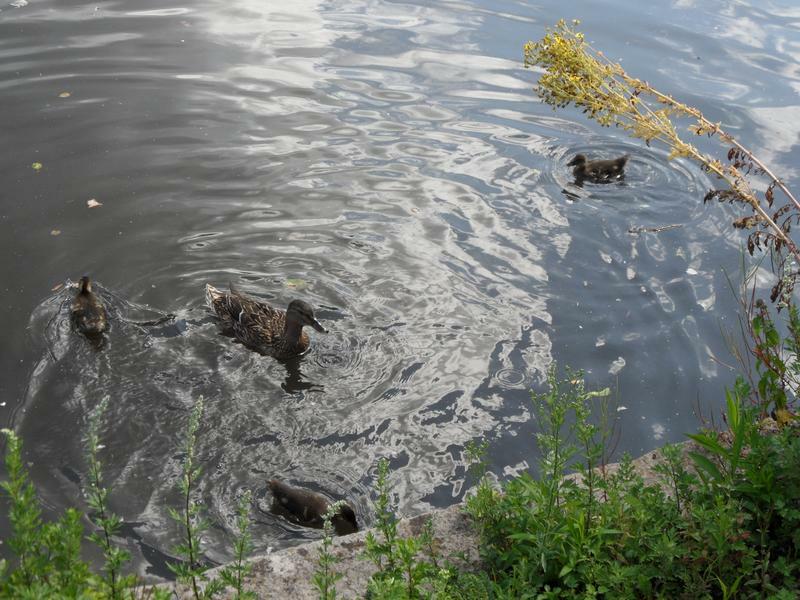 Sufficiently hungry to jump out of the water looking for more food. 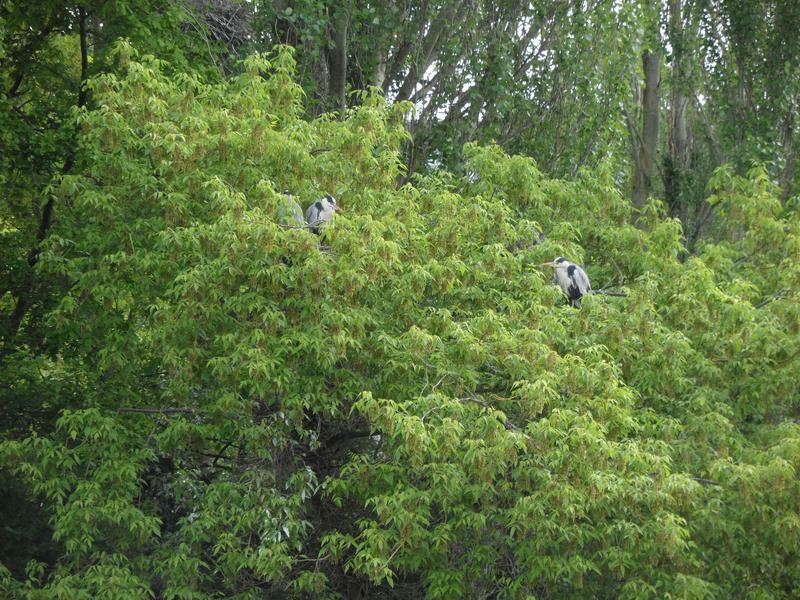 It's heron watch day, experts on hand with large binoculars to watch the 20 or so heron nests on the island, apparently with about 30 chicks. 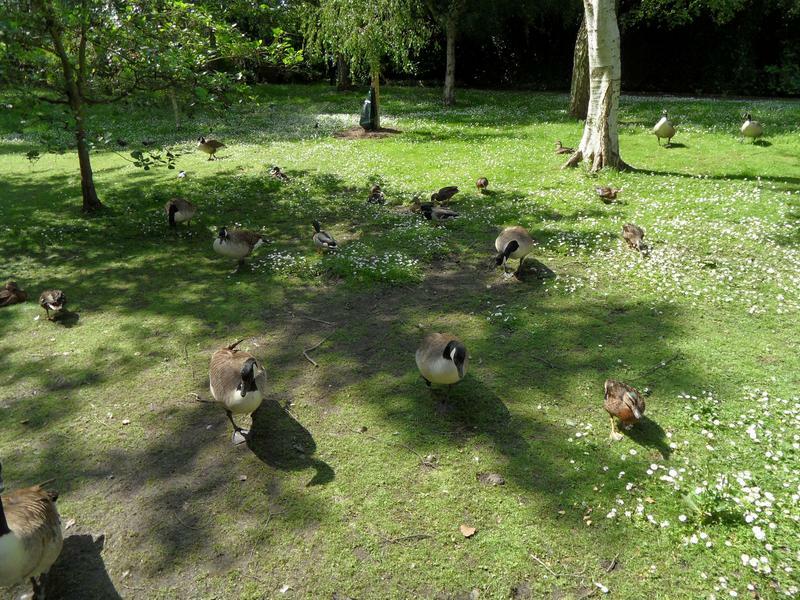 The geese tend to take up residence on the lawns of the west side of the park, for breeding. 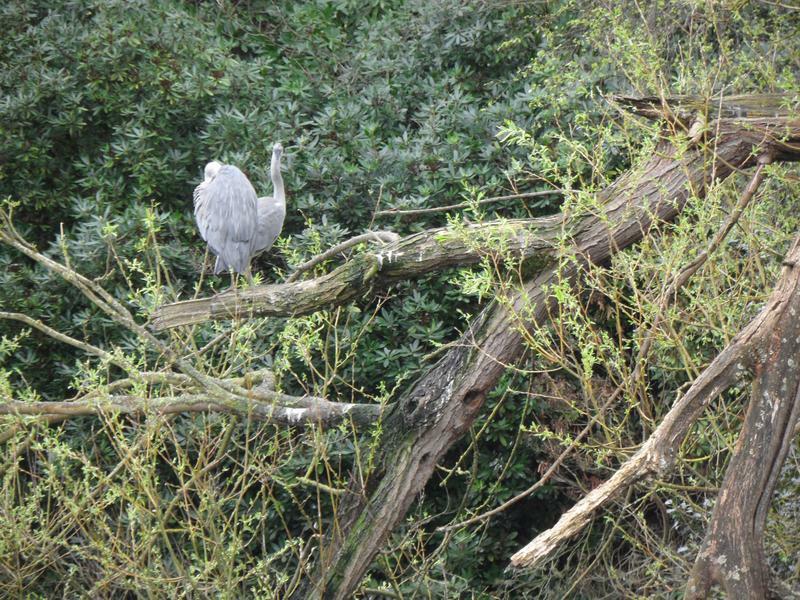 More herons on the island. 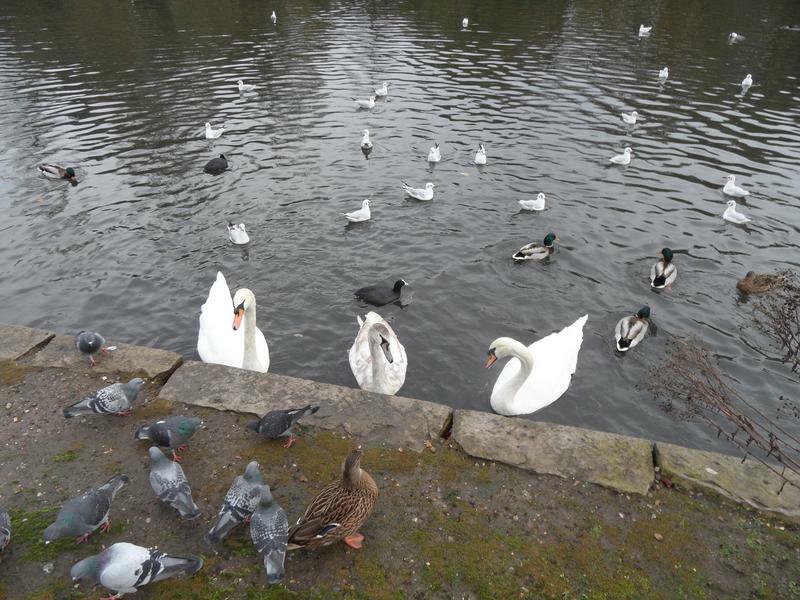 Few people feeding today from the cafe side of the lake, so many birds heading my way instead. 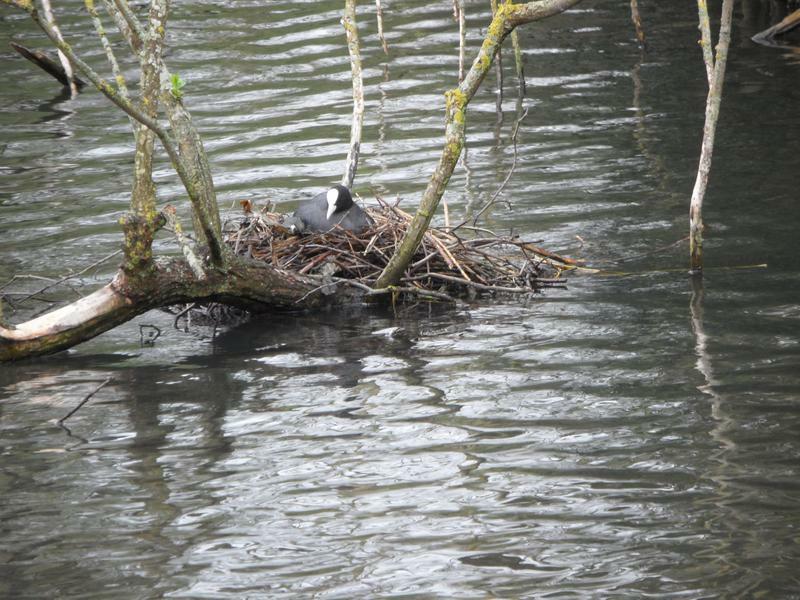 Yet another Coot nest on the main lake. 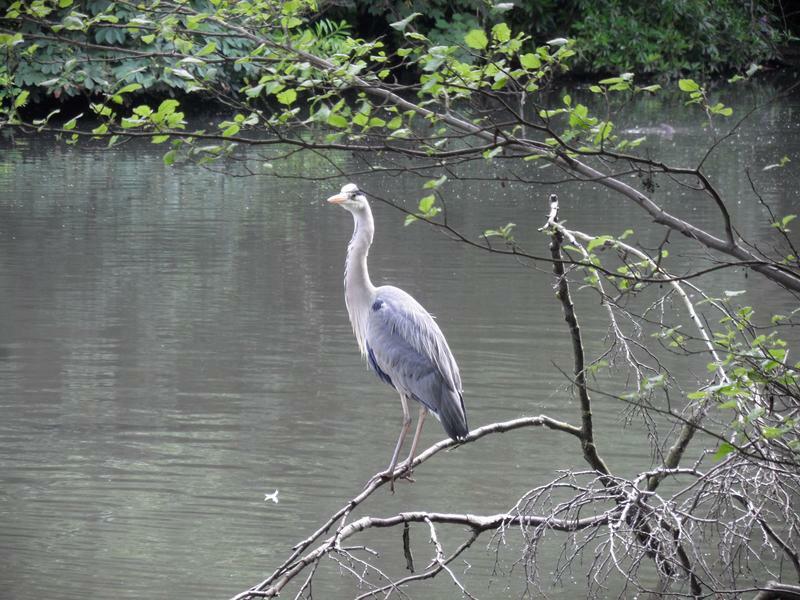 A heron looking for fish. 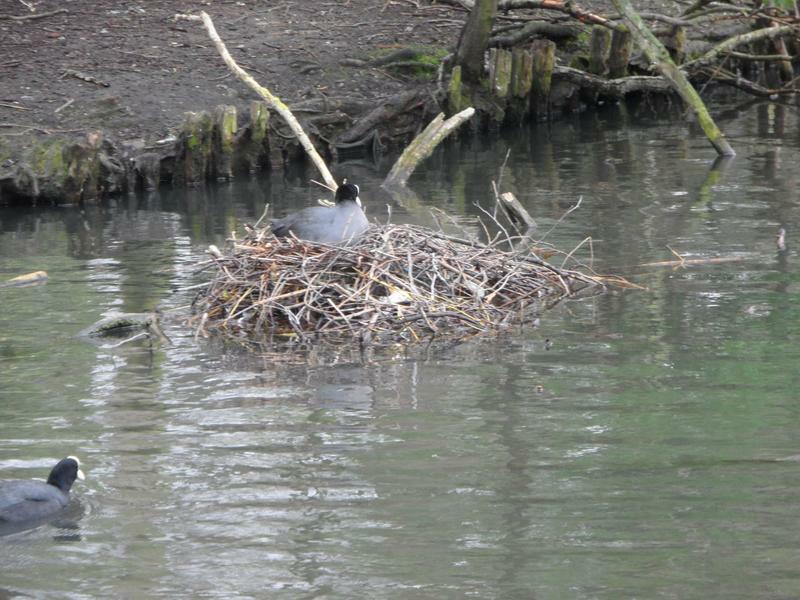 Another Coot nest on the bottom pond. 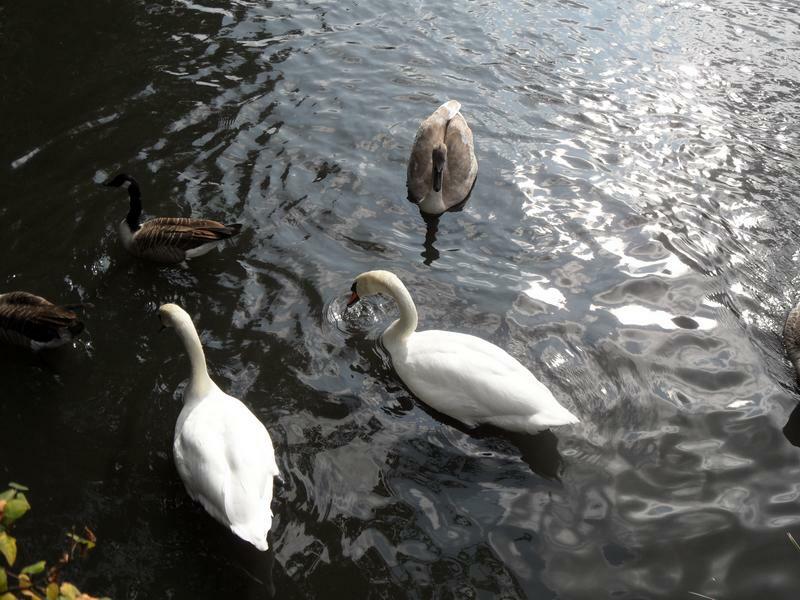 One of the swans is getting aggressive. 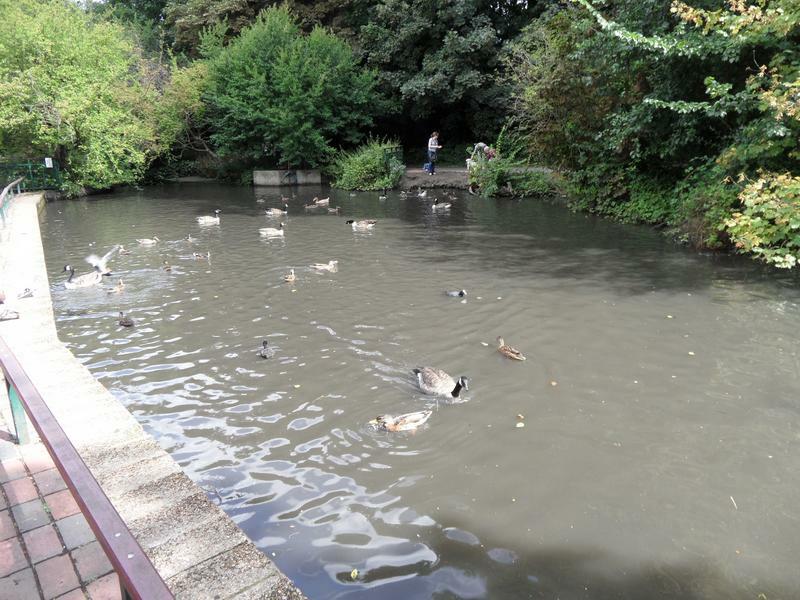 The Egyptian Geese on the bottom pond. 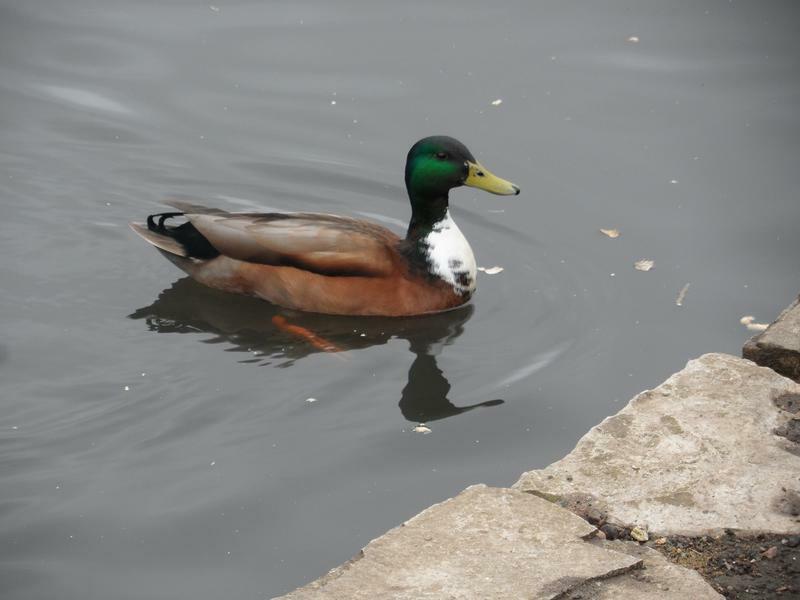 Relatively quiet on the bottom pond today, mostly Mallards. 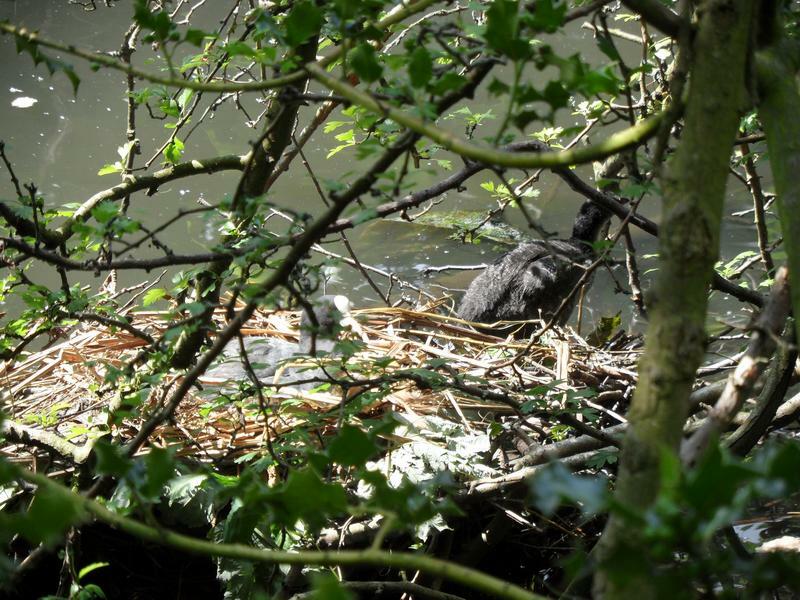 The last Coot nest on the bottom pond, with two Greylag geese. 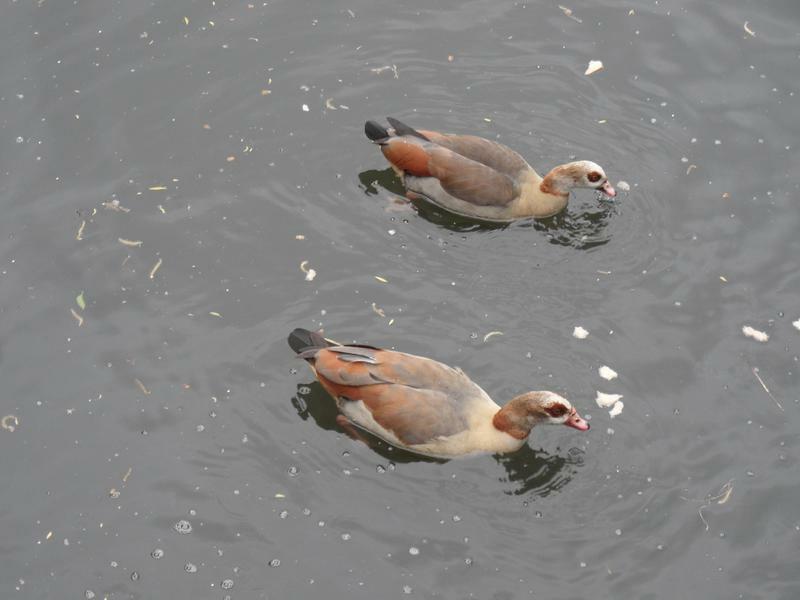 The Egyptian Geese are now out of the water, so a closer look. 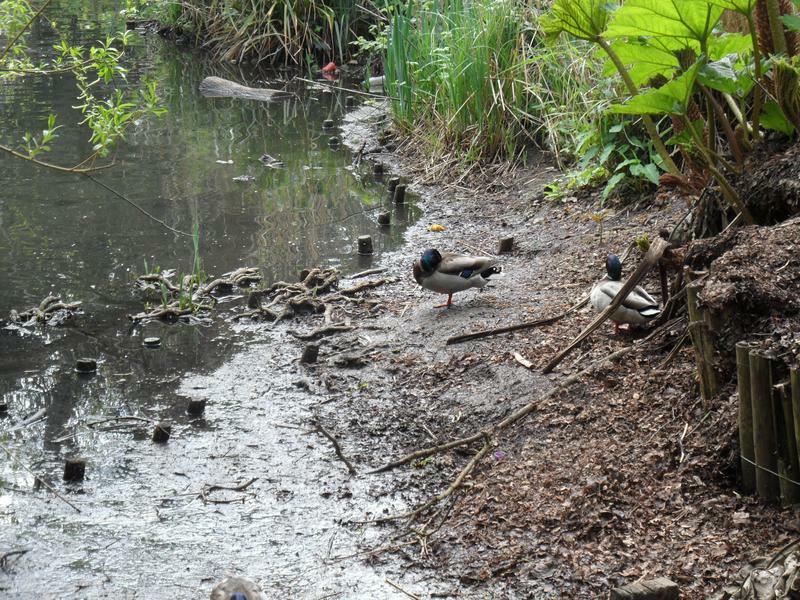 There always seem to be Mandarin ducks at the bottom of the park. 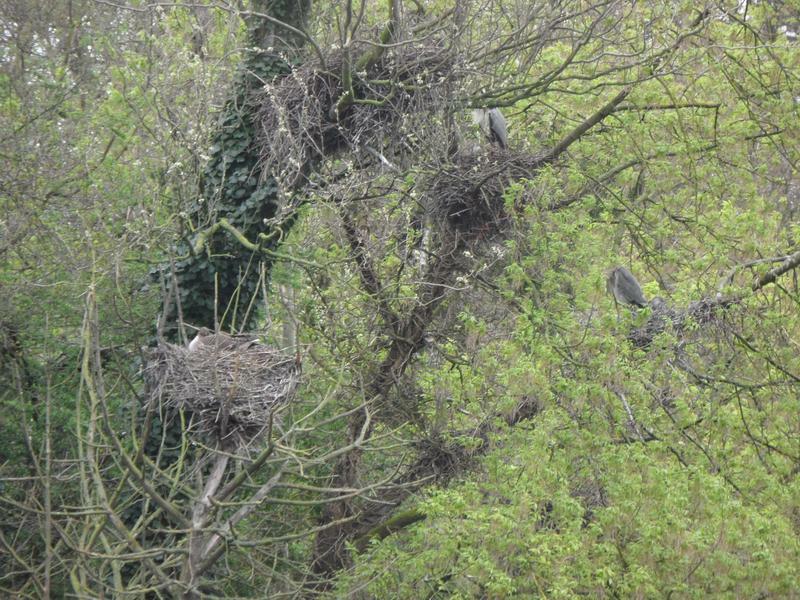 Several more massive heron nests on Heron Island, most with chicks. 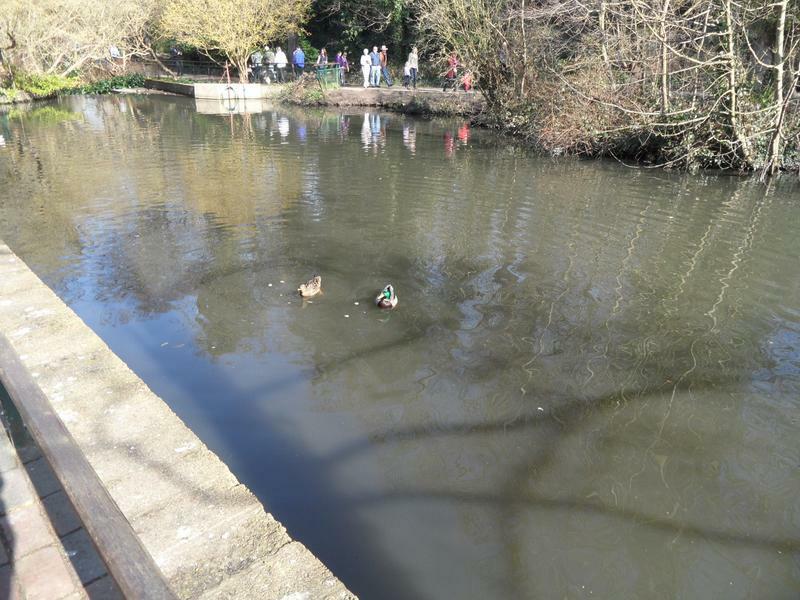 11th April 2014, several Mallards sitting above the waterfall and dam containing water in the upper lake. 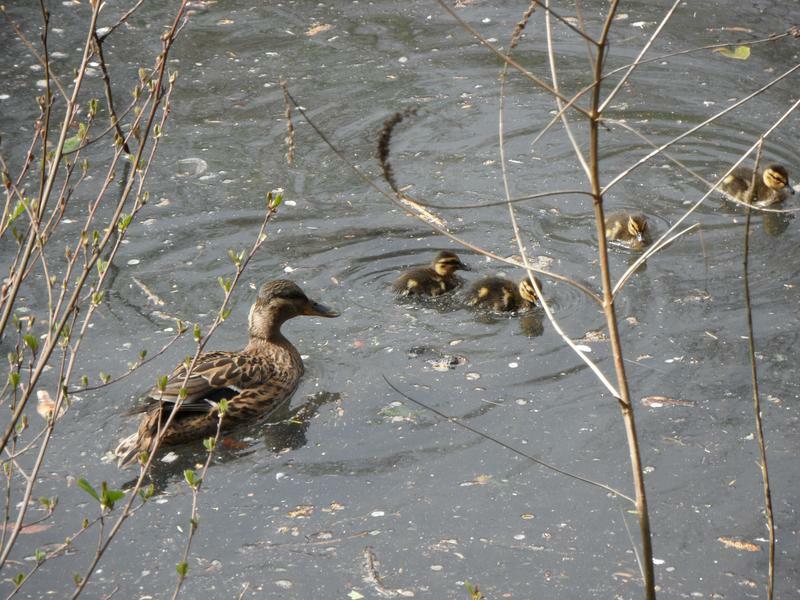 The first Mallard ducklings of the year, just three with the parents, too few, but so many heron predators here. 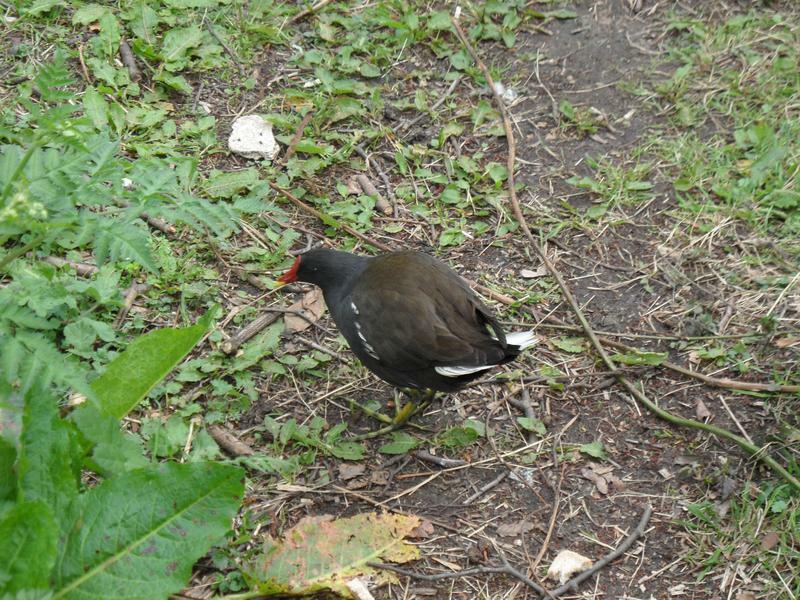 A Moorhen on the path ahead of me. 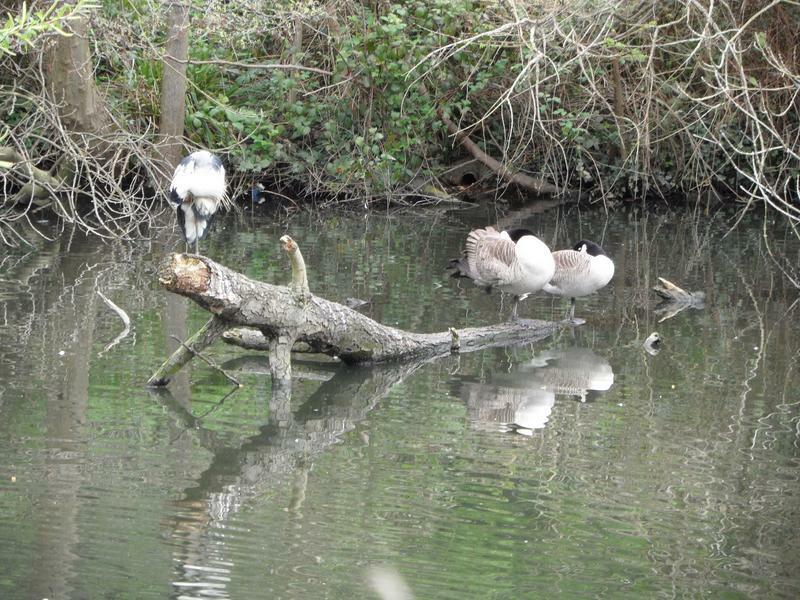 A sleeping heron and geese. 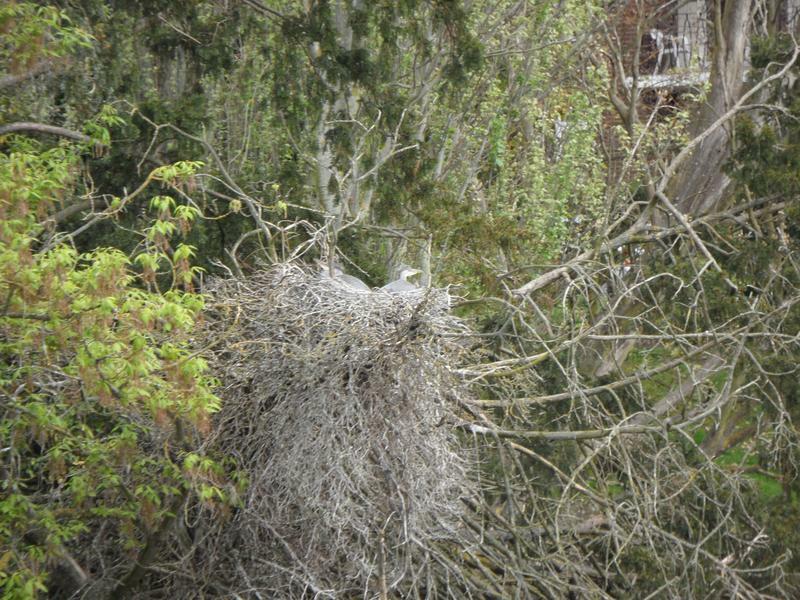 At least two herons in this massive nest. 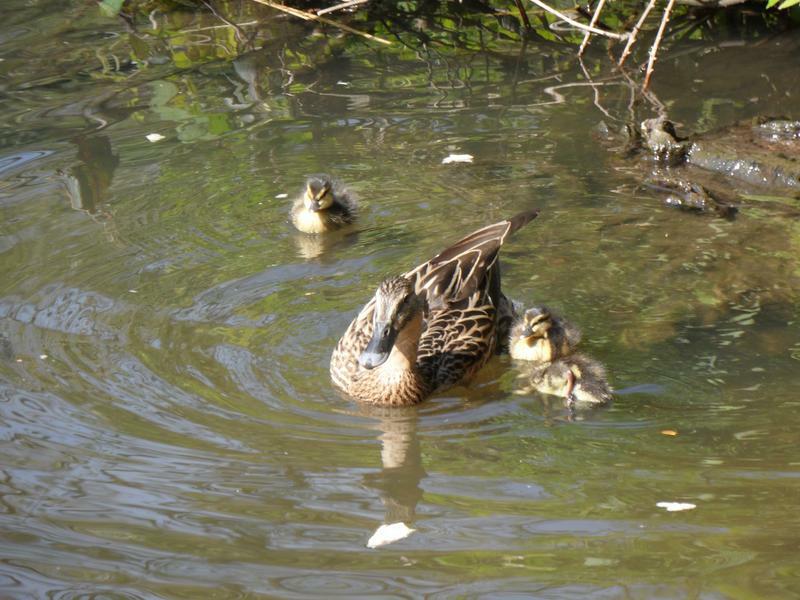 A second Mallard family at the other end of the park, four ducklings this time, less than a week old. 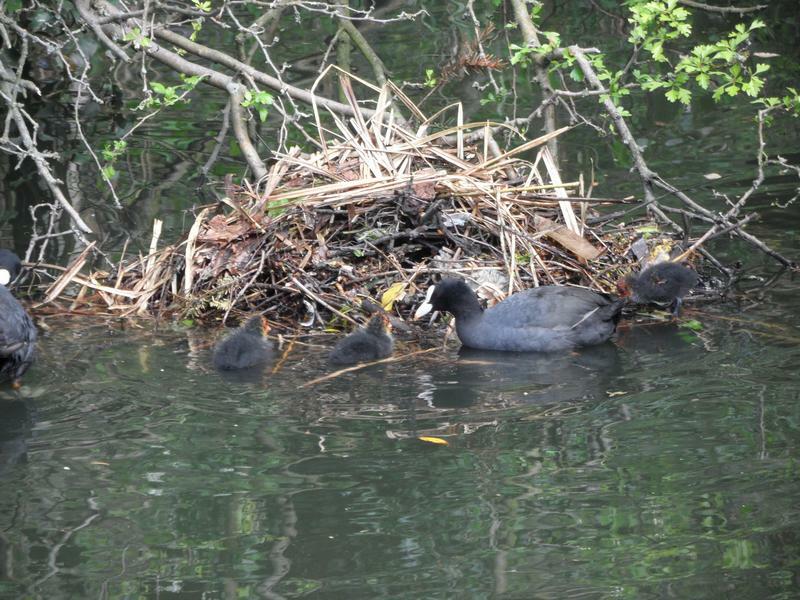 A Coot family hiding under branches, some protection from the herons. 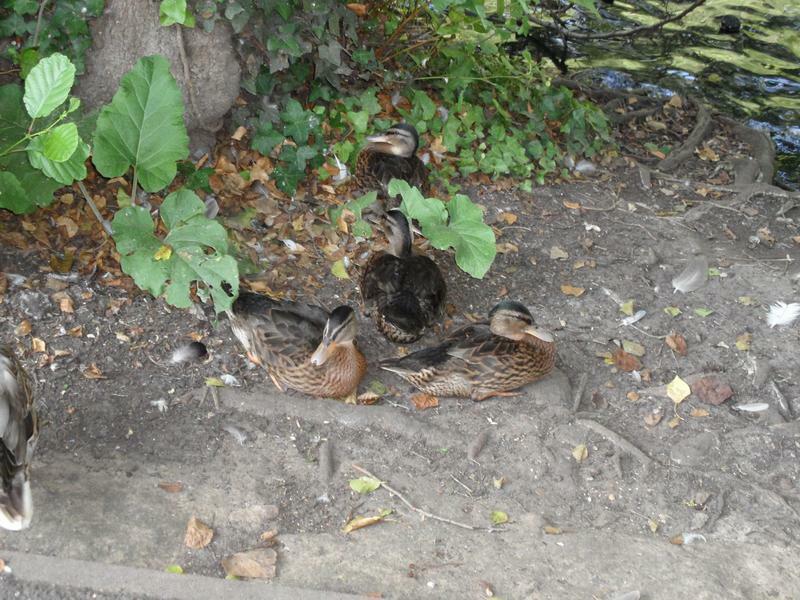 The first family of ducklings again from the other side, sitting a few feet away from the main path and dog walkers. 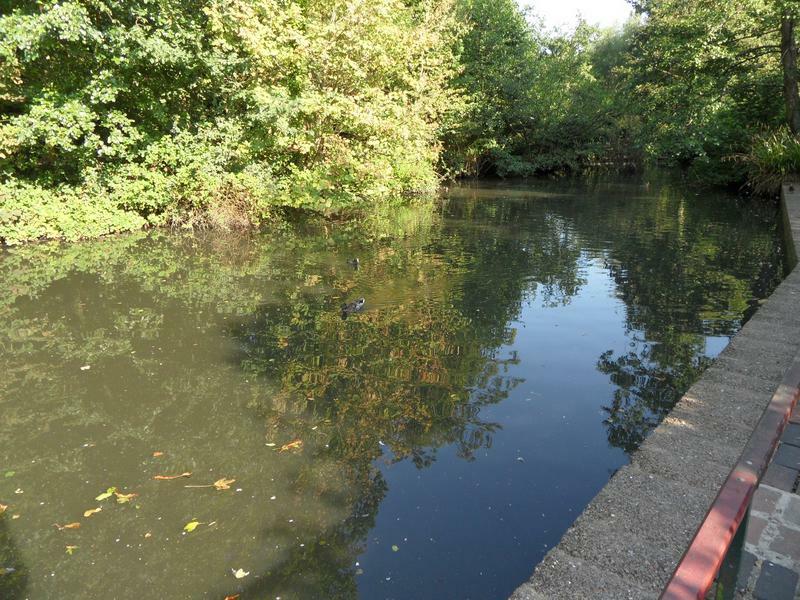 Better safety on the water. 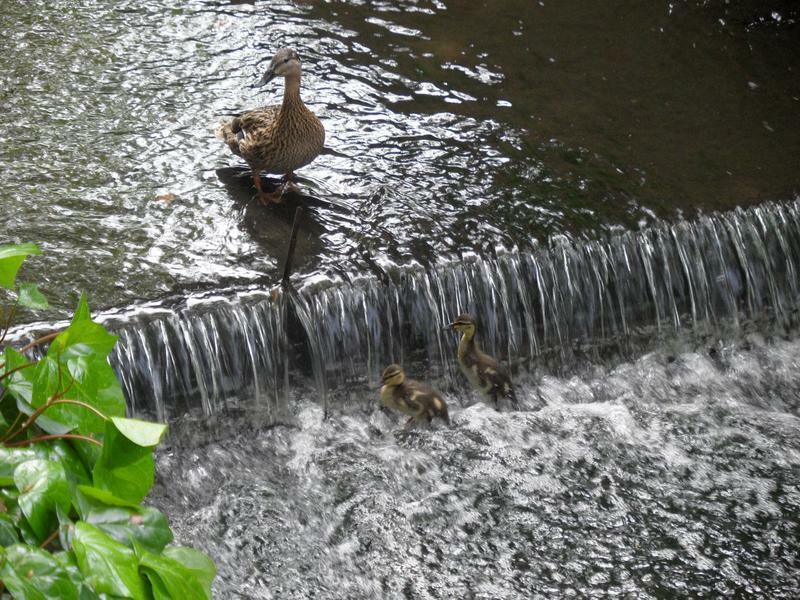 Only a week or so old. 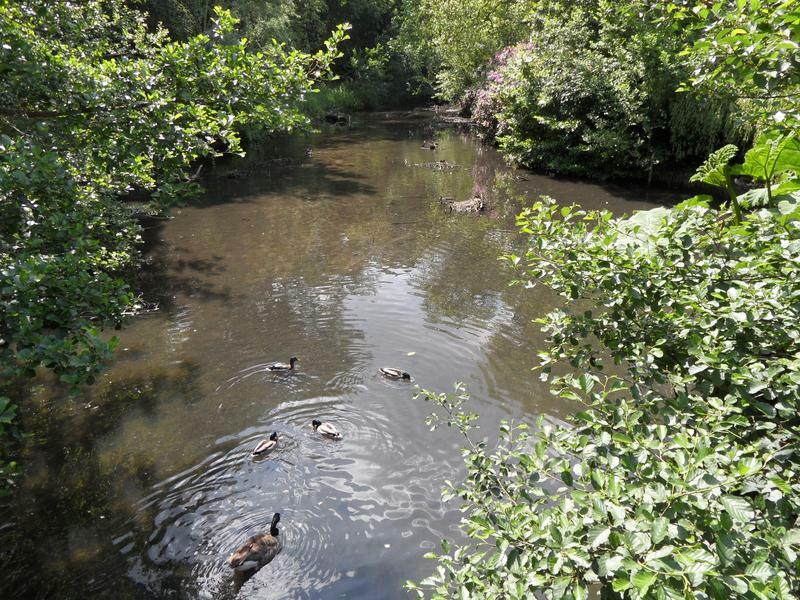 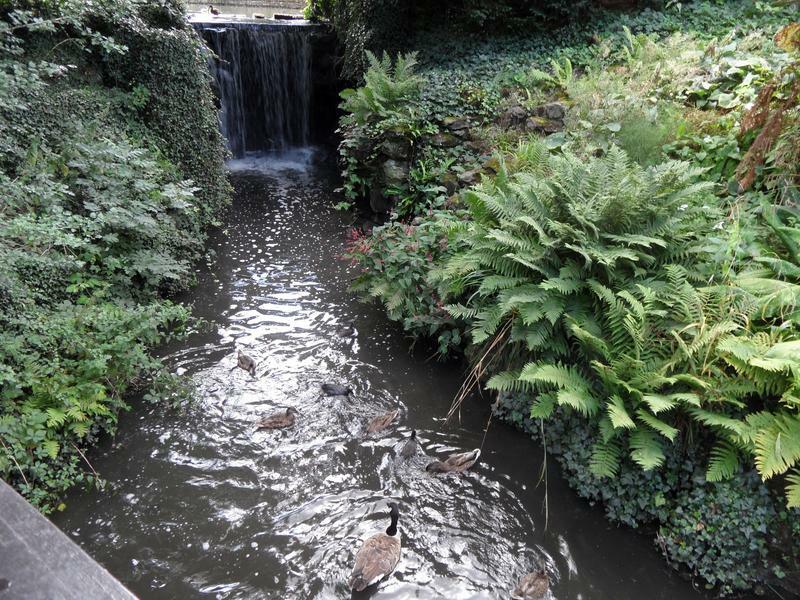 21st August 2014, several Mallards above the bottom waterfall, with a Mandarin on a log. 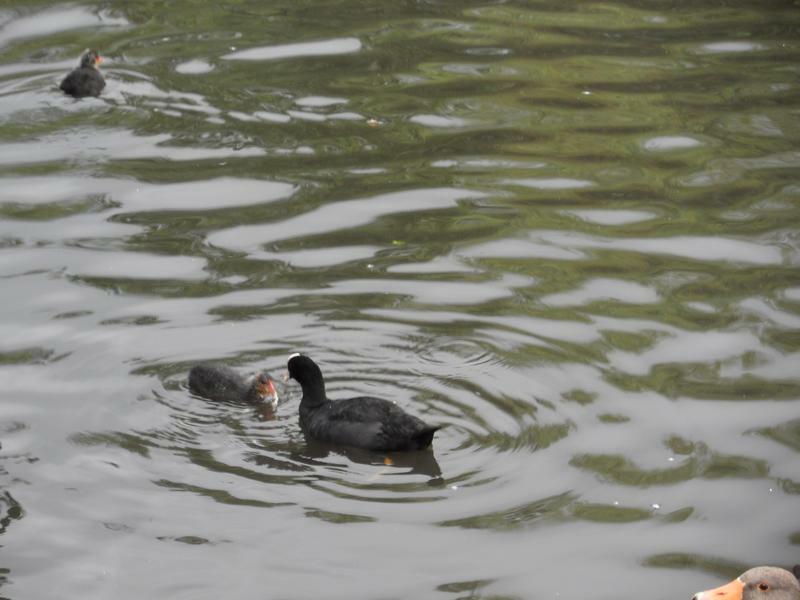 A Coot family on the top pond. 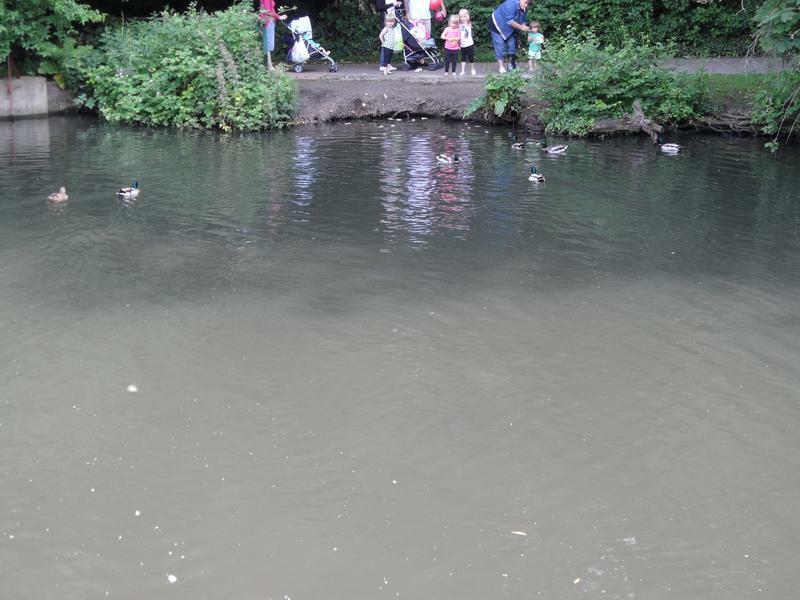 The water level seems to have dropped after the winter floods. 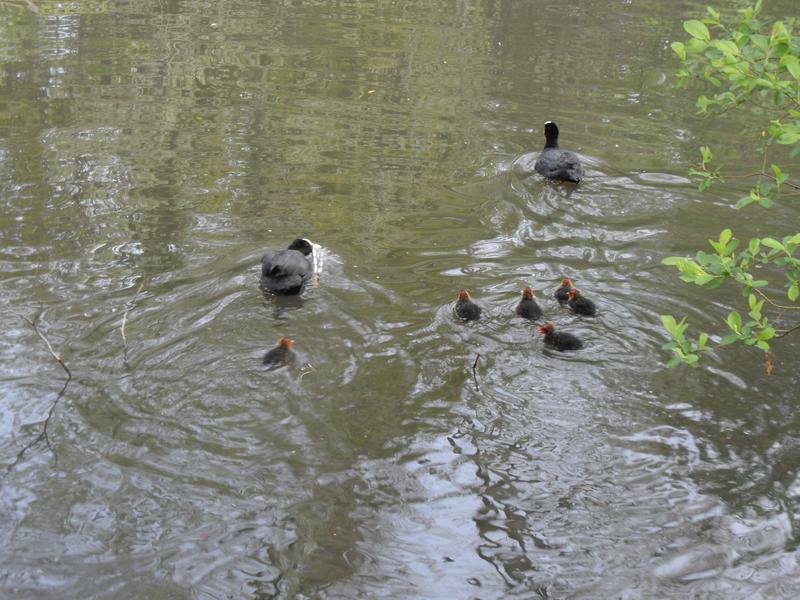 A second Coot family, seven ducklings. 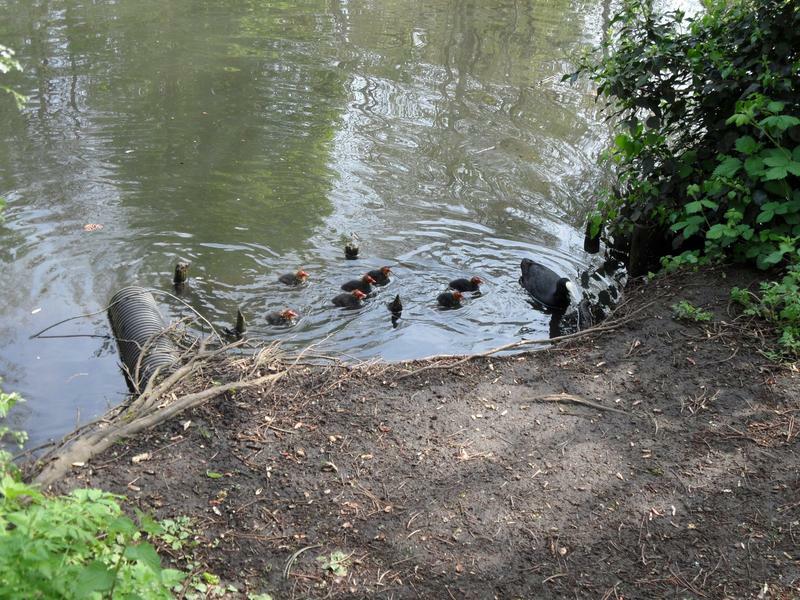 Having eaten some duck pellets, the Coot family heads off across the pond. 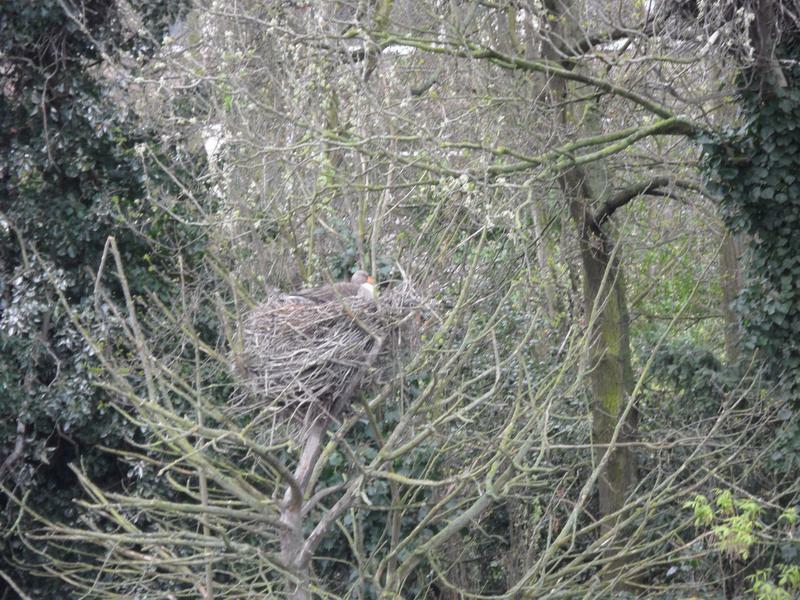 Until they reach their nest. 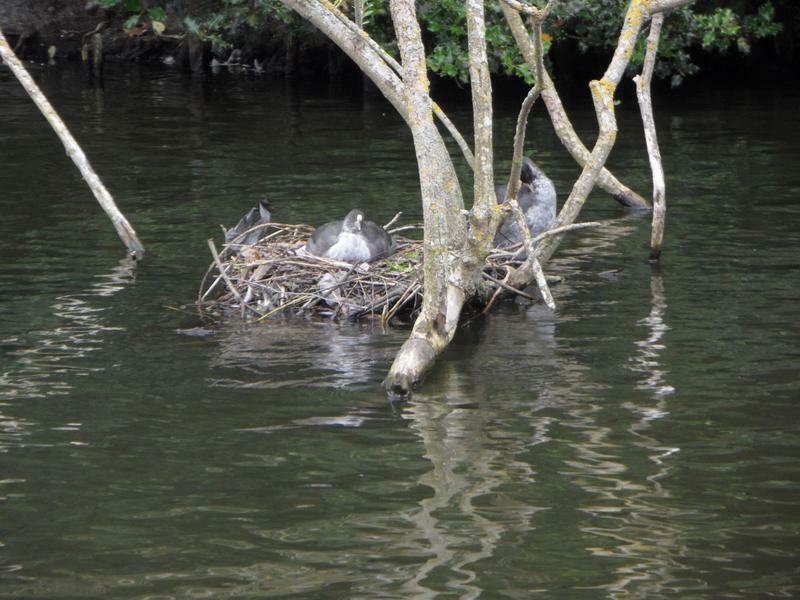 Where they all settle down for a rest, watched by a parent. 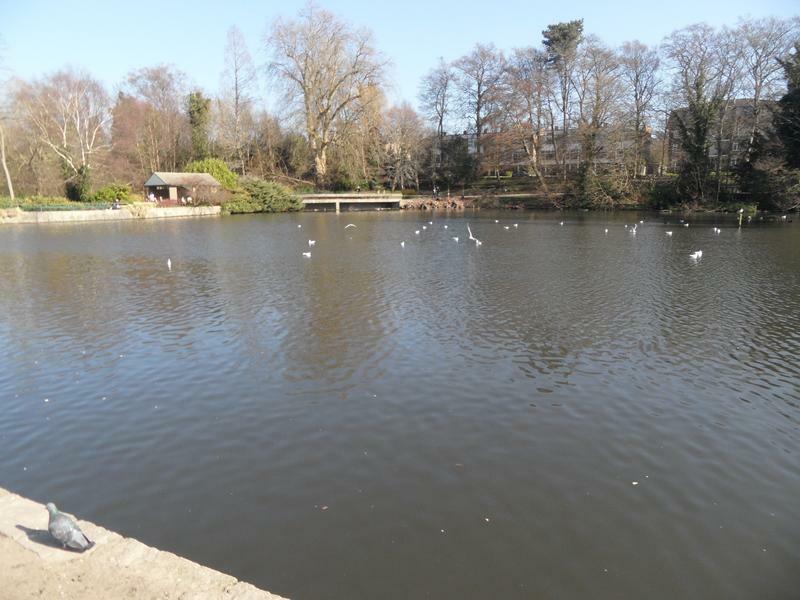 The main lake is very quiet again. 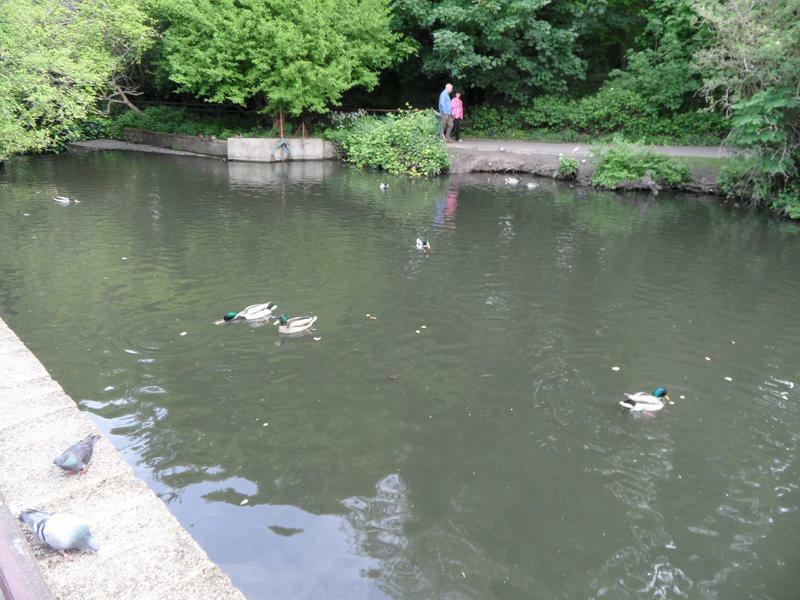 But Heron Island is as busy as ever, looking for takeaway food for the chicks, ducklings unfortunately being ideal food. 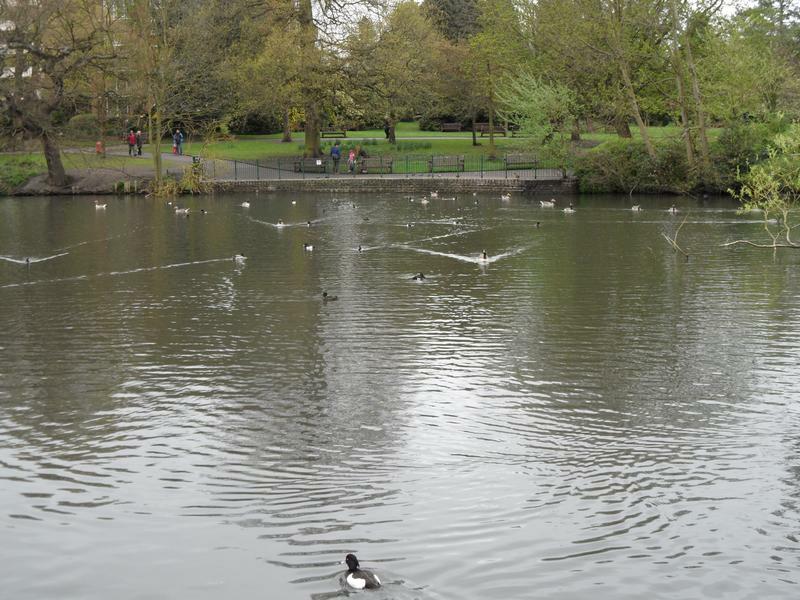 The bottom of the main lake is also peaceful. 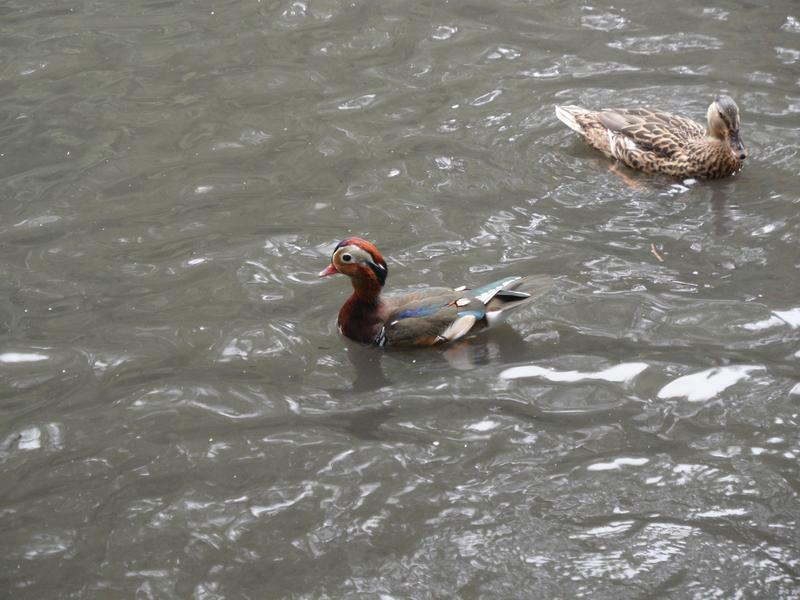 Two Mandarin ducks on the bottom pond. 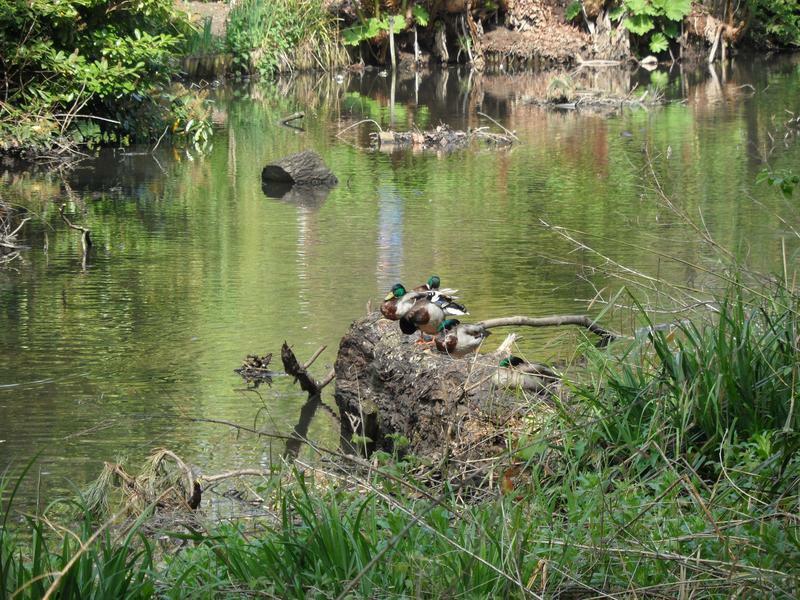 Several boy Mallards sitting on a branch. 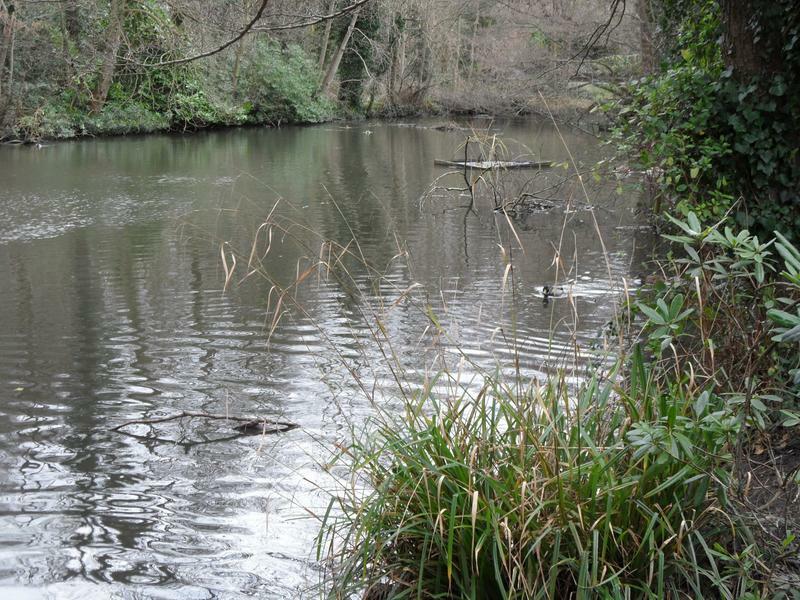 Another view of the main lake, a little more activity close to overhanging trees. 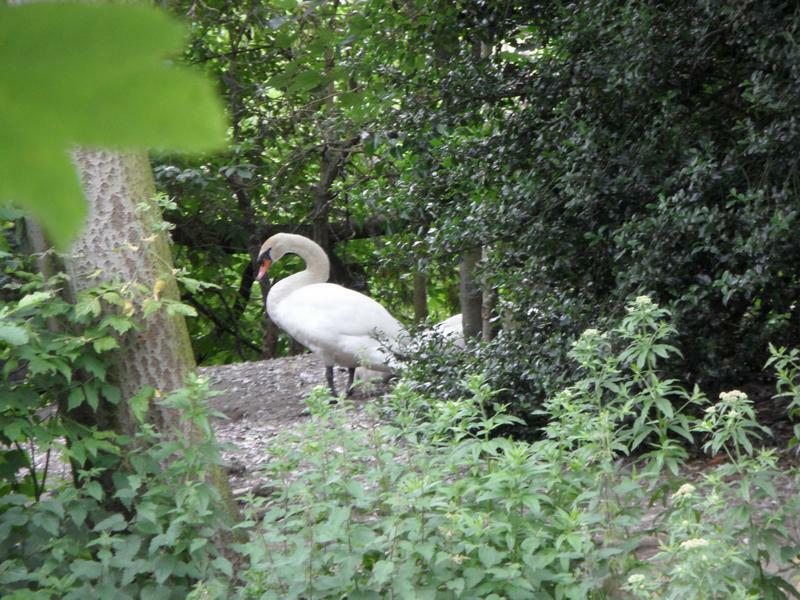 A single swan, but his mate is sitting on a nest, somewhere on the lake. 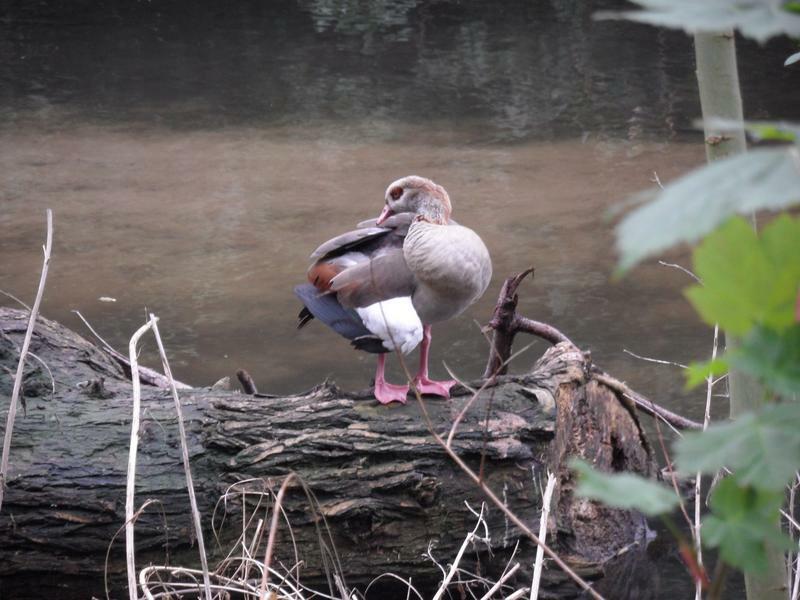 A Mandarin Duck on a log over the bottom water fall. 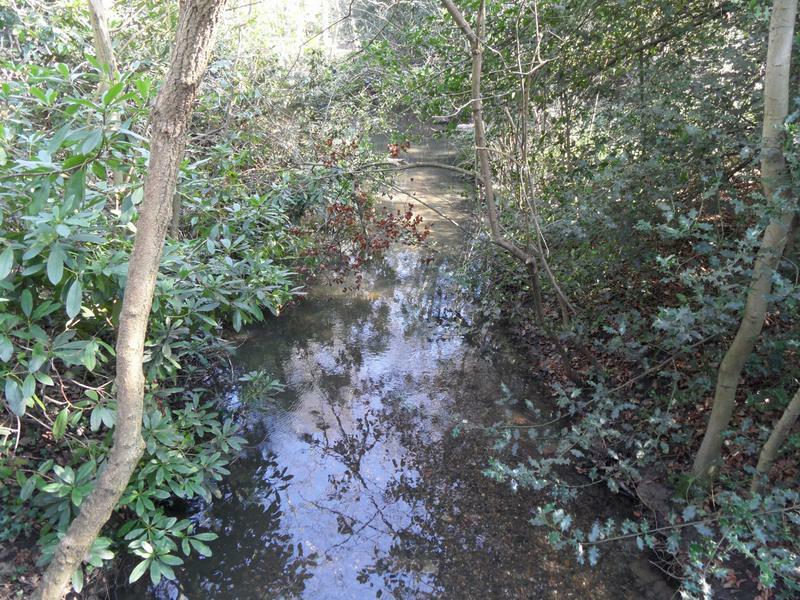 take up down stream, where they can easily exit the stream and walk back up the path to the pond. 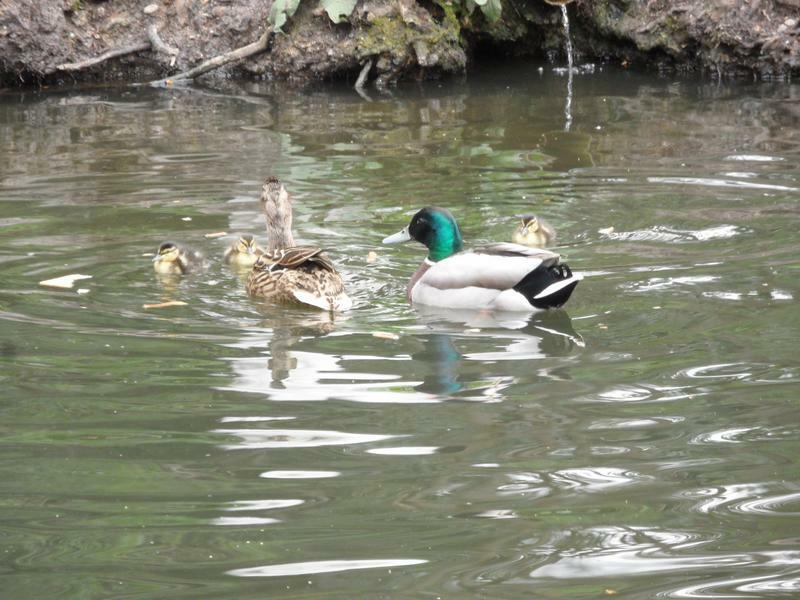 4th May 2014, no sign of the Mallard family that was here on our last two visits. 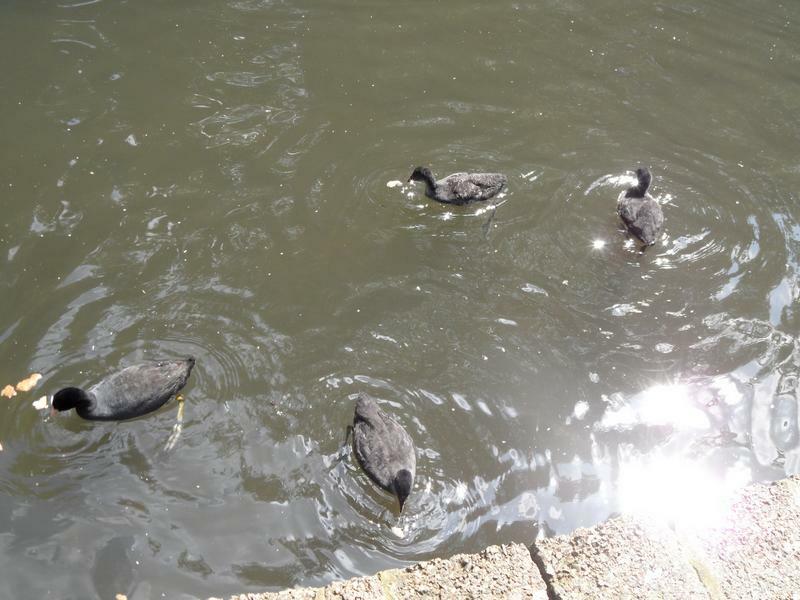 But the Coot family is growing, no longer red beaks. 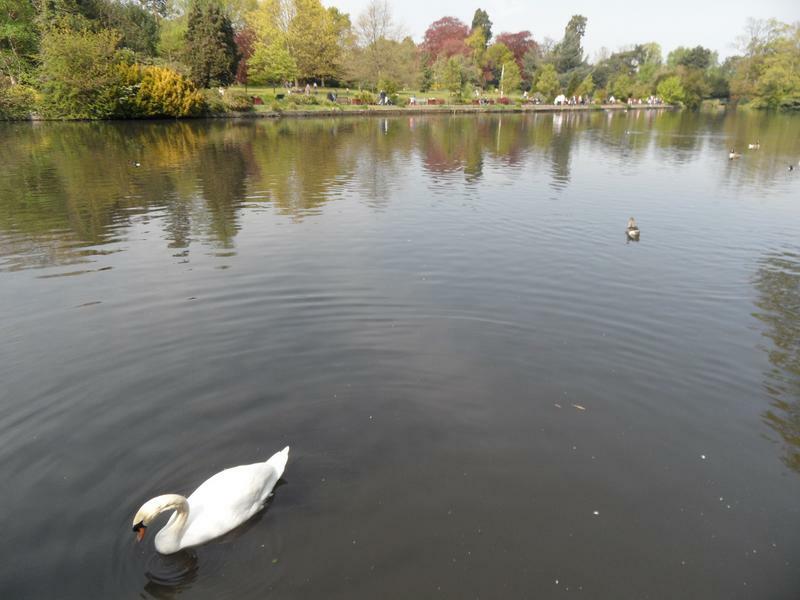 Quiet on the main lake, again. 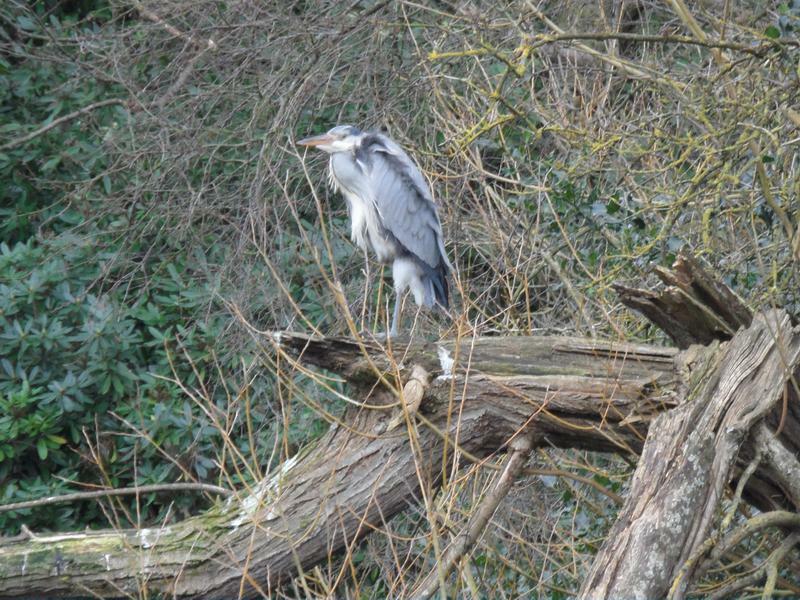 The herons are still on lookout. 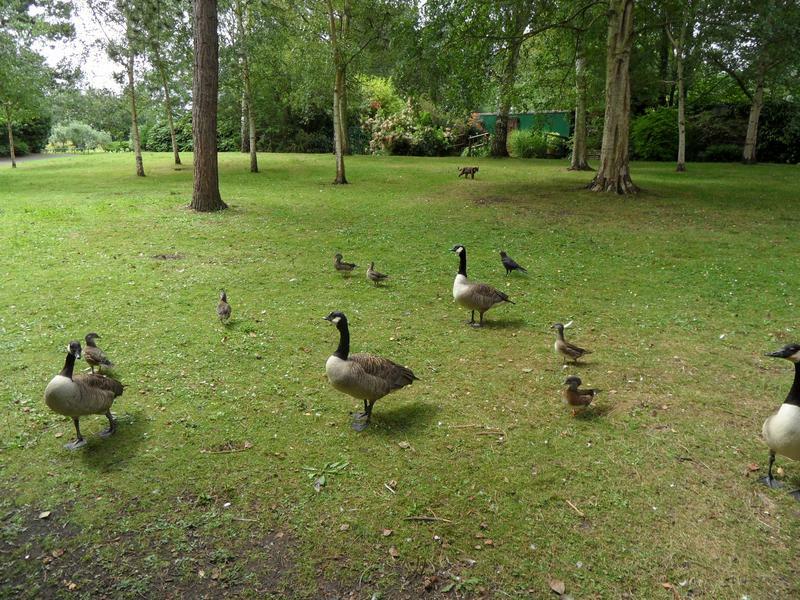 More geese moving onto the lawns, not seen any nests yet, possibly in the undergrowth beyond the lawns. 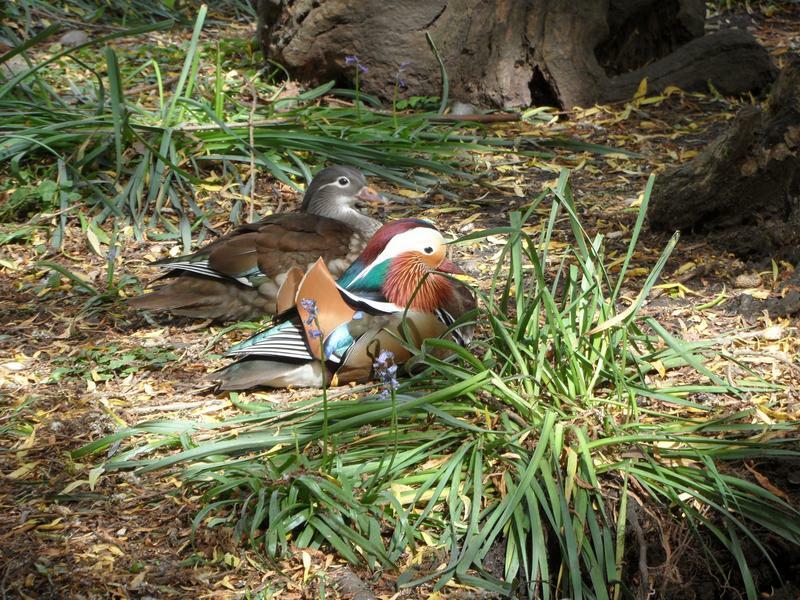 Don't often see male and female Mandarins together, particularly sleeping right next to the path. 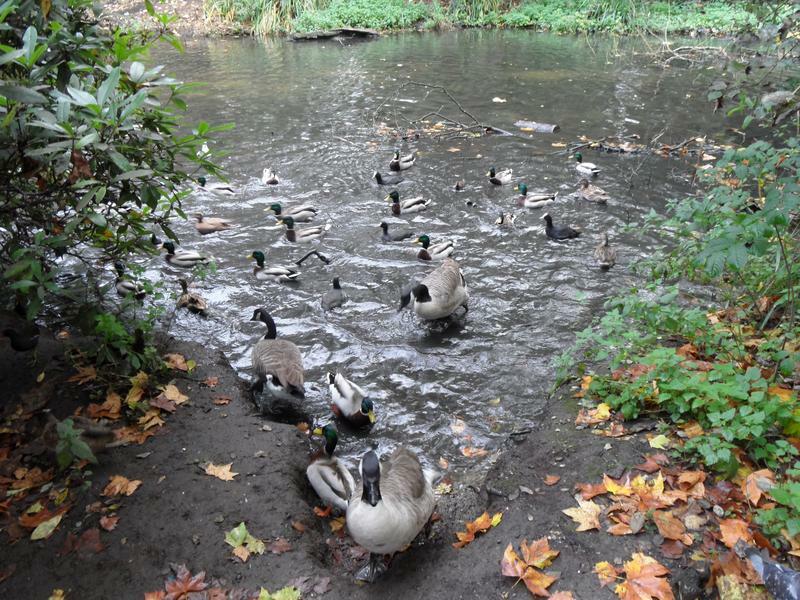 They don't like attention from the goose or two more males arriving. 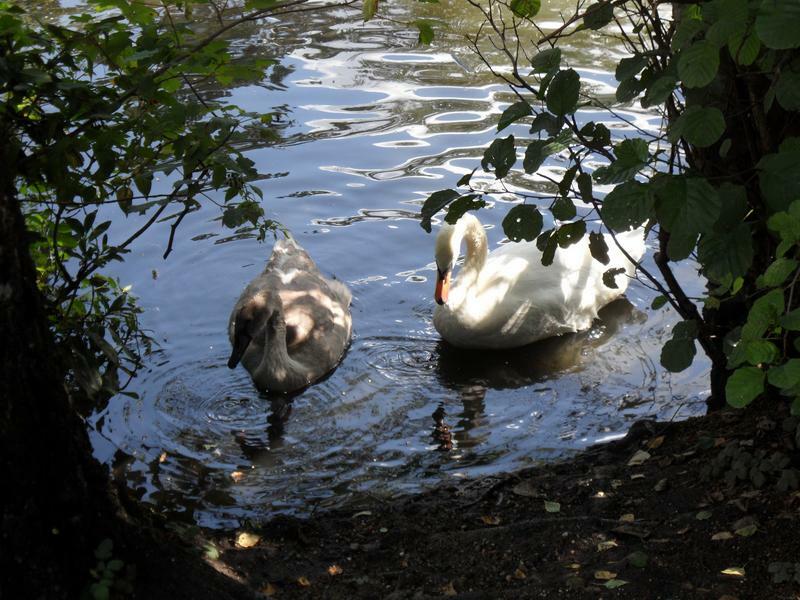 So the pair settle down again 10 feet away. 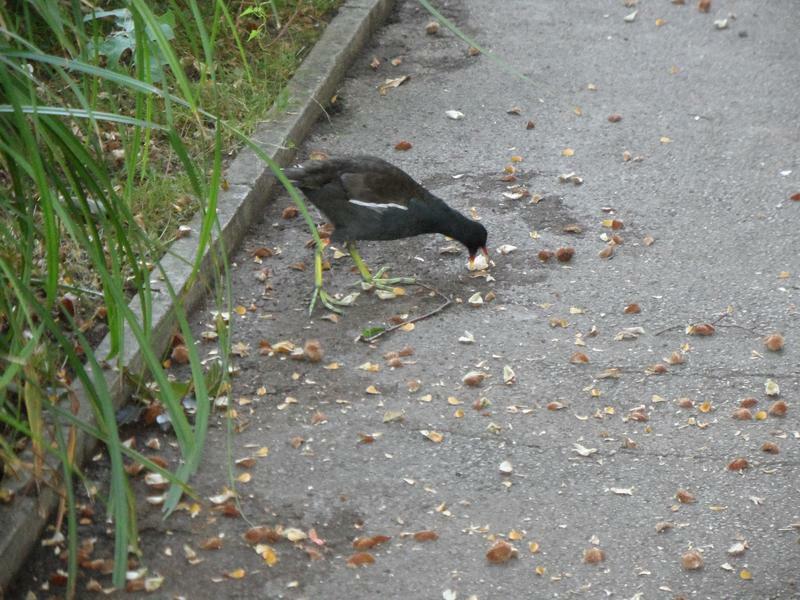 Meanwhile on the boys is hungry and follows me down the path eating peanuts I'm feeding to the squirrels. 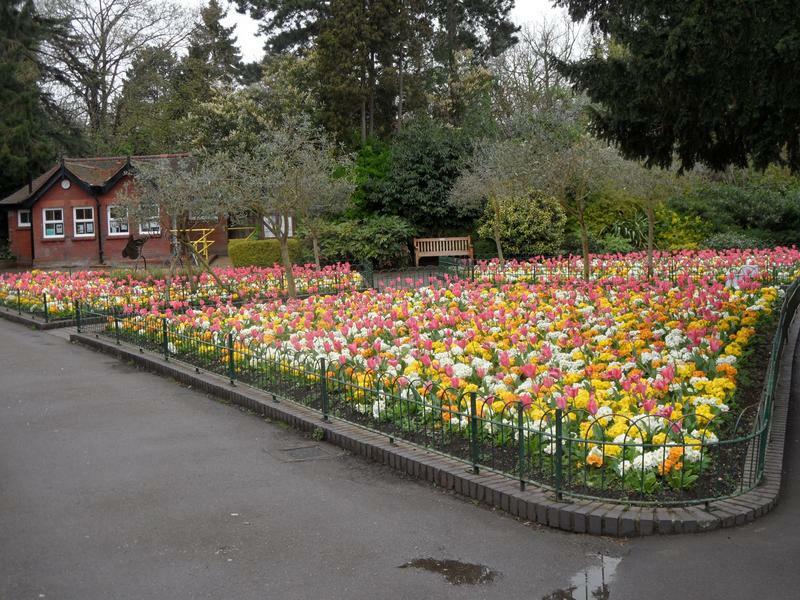 back to the park since. 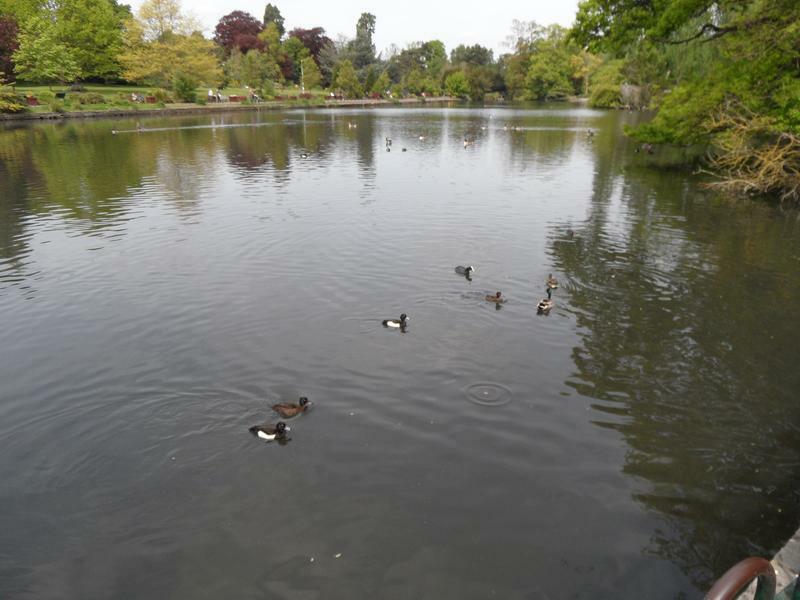 Several Tufted Ducks on the main lake. 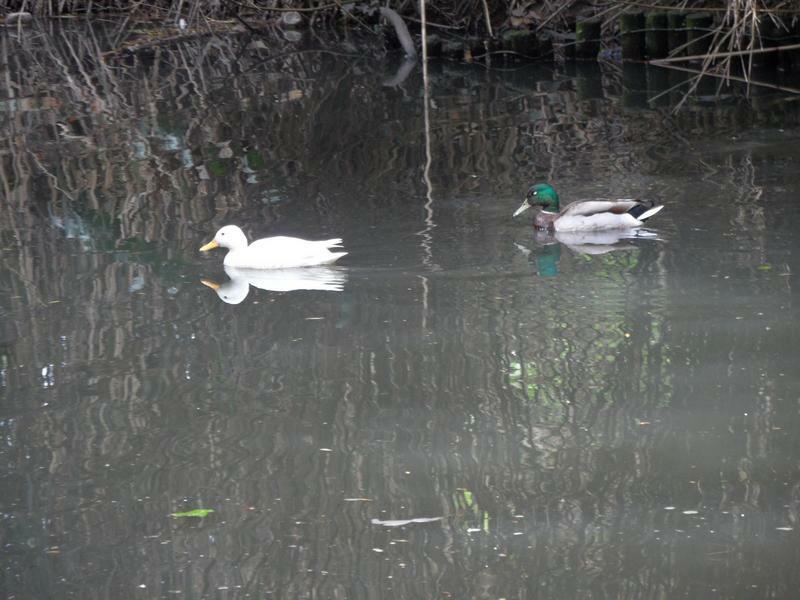 A White Mallard, probably a female since a boy is close behind. 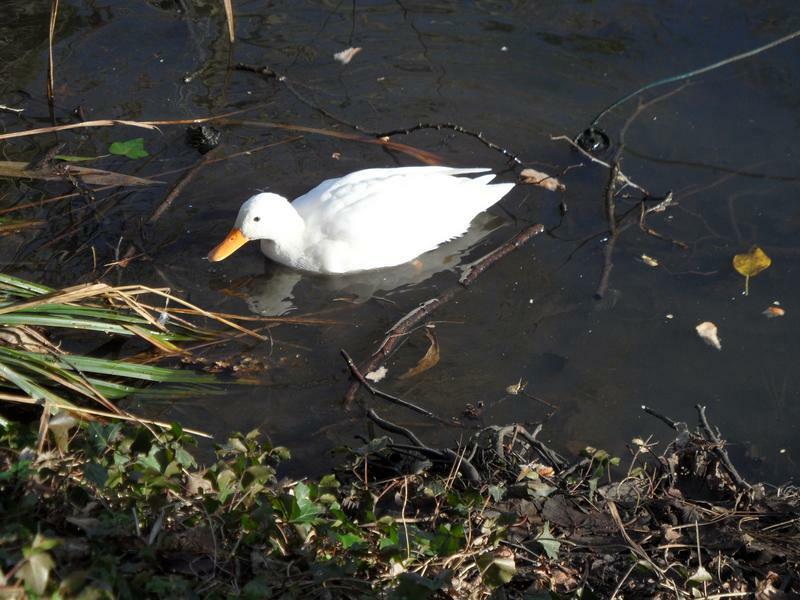 It might even be the missing White Mallard from Millers Pond. 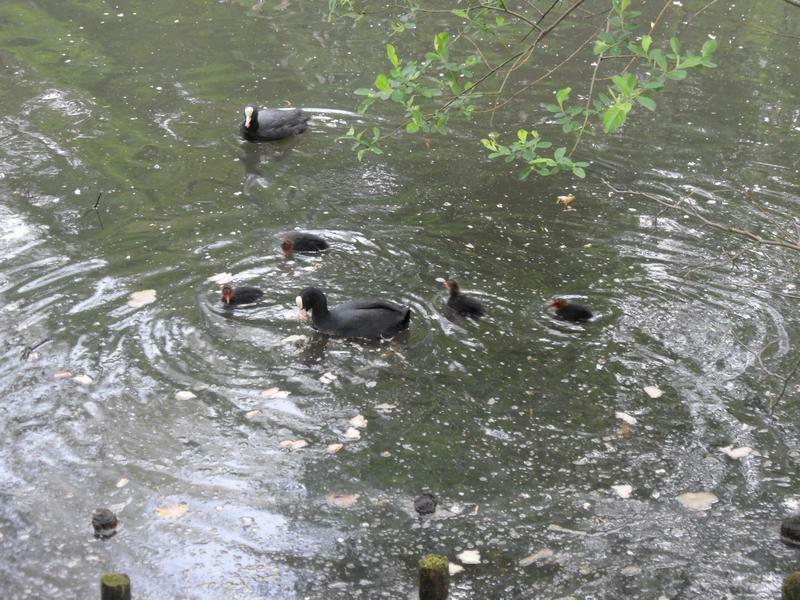 1st June 2014, a Coot family on the upper pond. 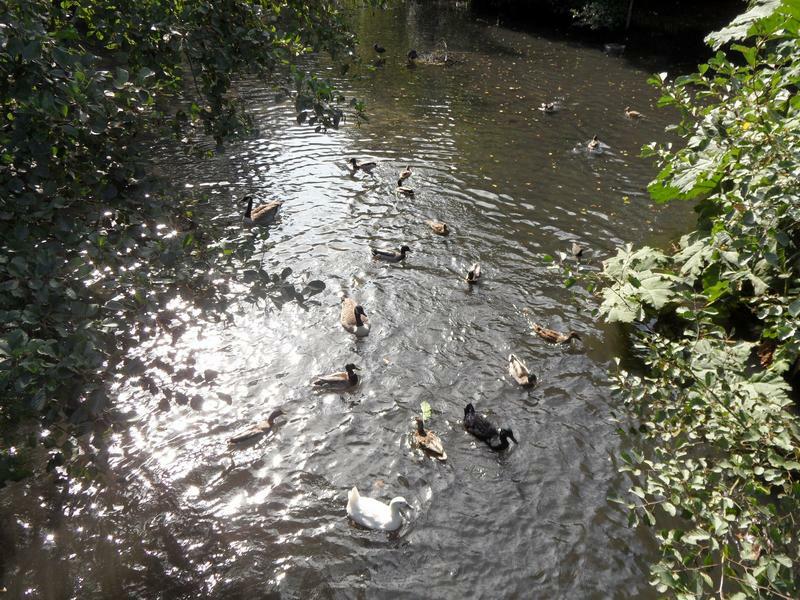 Don't see that many water fowl on the water today. 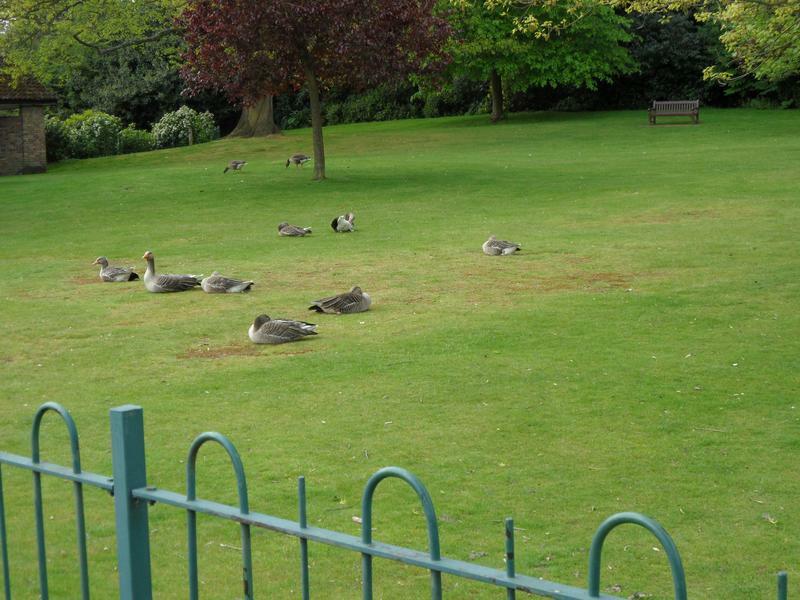 Transpires many of the ducks and geese are sleeping on the grass. 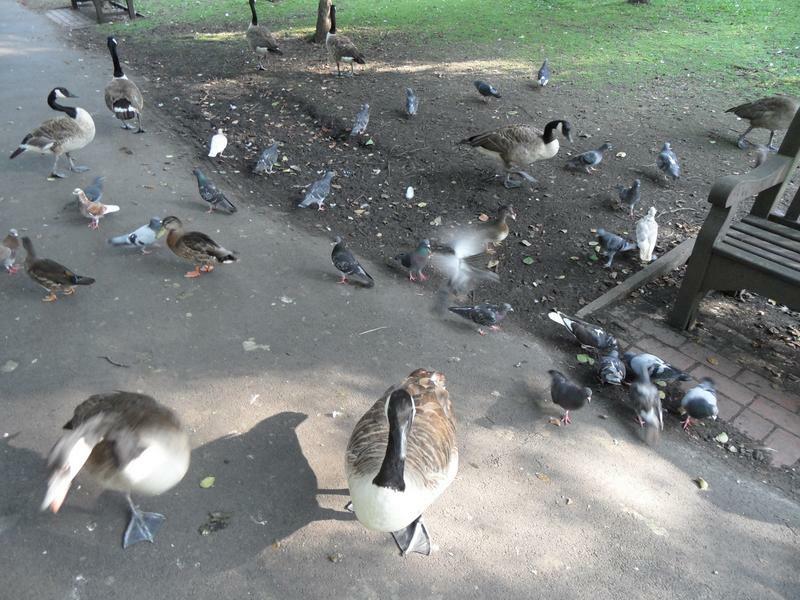 But are still hungry, so wake up and head toward me when they realise breakfast is here. 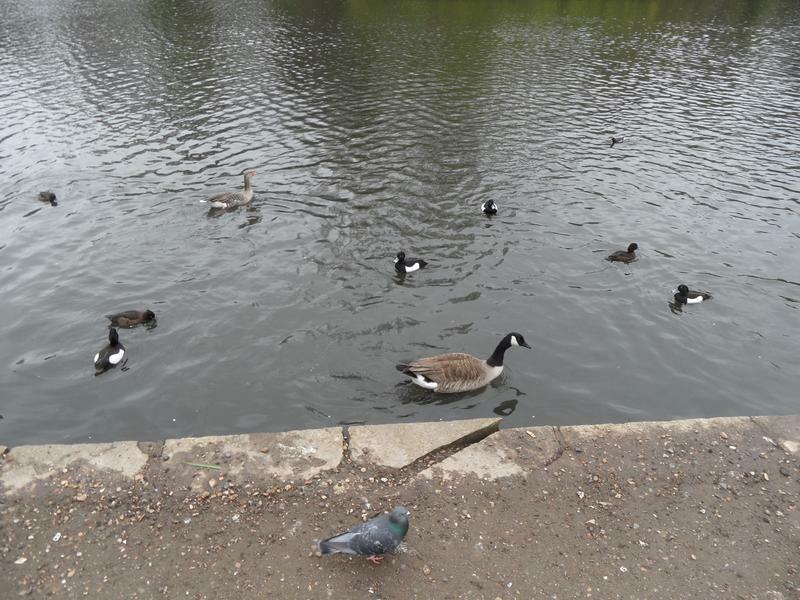 After eating, many of them head off back to the water. 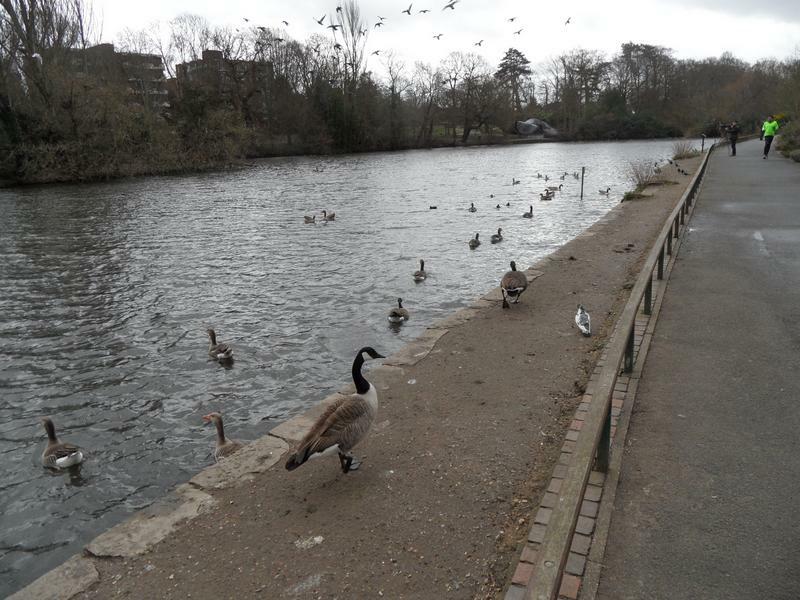 Canada Geese and Mallards, no sign of any goslings or ducklings. 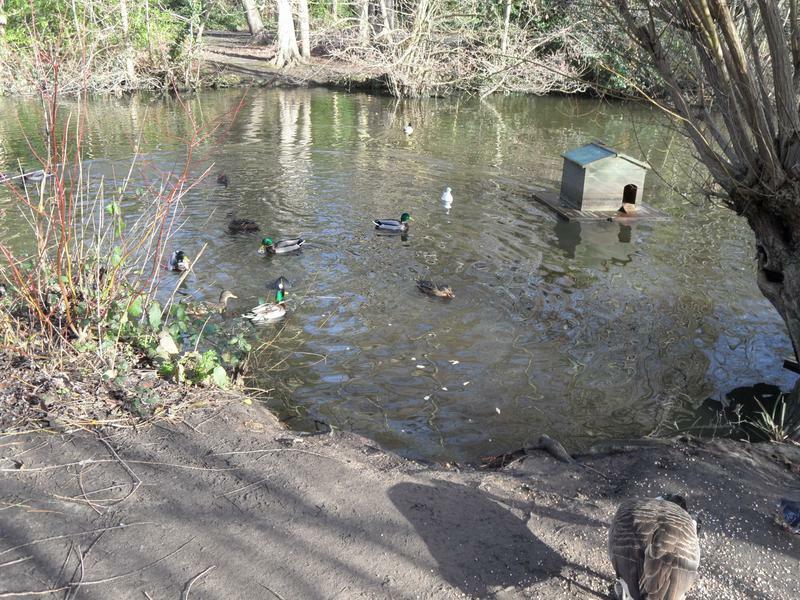 Nor the Muscovy ducks who normally live here. 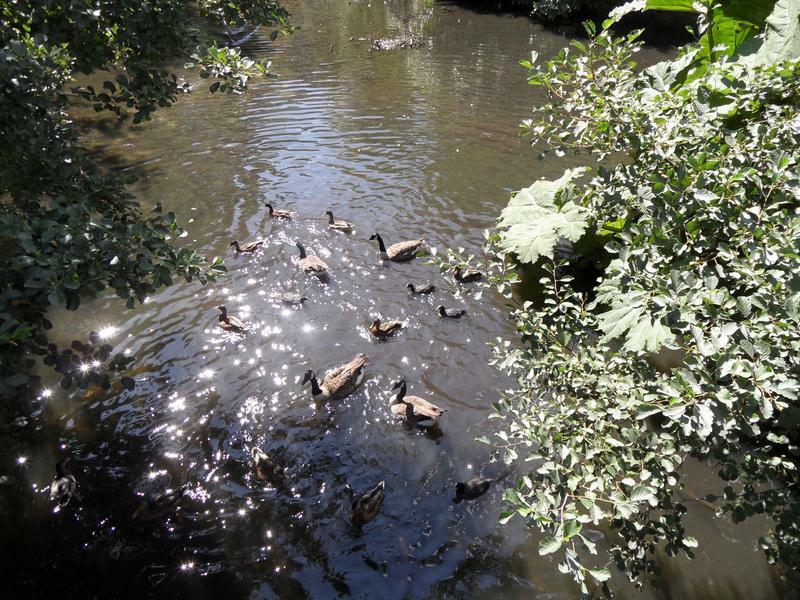 There were ducklings here last month, but the greedy herons have probably eaten them. 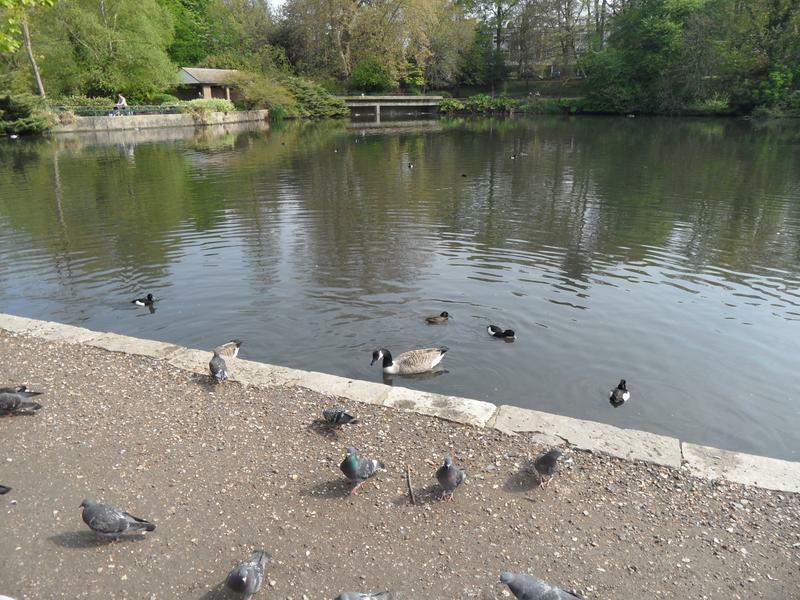 The main lake is also quite quiet. 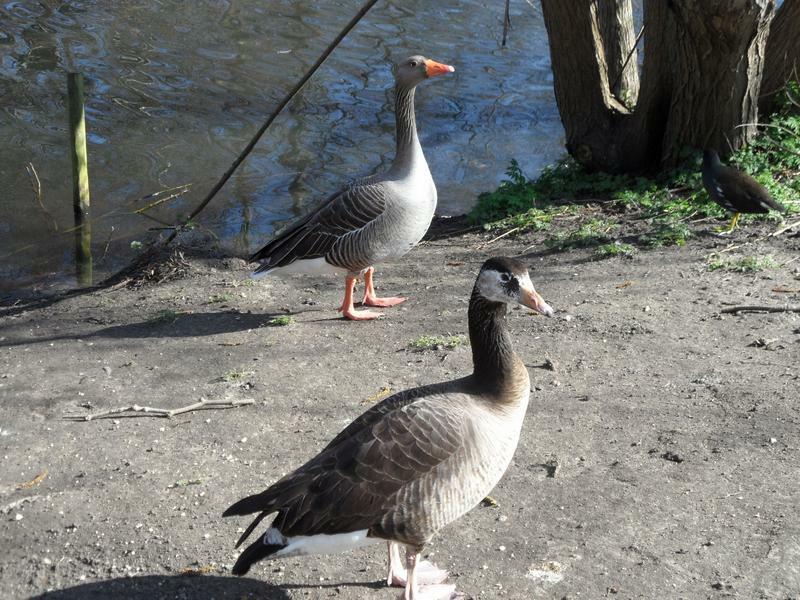 Strange looking goose, a Canlag, which is cross between a Canada and Greylag geese. 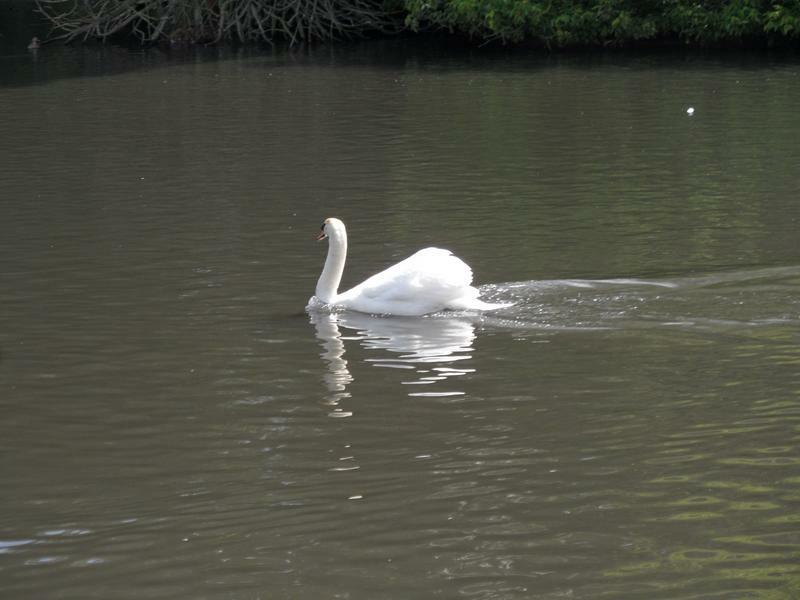 A majestic swan circling heron island at high speed. 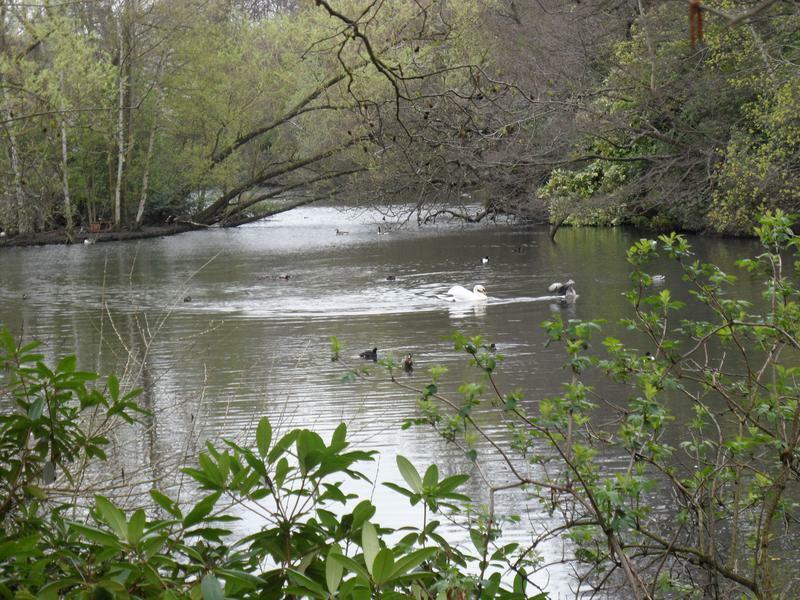 The swan can just be seen to the right of heron island, which is where the cygnets are sleeping. 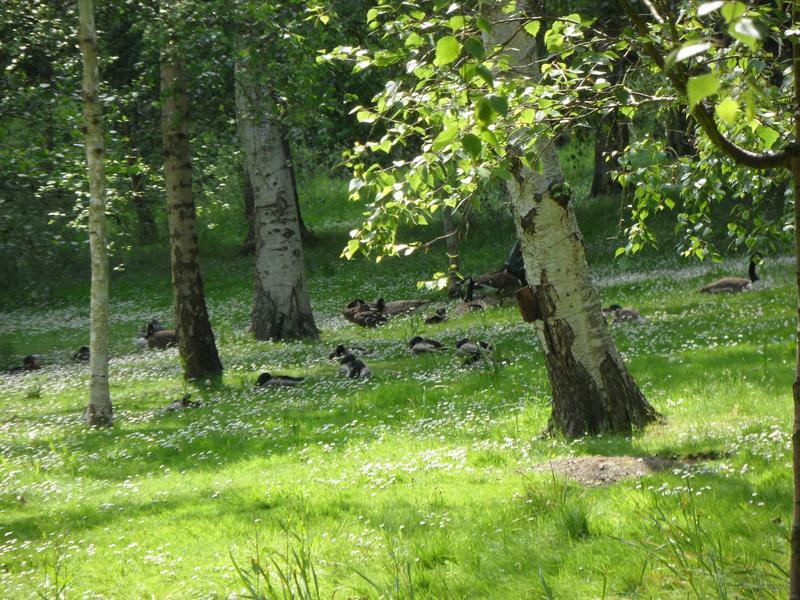 Sleeping Mallards in the grass. 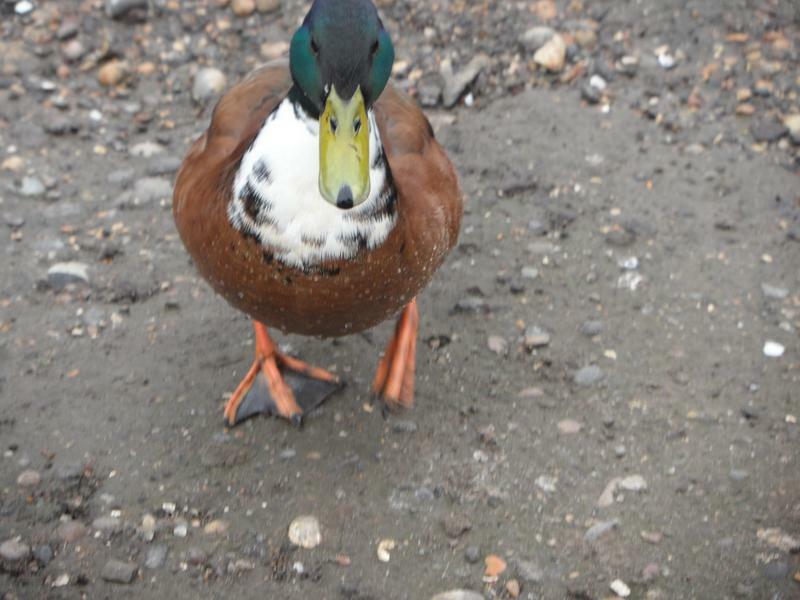 Who I've just woken up as well by throwing food their way. 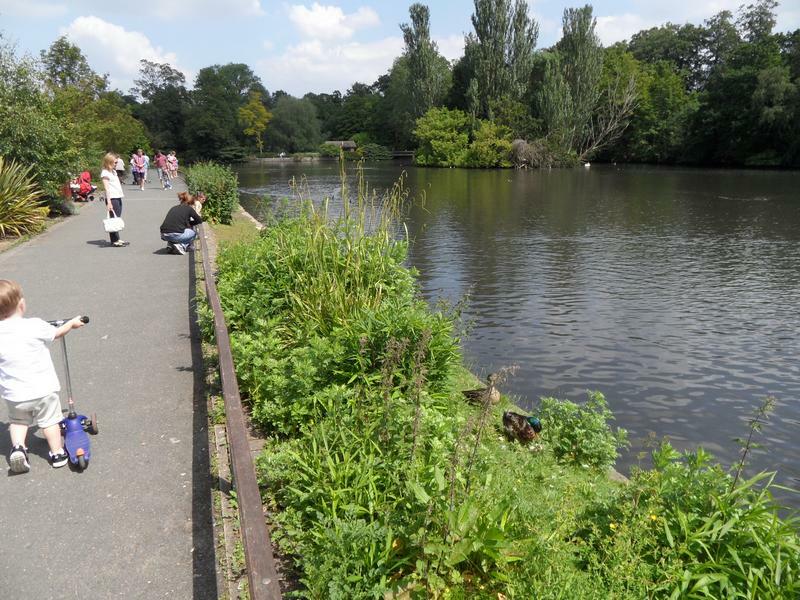 Not much activity on the lower pond. 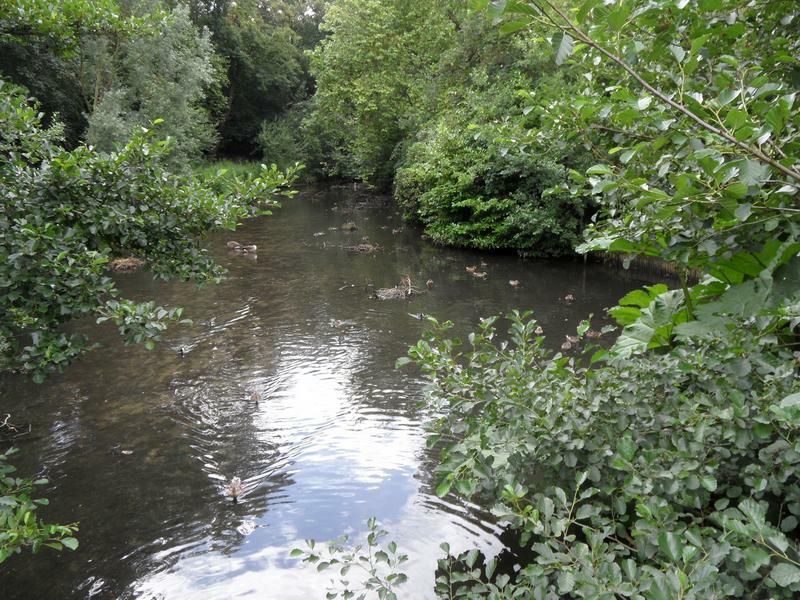 No sign of any goslings, who last year lived on the grass near here. 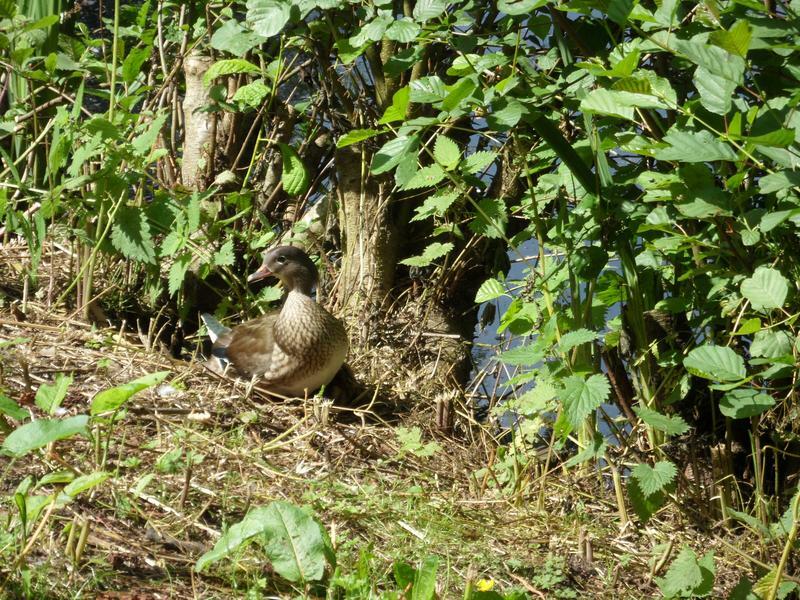 But near the bridge over the lower pond appears to be a Mandarin female, possibly sitting on a nest. 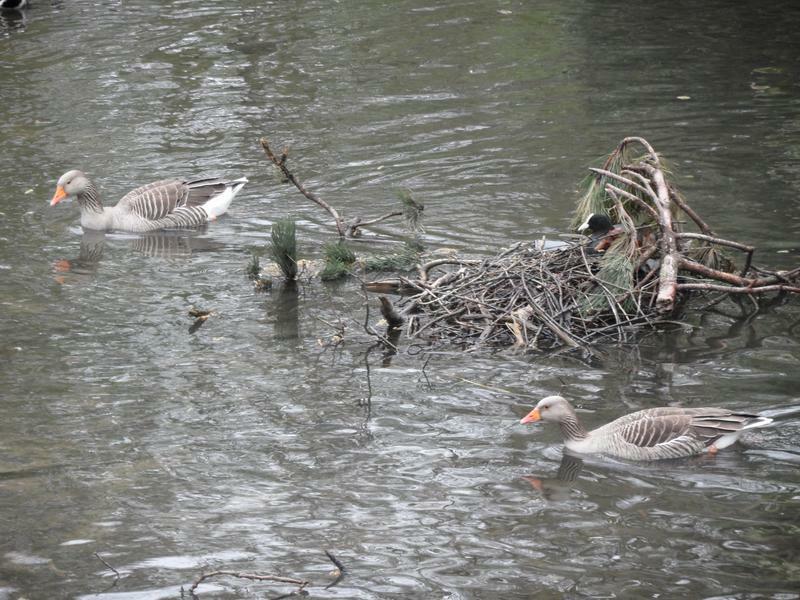 Finally get to see the swan family sleeping on heron island, watched by a curious Greylag goose. 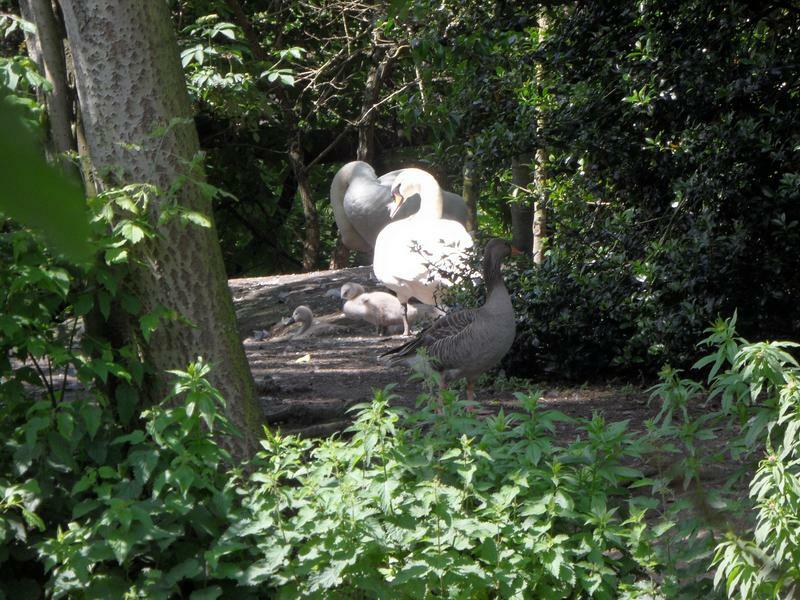 Can only see two cygnets, there were eight originally but hopefully the others are hidden. 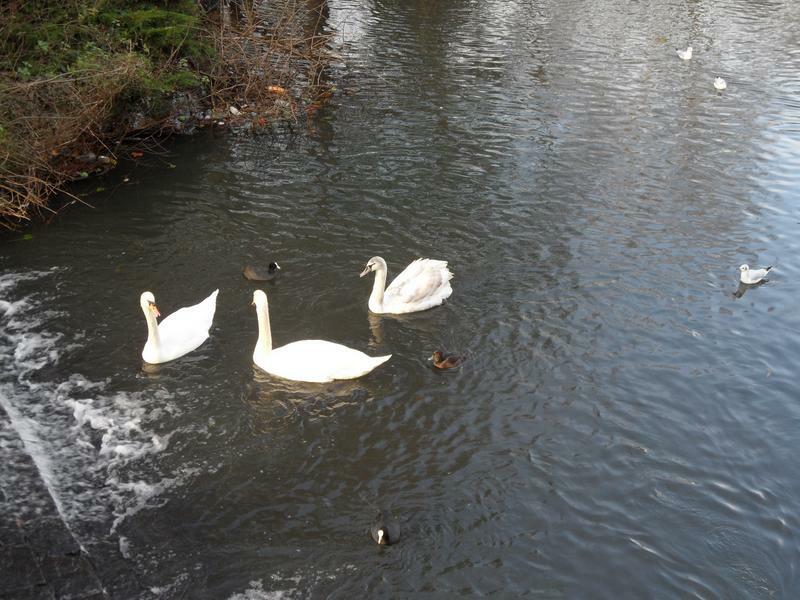 Seems strange the swans would nest on heron island, given the heron's liking for small birds, but swans can be very vicious. 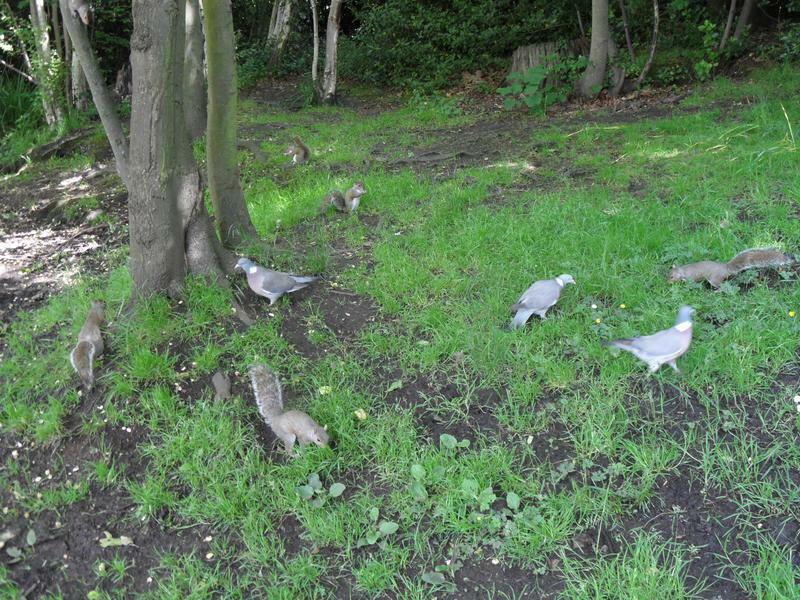 the Wood Pigeons don't get first. 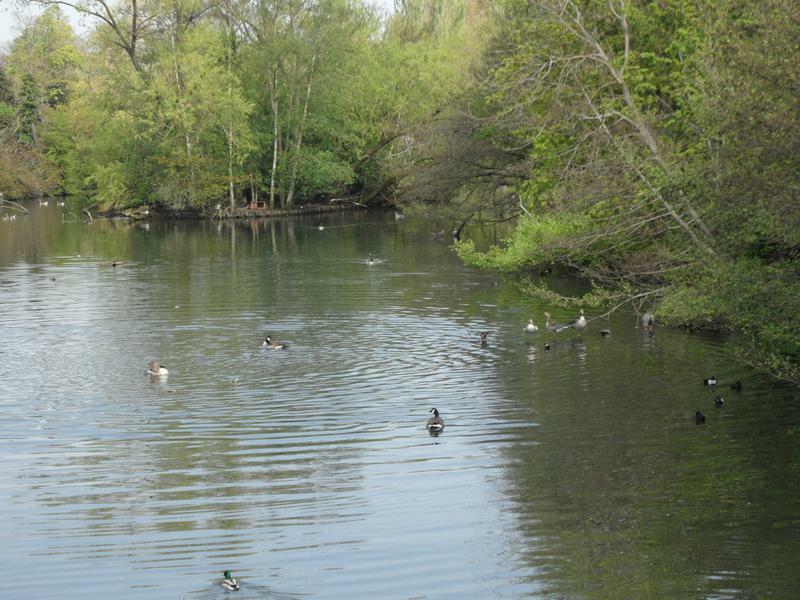 Another view of the peaceful main lake and heron island. 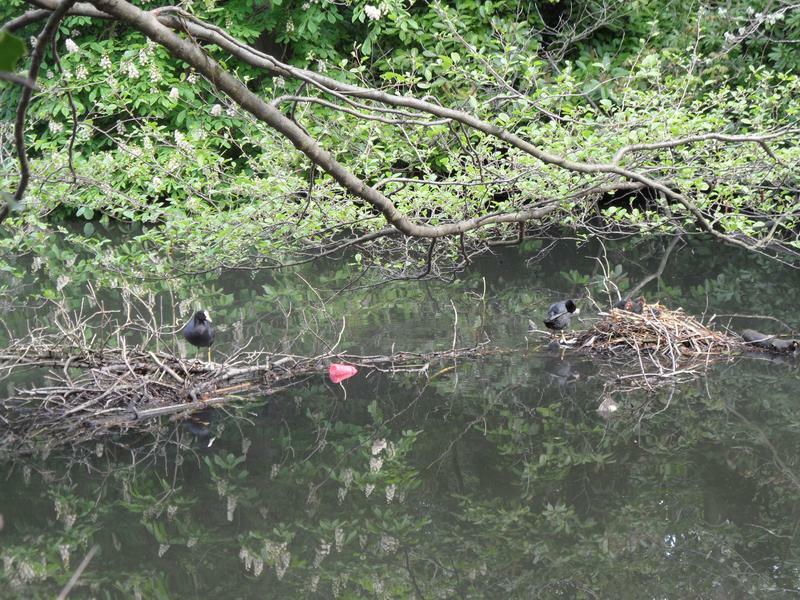 One of the Coots is sitting on her nest again, probably on new eggs, while one of the earlier ducklings sits there as well. 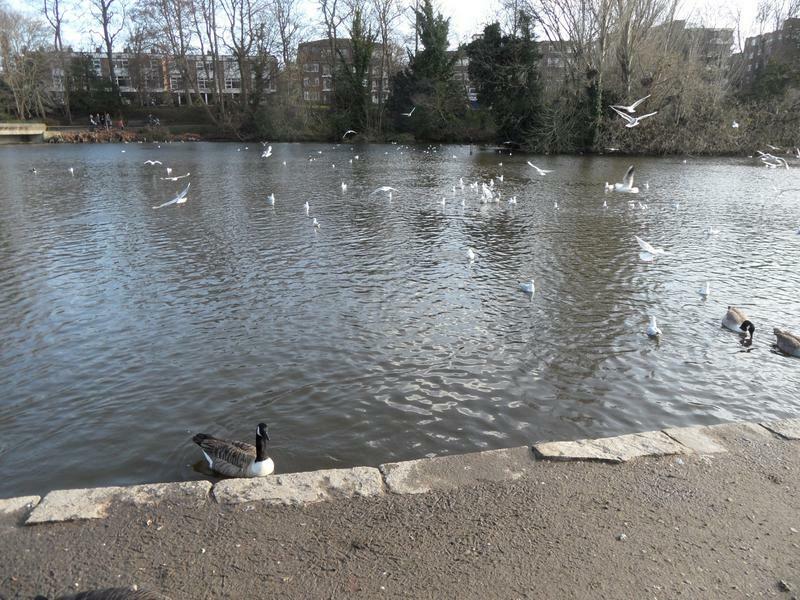 bread as the previous visit. 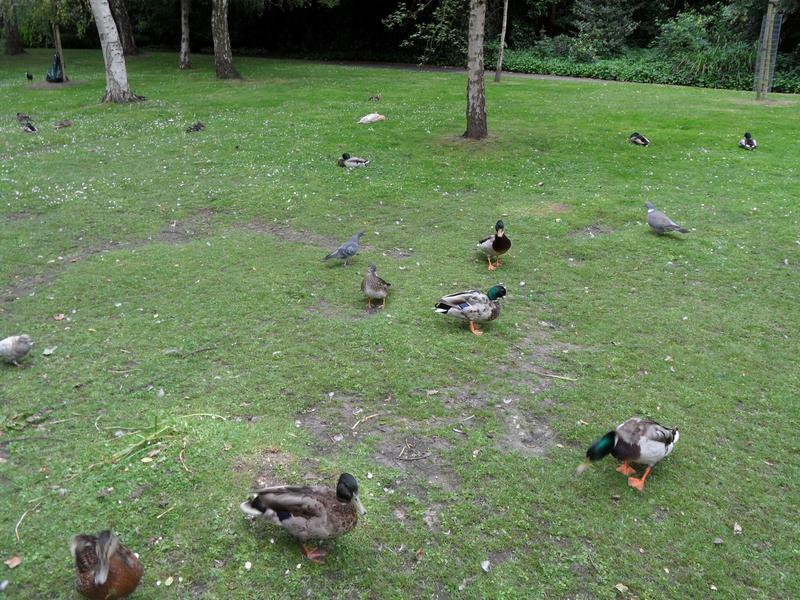 A lot of Mallards are sitting on the grass, but wake up when food arrives. 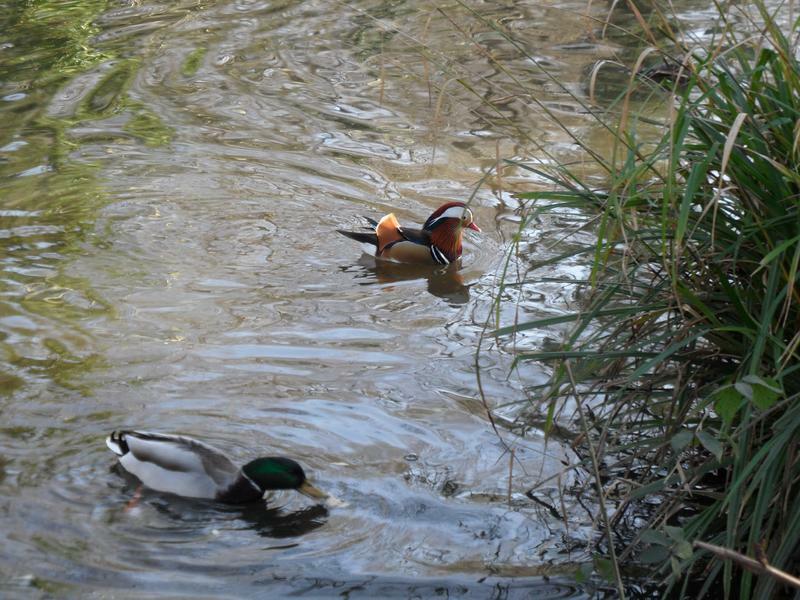 Also a few Mandarins. 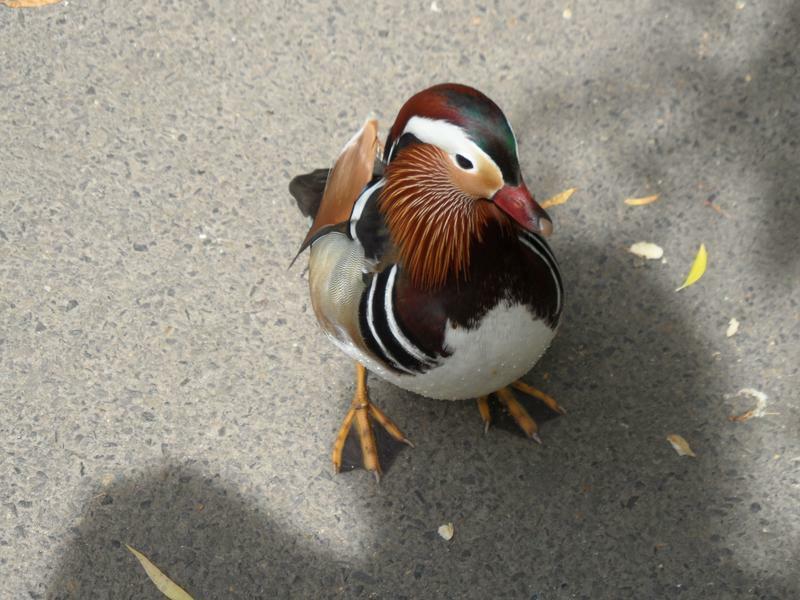 A male Mandarin duck that has not most of his colourful feathers. 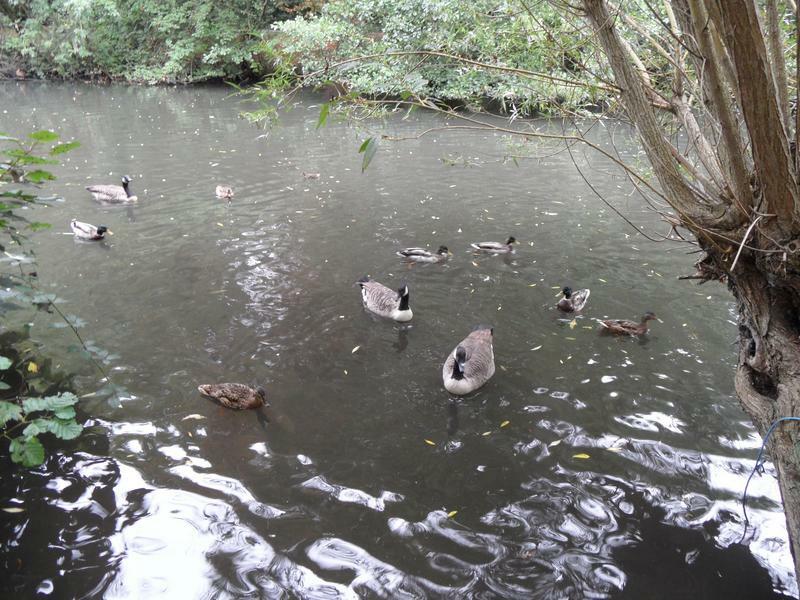 A few Greylag and Canada geese on the main lake, but no goslings anywhere. 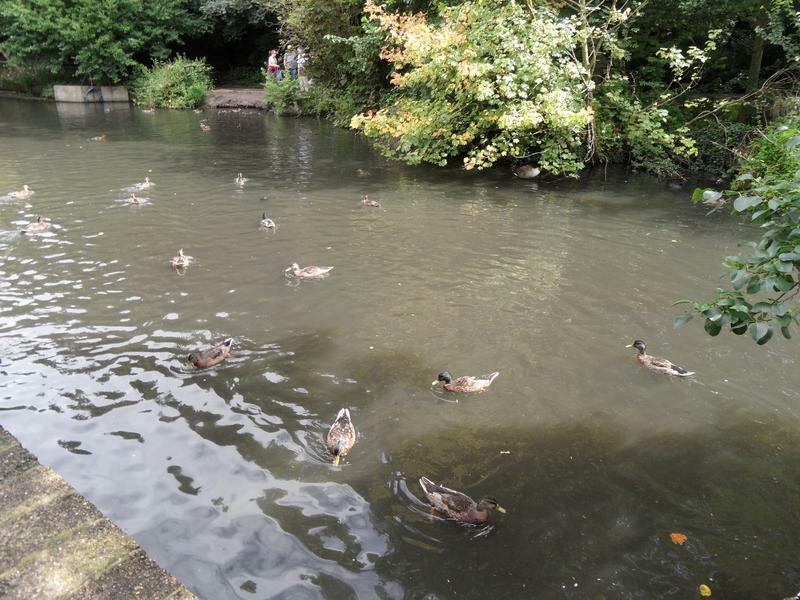 Nor any Mallard ducklings. 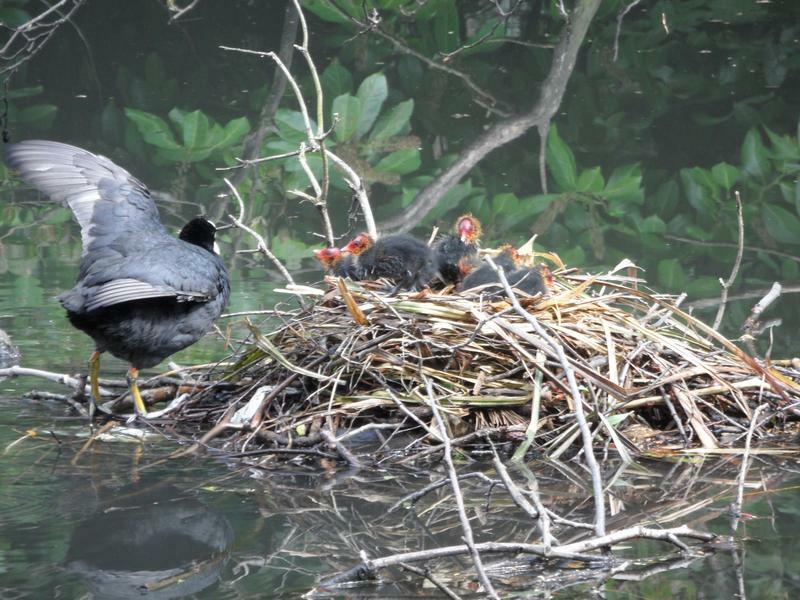 Only the Coots seem to have successful nests. 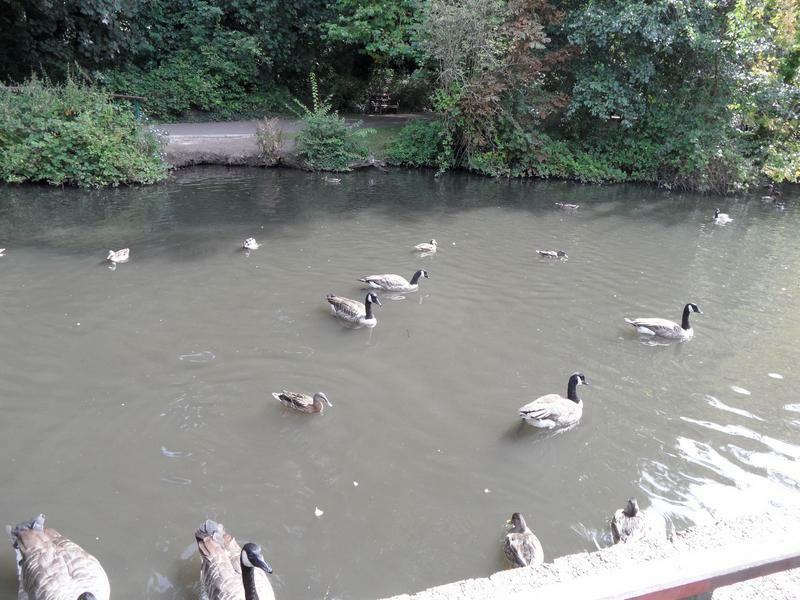 Various geese and ducks under the high bridge at the bottom of the park. 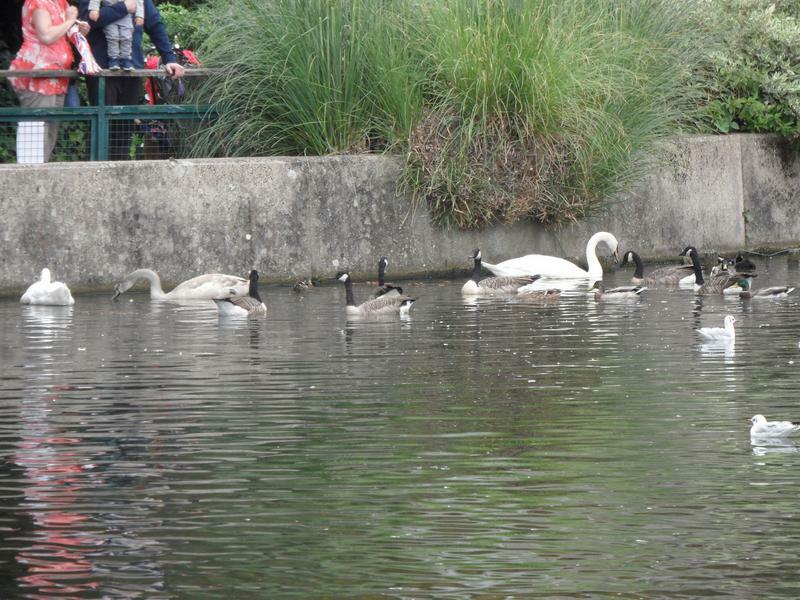 The swans are sitting in the same place on Heron Island as our last visit, but no cygnets visible today. 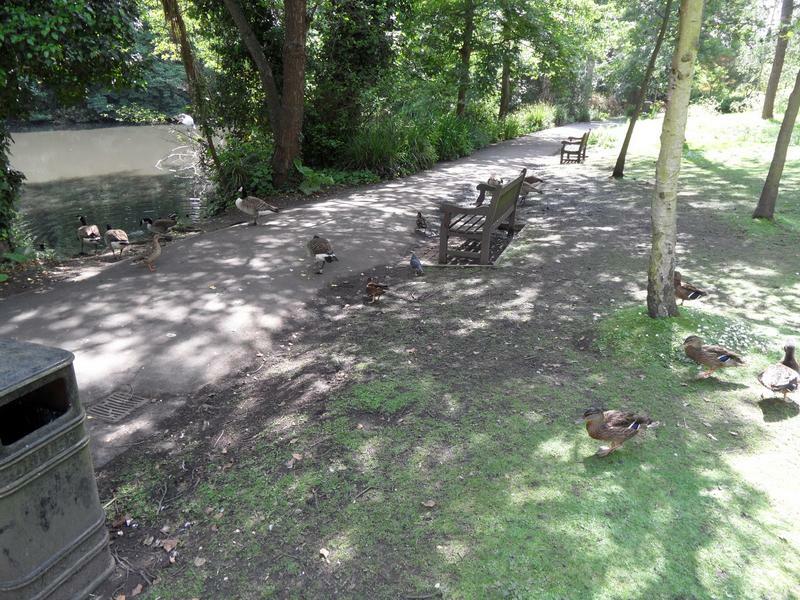 13th July 2014, relatively peaceful on the upper pond. 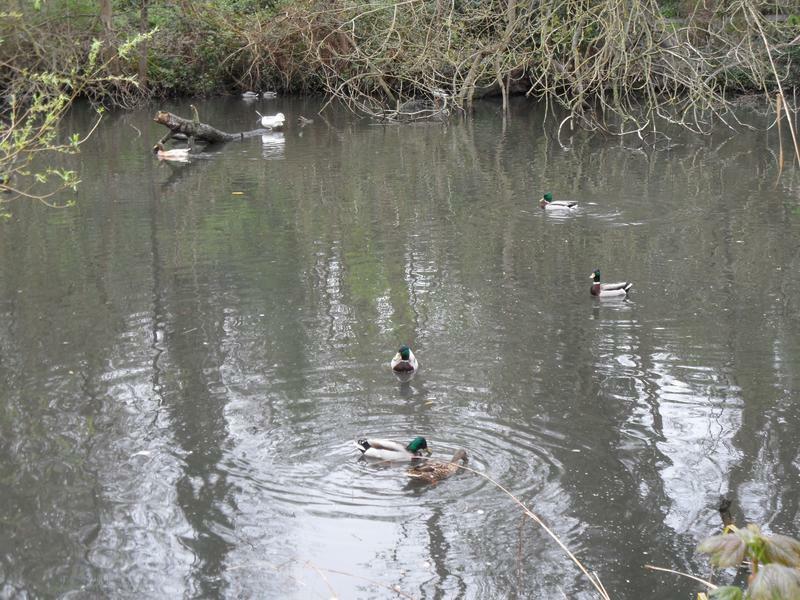 No geese, but lots of Mallards. 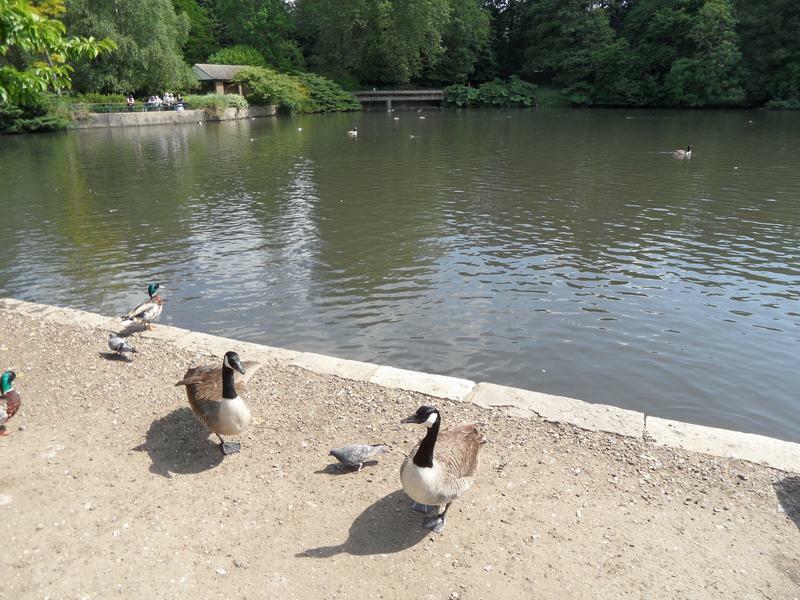 A few geese on the upper lake. 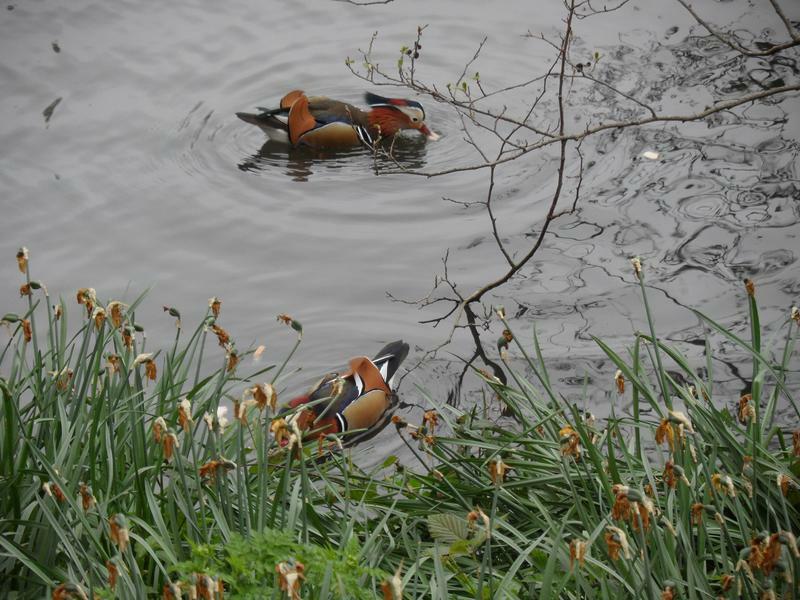 And lots of Mandarin ducks on the grass. 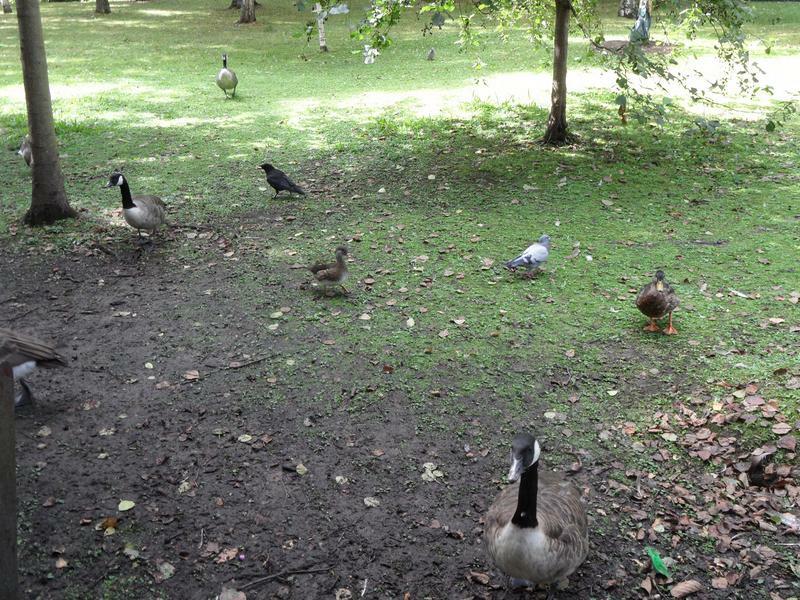 Who all wake up when they realise food is available. 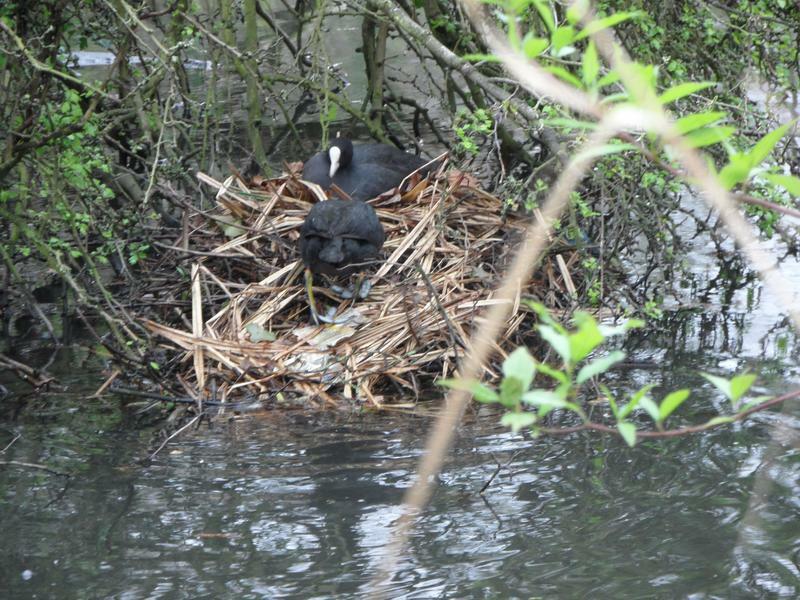 A cat in the background. 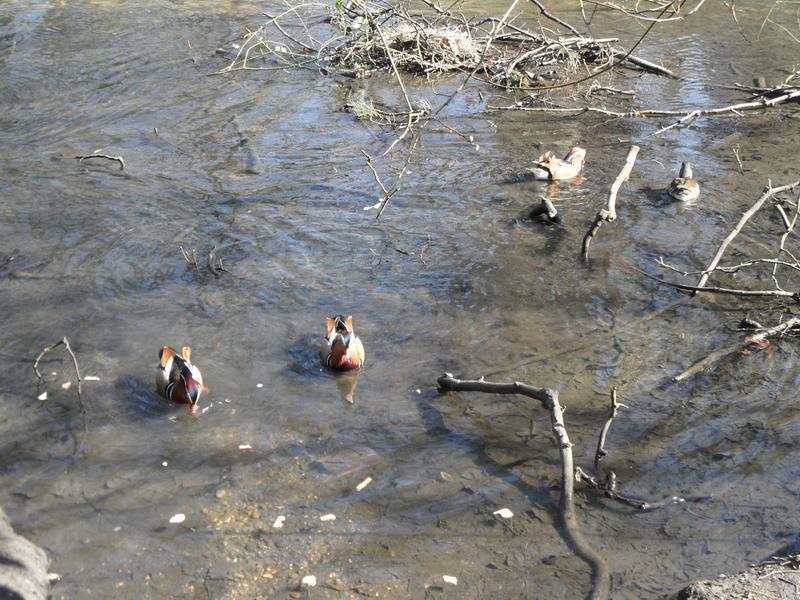 Some of the Mandarins head into the water. 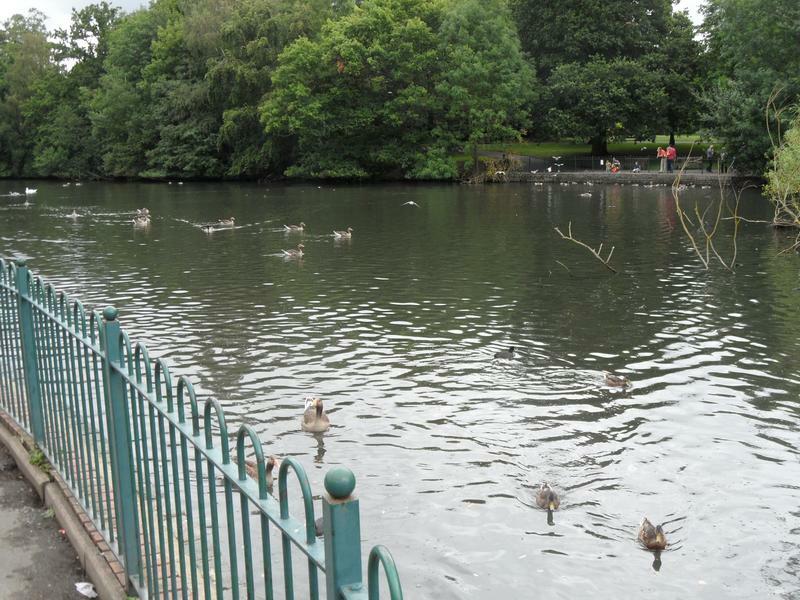 The main lake seem peaceful as well. 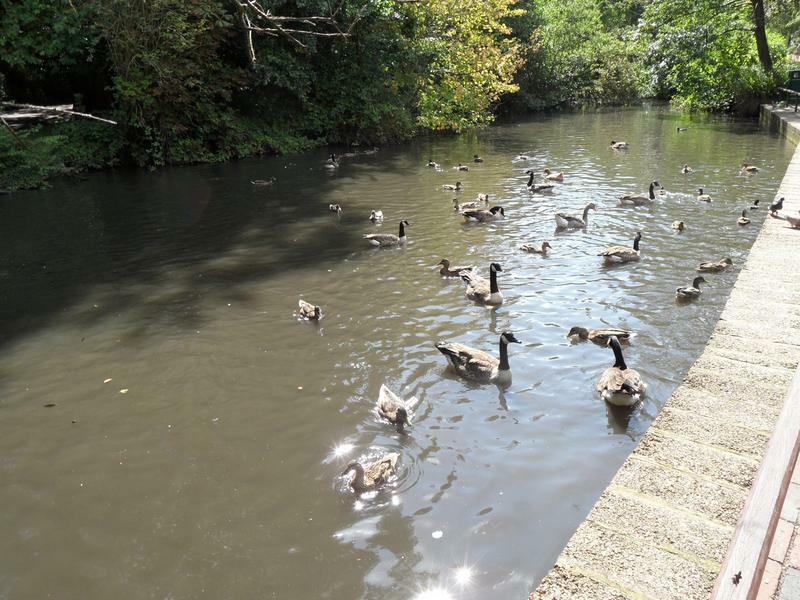 But various geese and ducks arrive looking for food. 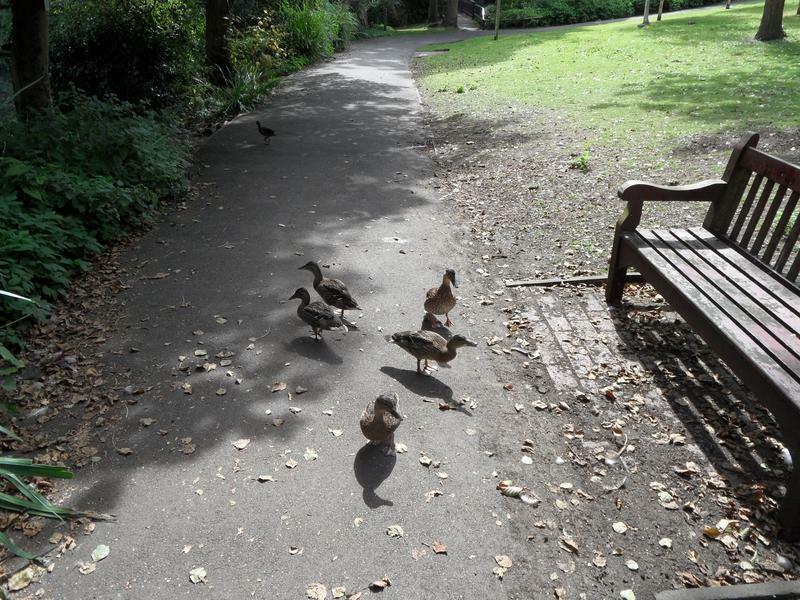 And follow me down the path. 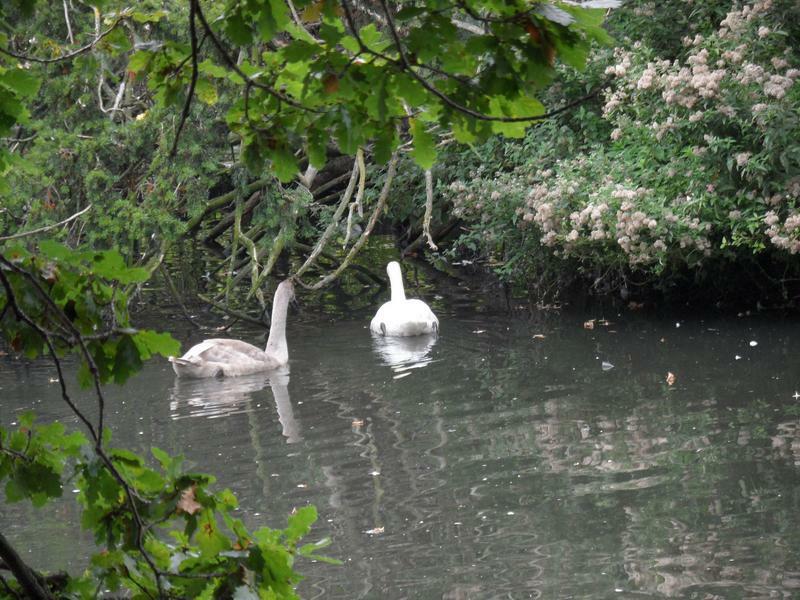 An adult swan and one cygnet, looks about two thirds grown after about two months. 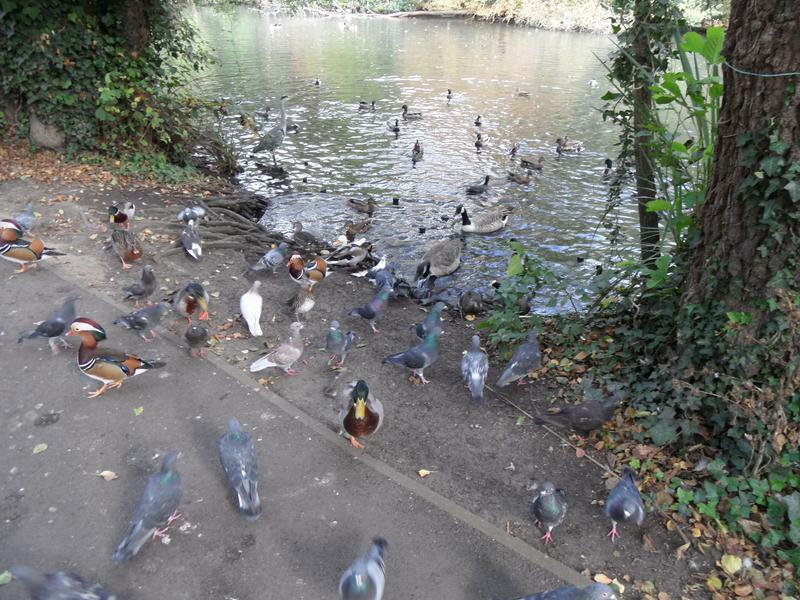 Lots of birds looking for food. 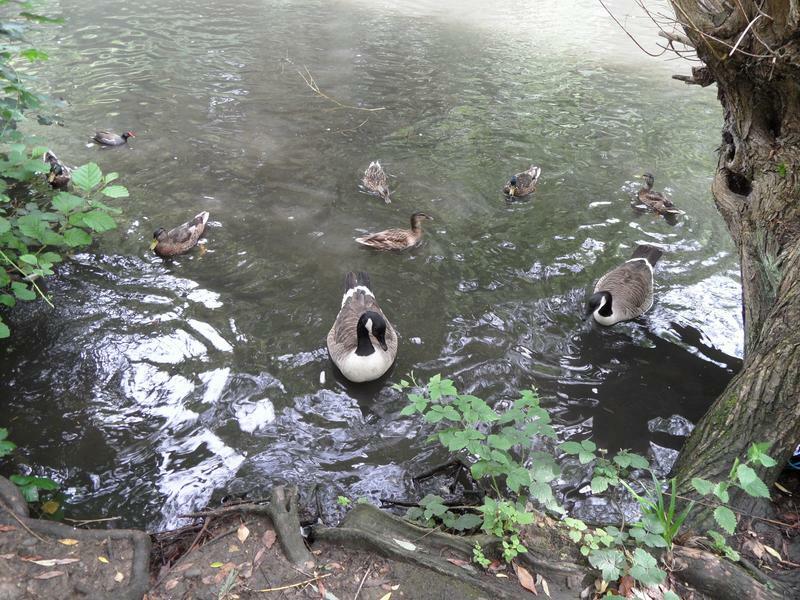 Last summer they were several groups of goslings here, but seemingly only adults this year, unless they've grown up and we missed it. 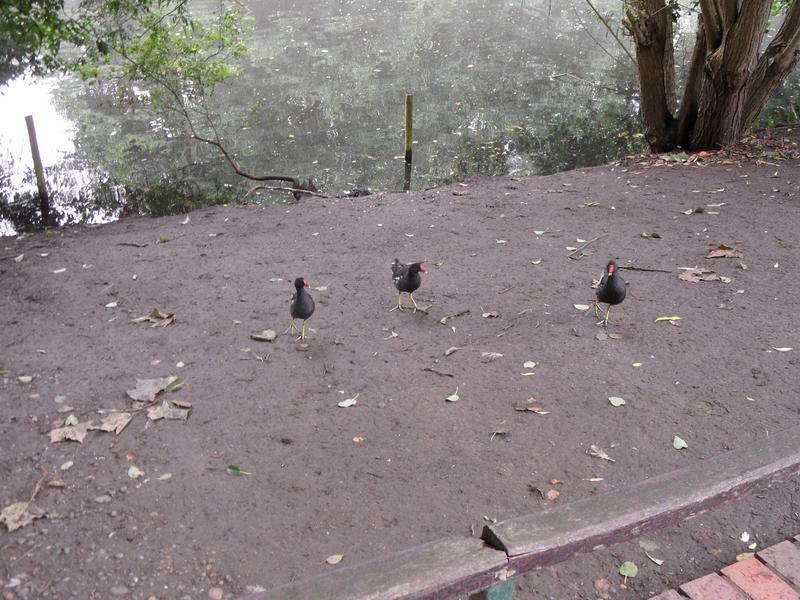 Three Moorhens looking for food. 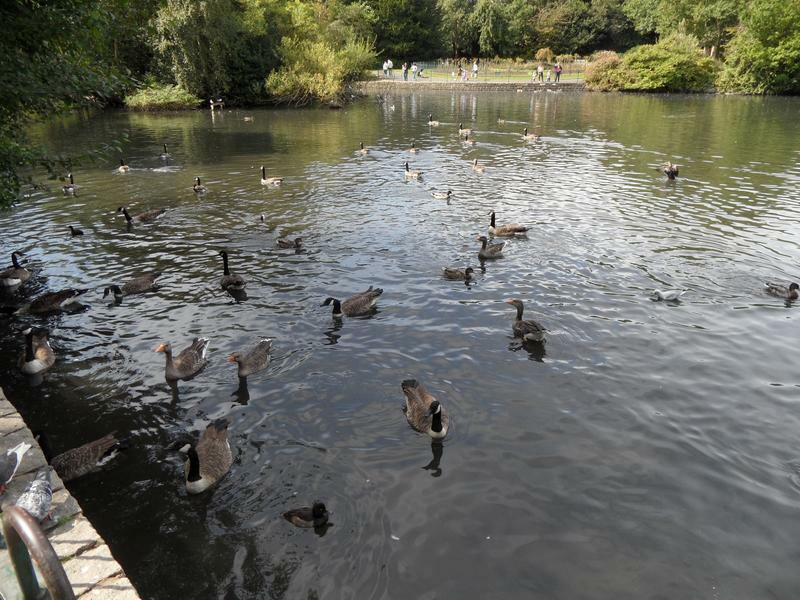 The lower pond has various geese and ducks. 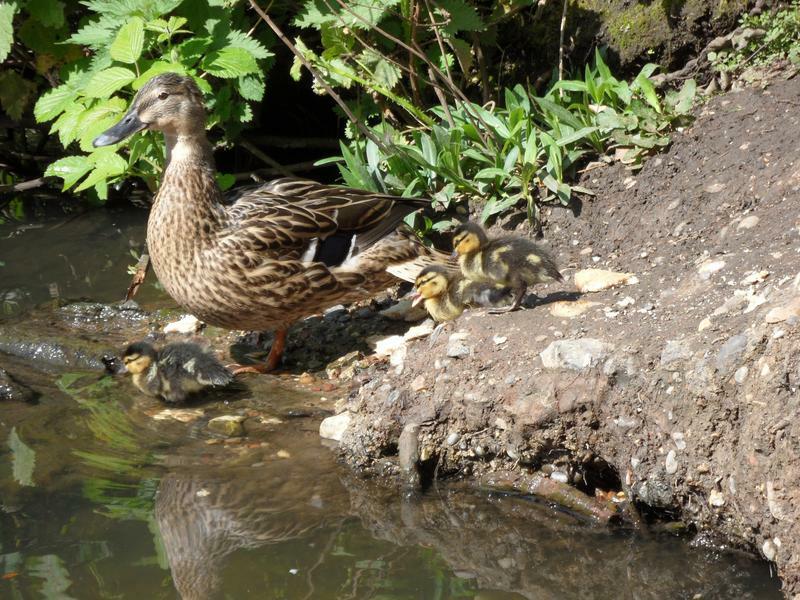 A Mallard has two ducklings. 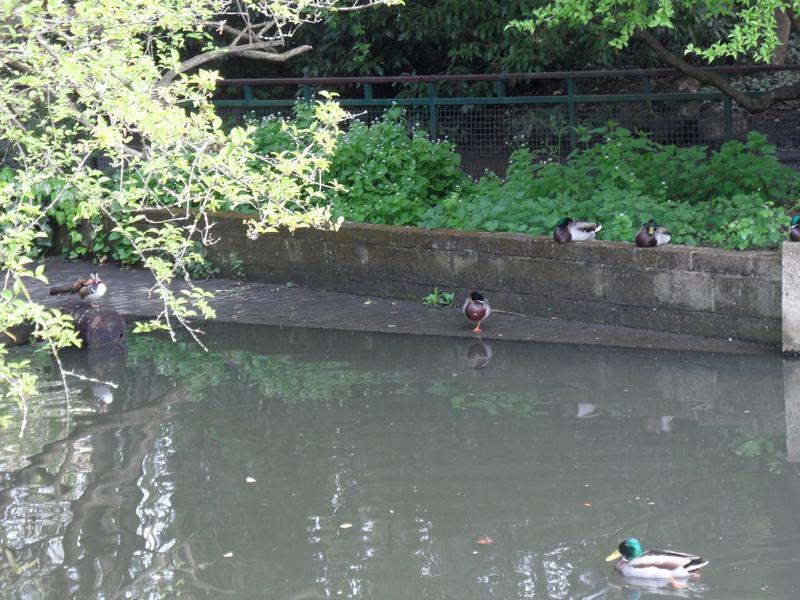 The Mallard and her two ducklings again. 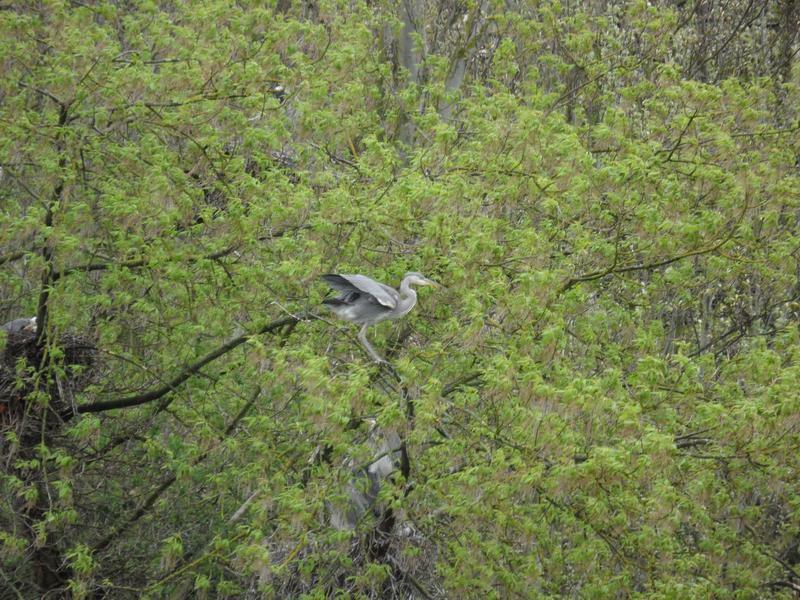 Should be 10 or more, herons probably got the rest. 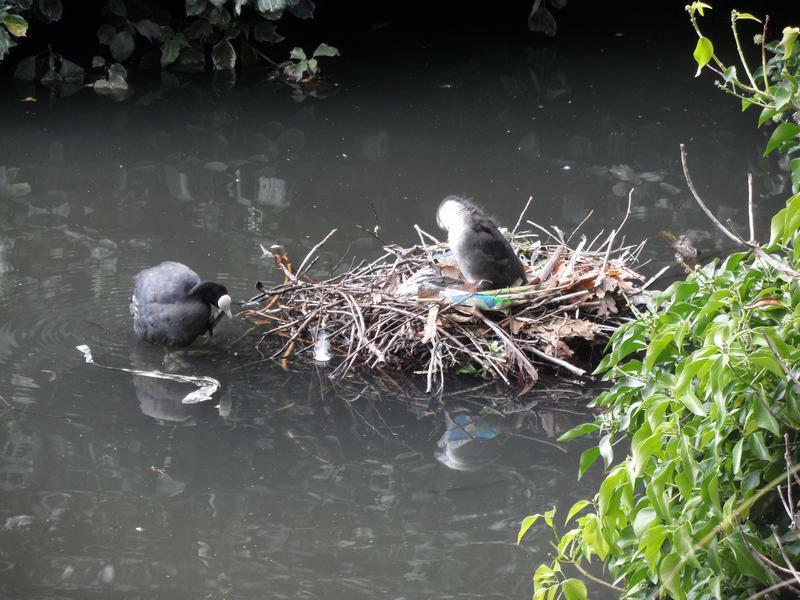 A Moorhen and her two chicks. 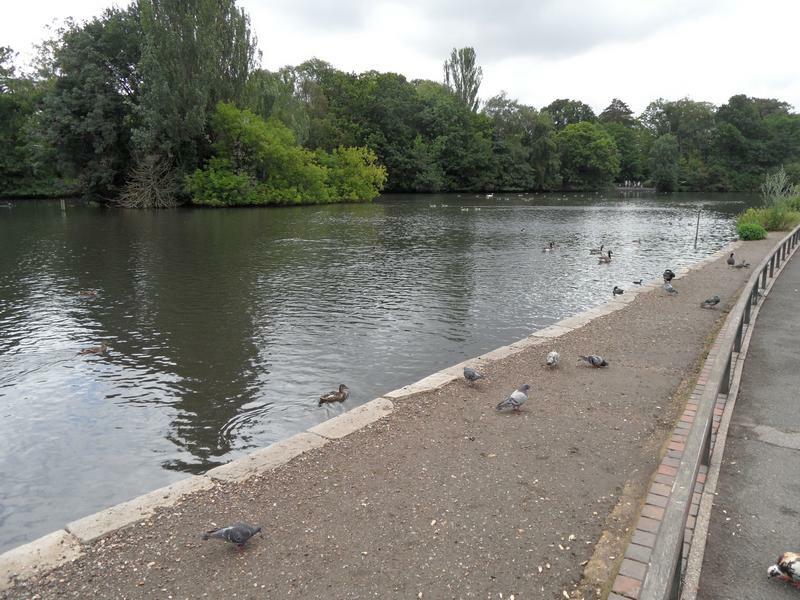 24th July 2014, the upper pond is deserted! 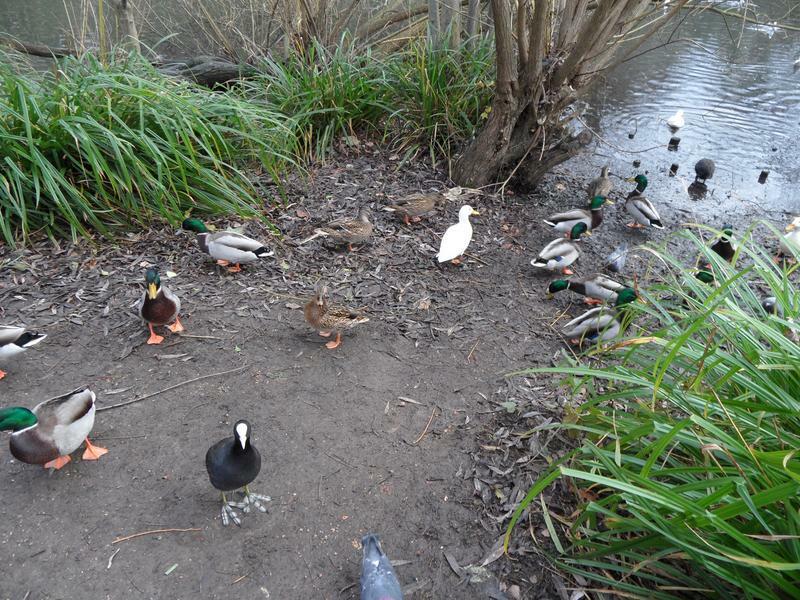 This was a rare late afternoon visit, maybe the birds are all napping after a busy day? 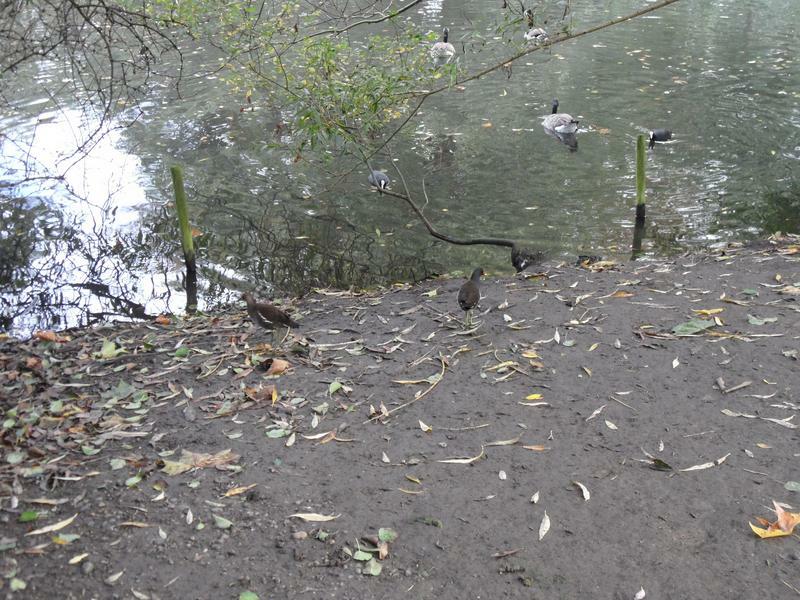 But a Moorhen is waiting on the path for food. 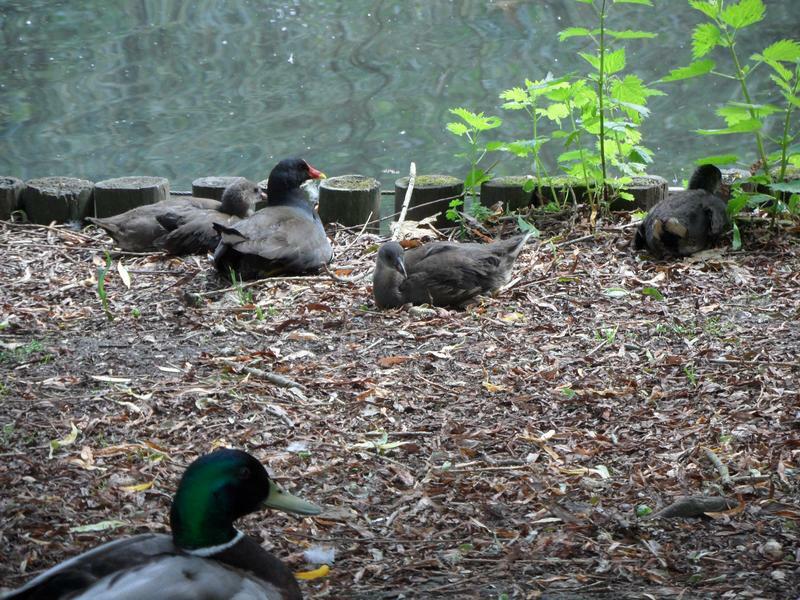 Four Mallards sleeping together beside the lake, probably almost full grown ducklings. 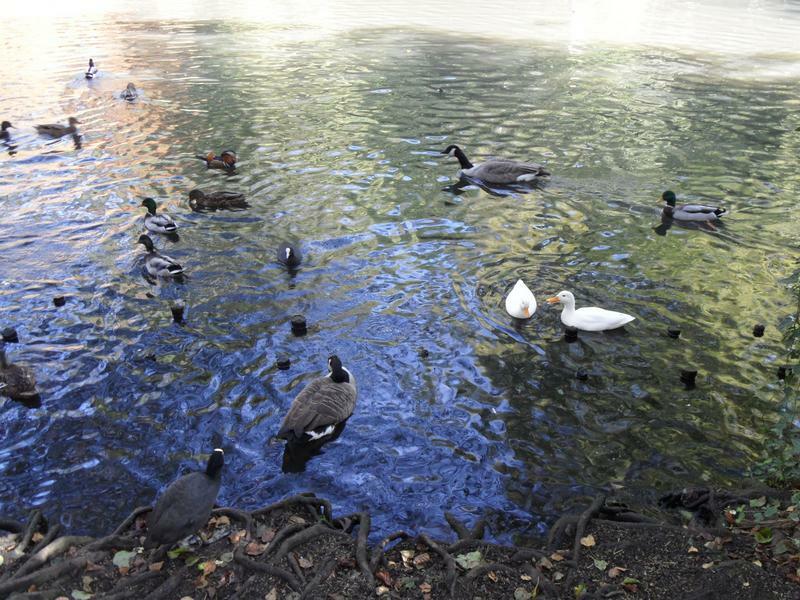 Geese and Mallards and Mandarins now appear. 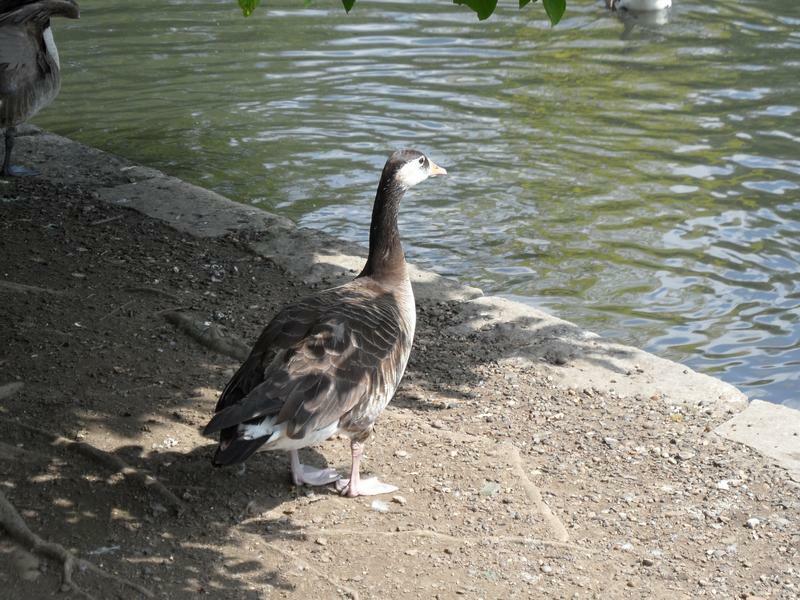 One Graylag goose near the main lake, but still very quiet. 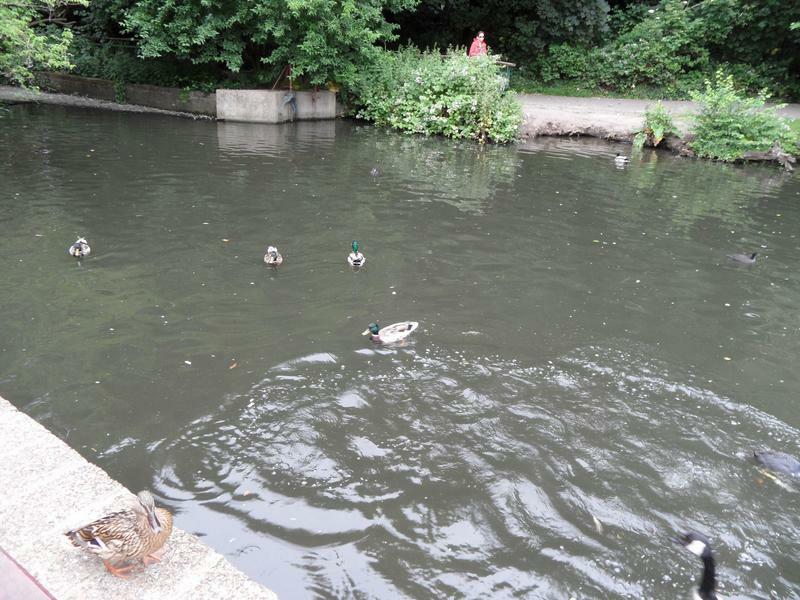 9th August 2014, a morning visit again, much busier, all very hungry. 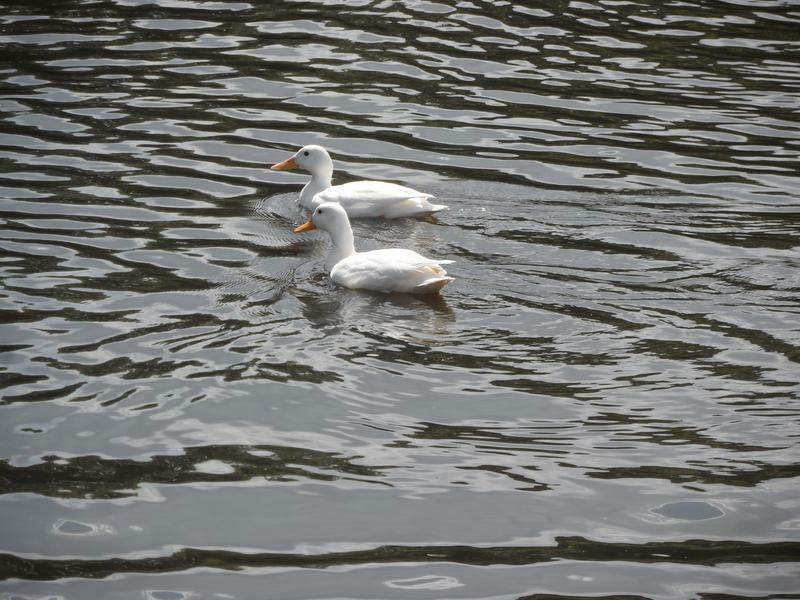 More Mallards on this lake. 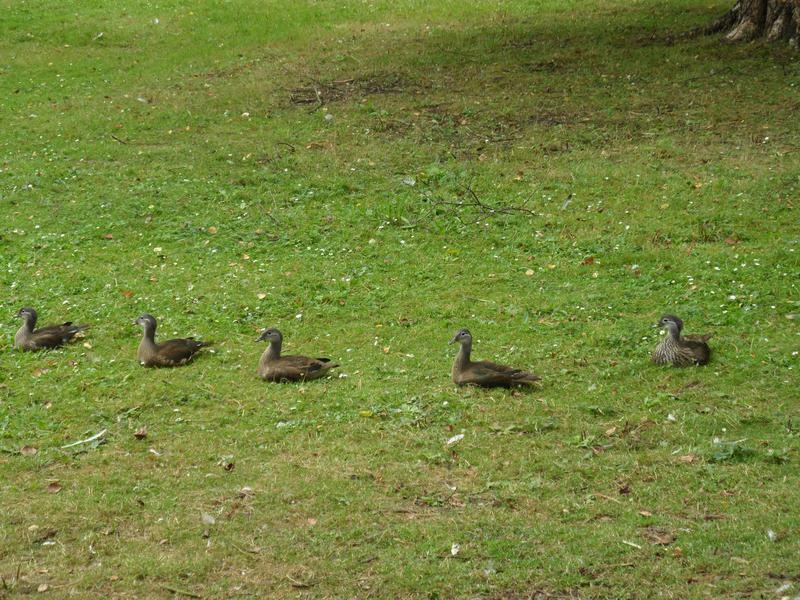 Mandarins on the grass again. 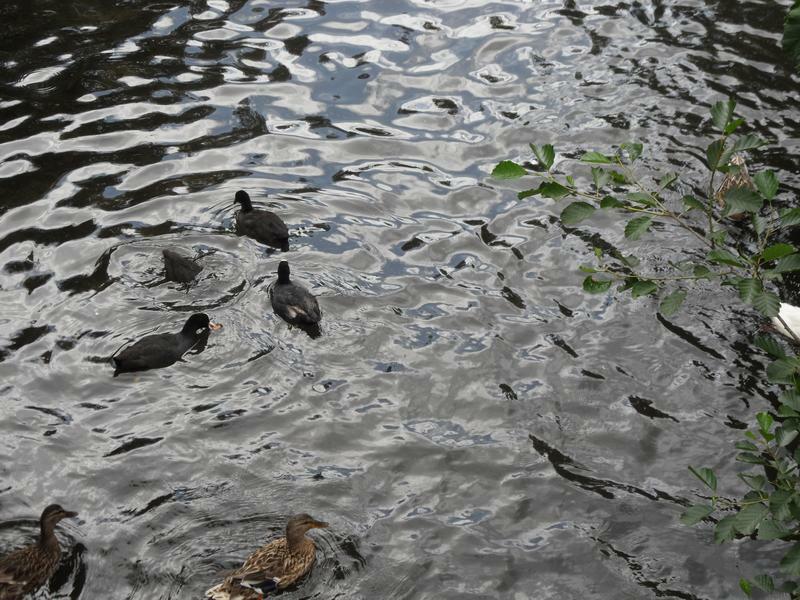 More Mandarins on the water. 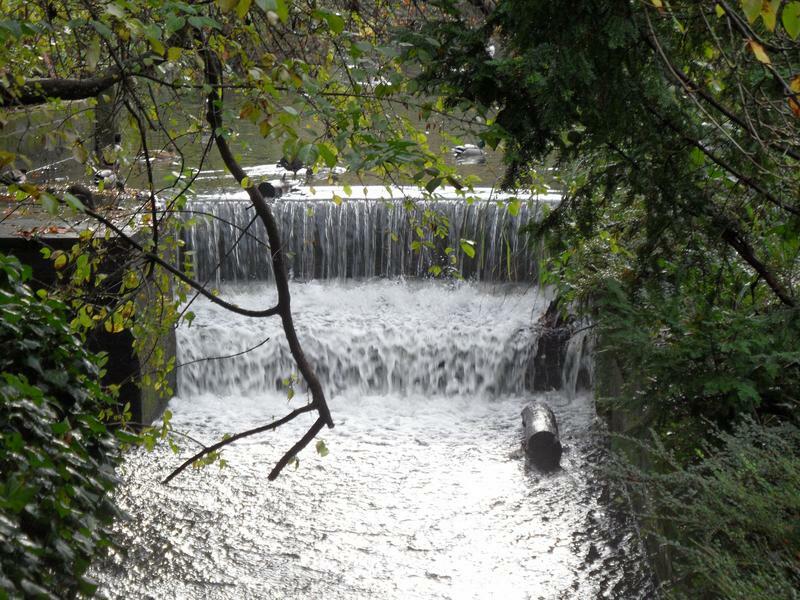 Heavy rain the previous day, so the waterfall is in good flow. 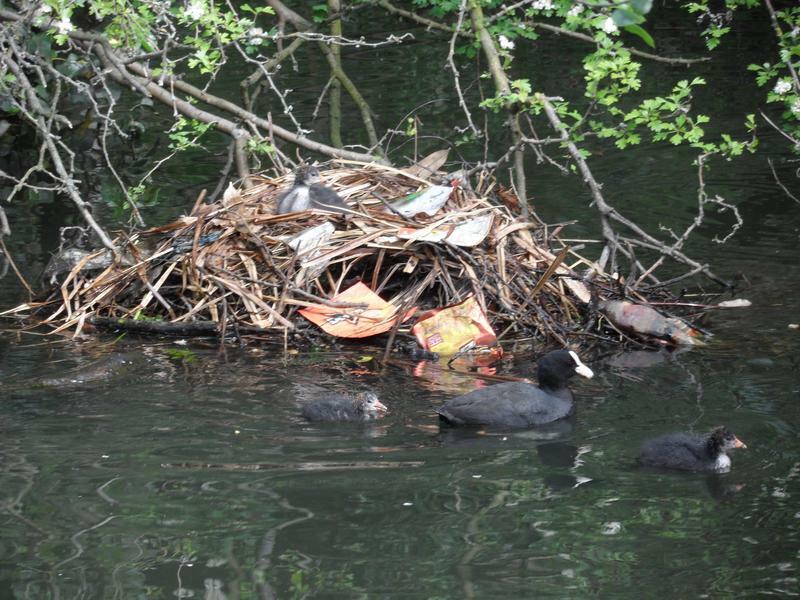 The Coots are still nesting and raising chicks. 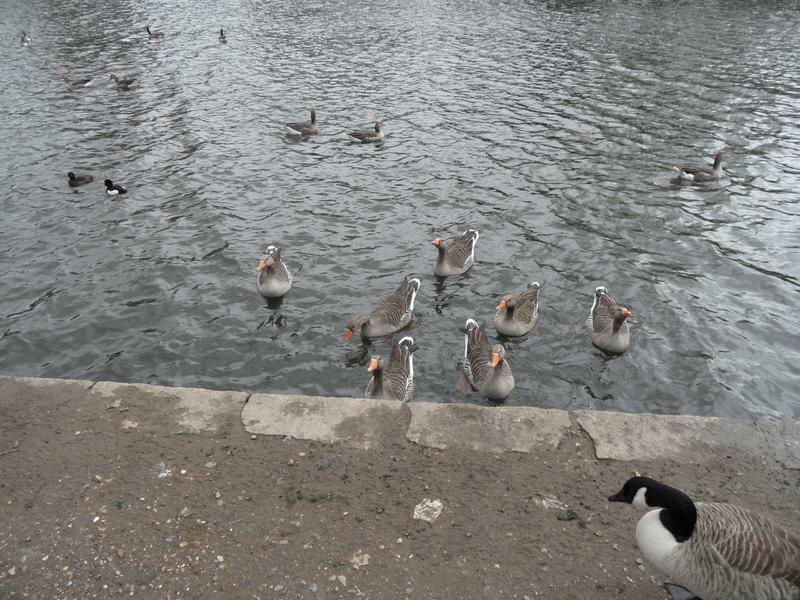 Graylag Geese waiting for food. 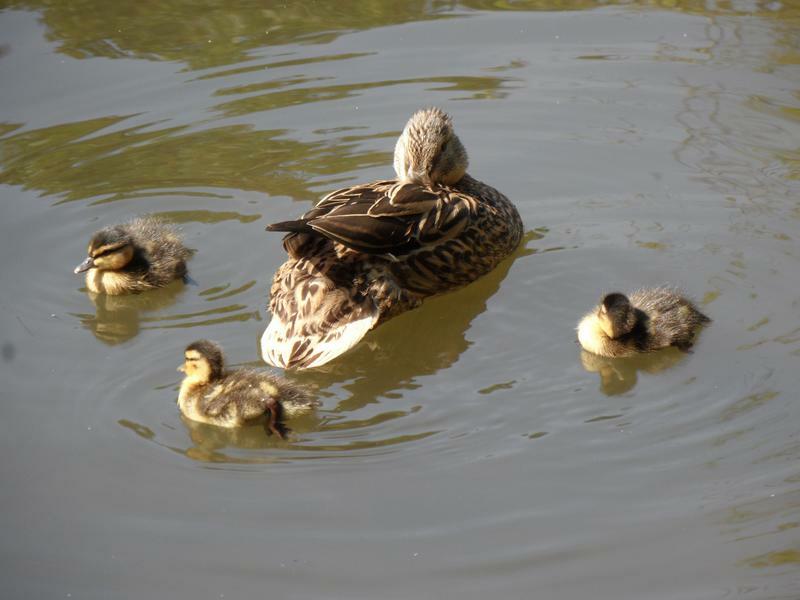 A Mallard with three ducklings, about four weeks old. 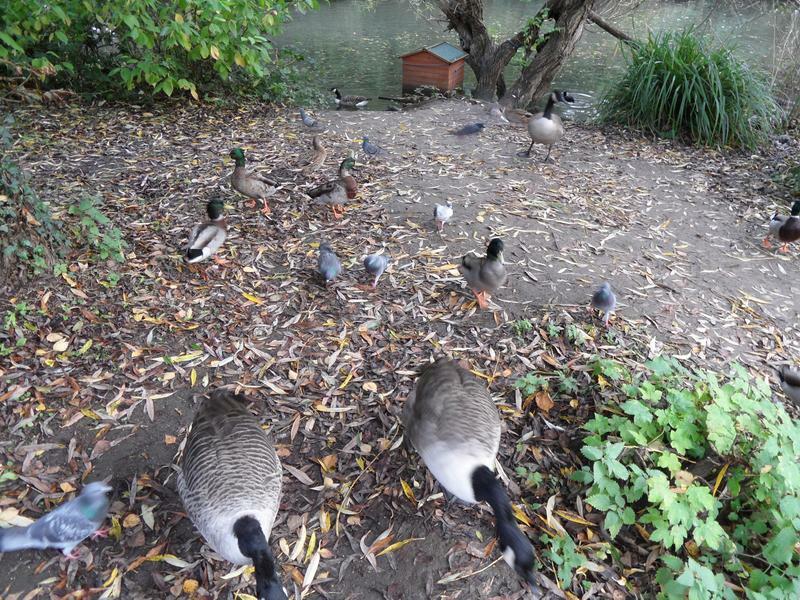 More Graylag and Canada Geese, Coots and Mallards. 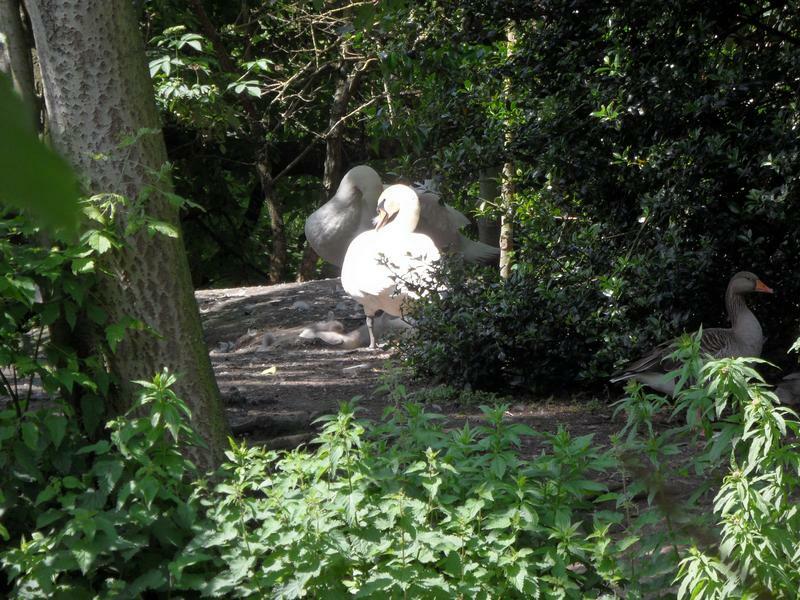 The cygnet swan watched by one parent. 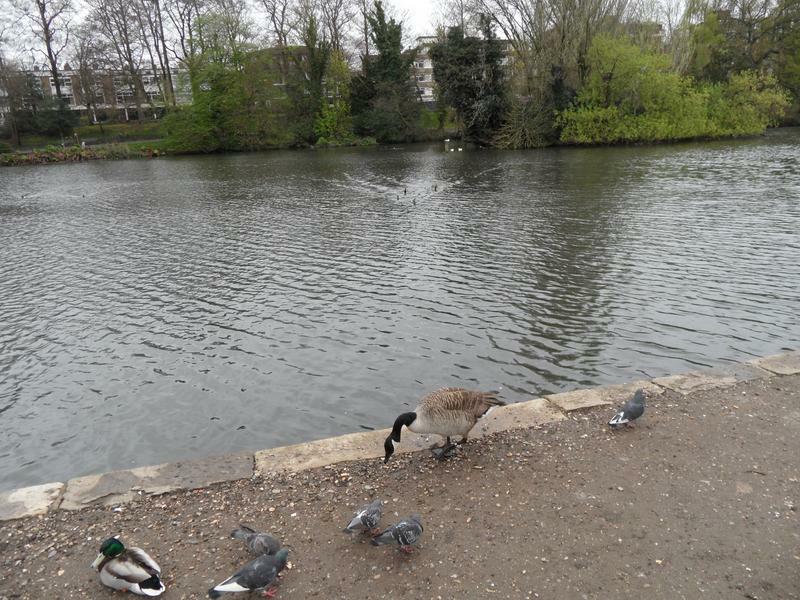 Now joined by the other parent, eating duck pellets, since I've already fed three loaves of break to the birds before reaching here. 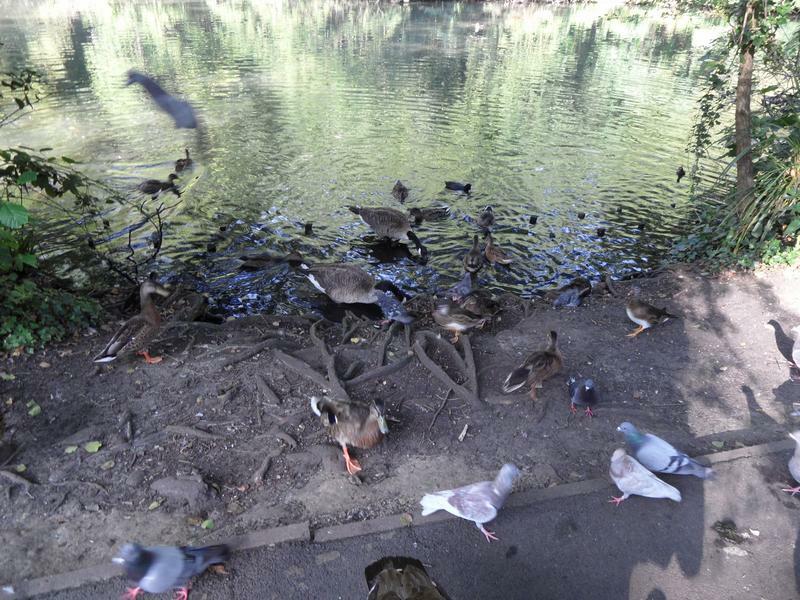 Lots more birds underneath the bridge over the top lake. 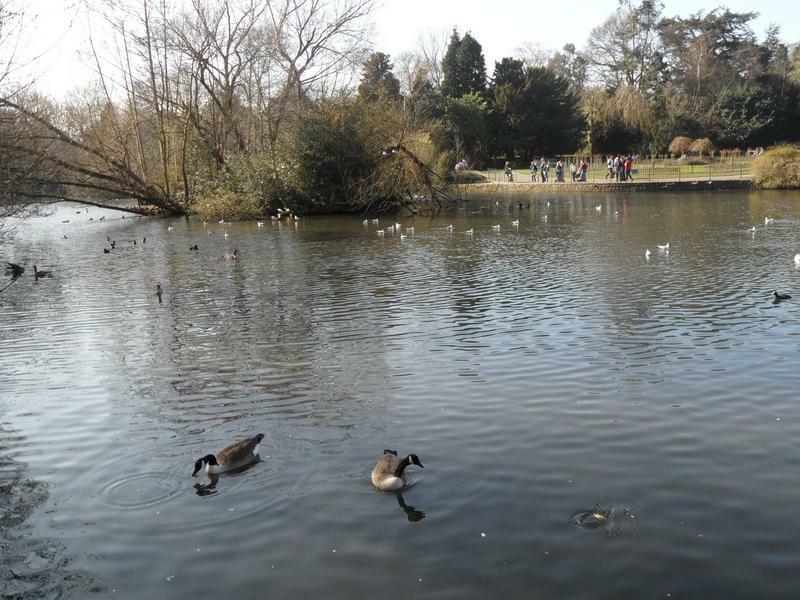 And more on the bottom pond. 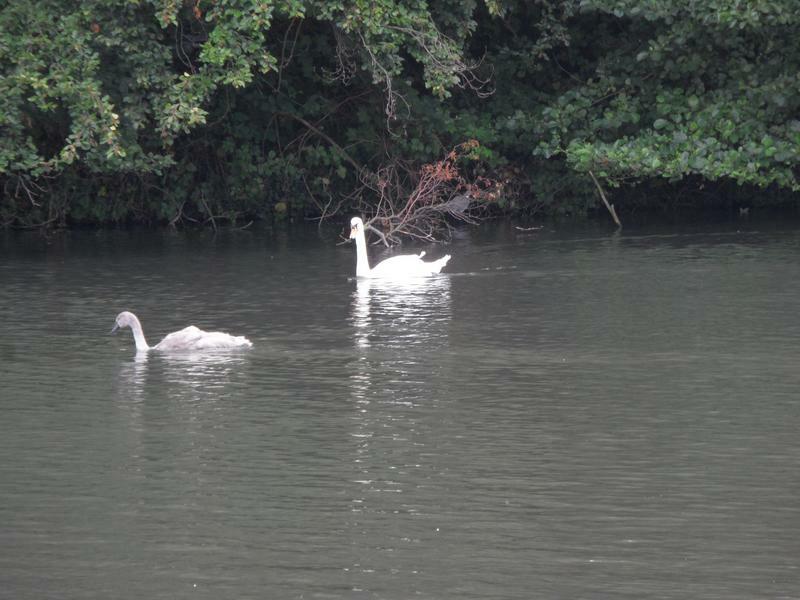 The three swans have finished eating so back on the bottom lake, the darker coloured cygnet is almost fully grown. 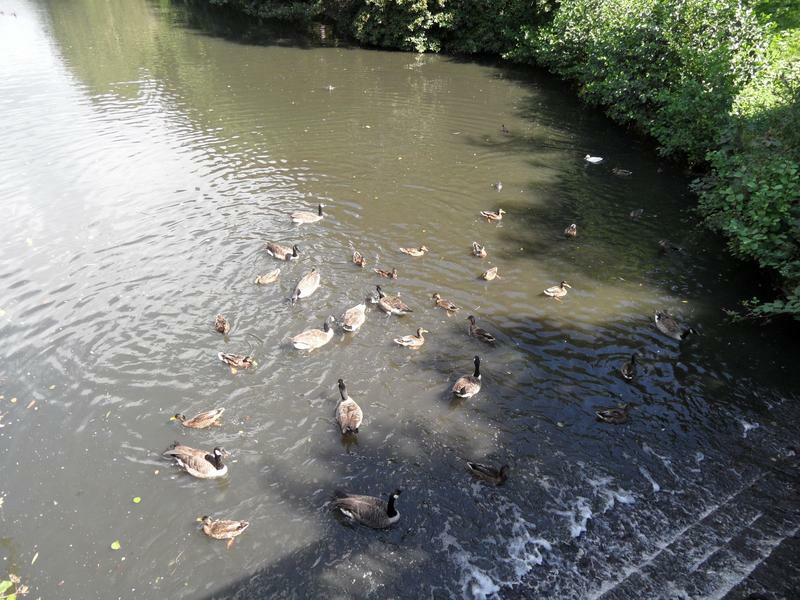 24th August 2014, no-one seems particularly hungry today. 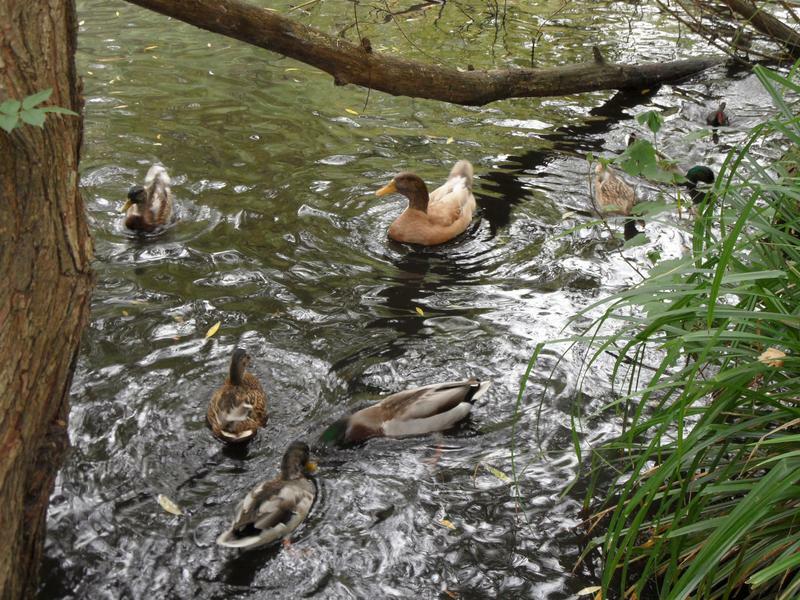 Some mallards come out of the water to say hello. 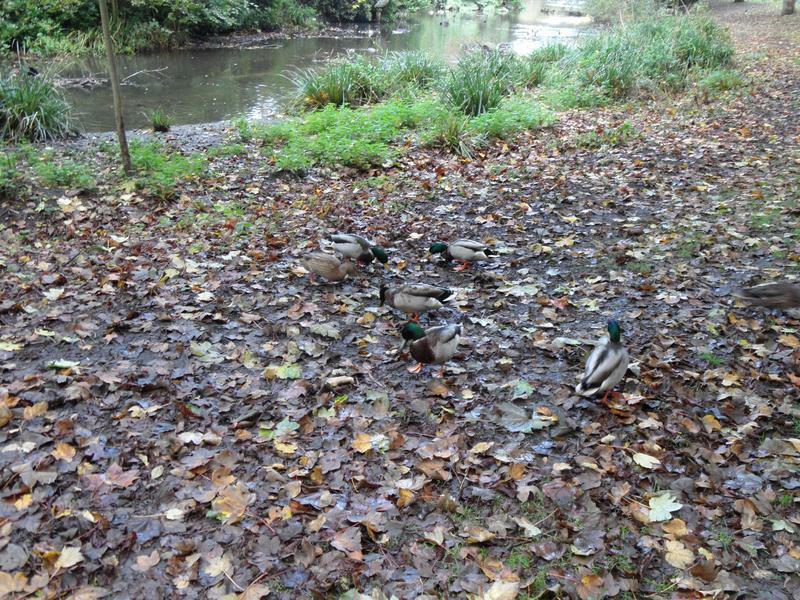 More Mallards are out on the grass. 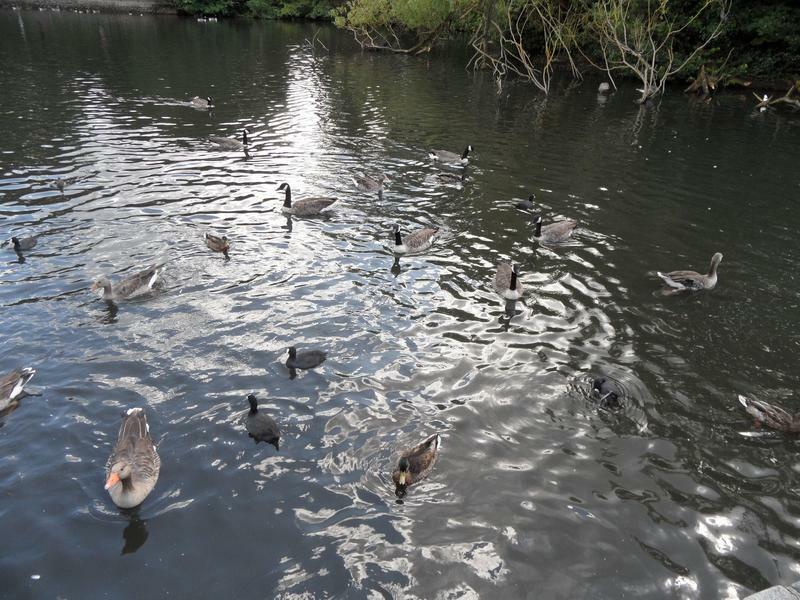 Mostly Coots on the water. 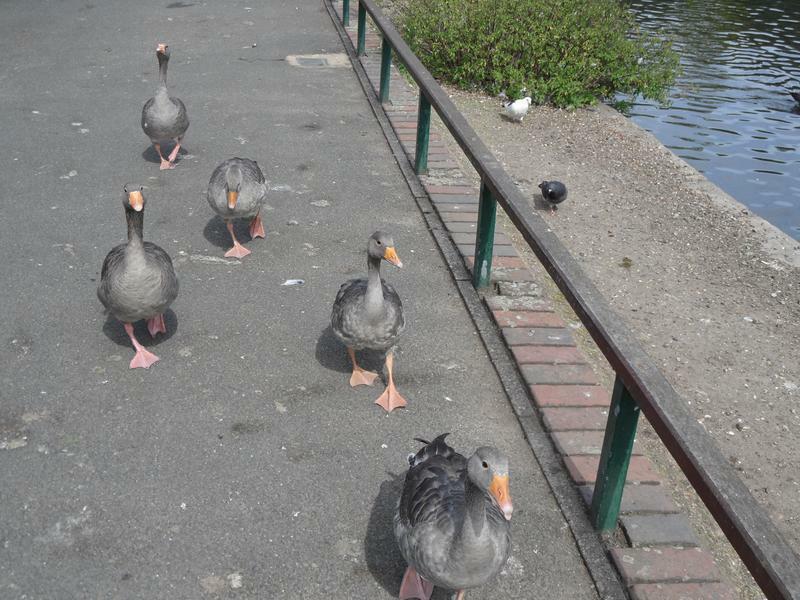 The Greylag geese are hungry though, following me down the path. 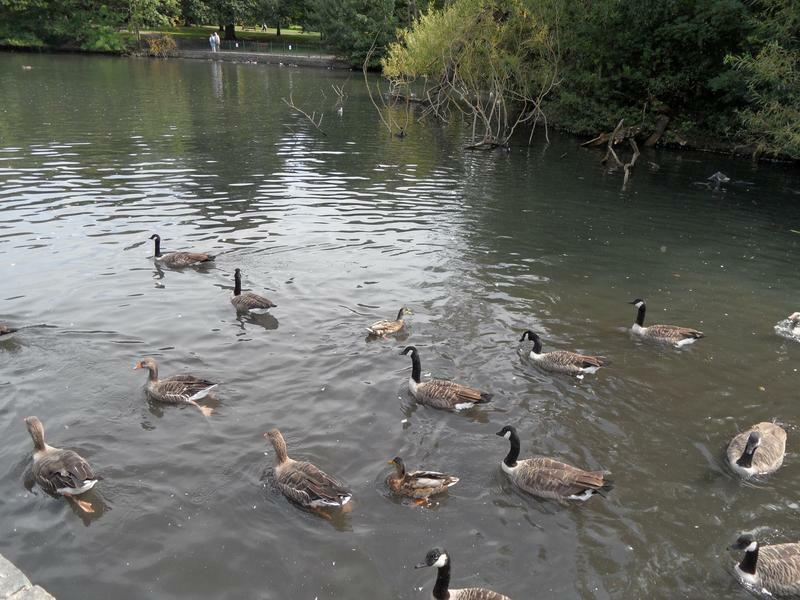 Plenty of Canada geese on the water. 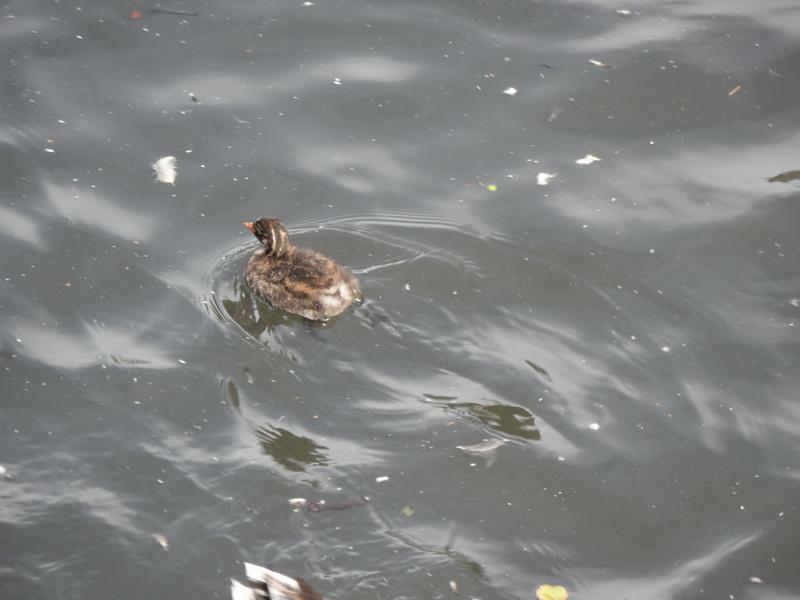 Small duckling, not sure which breed. 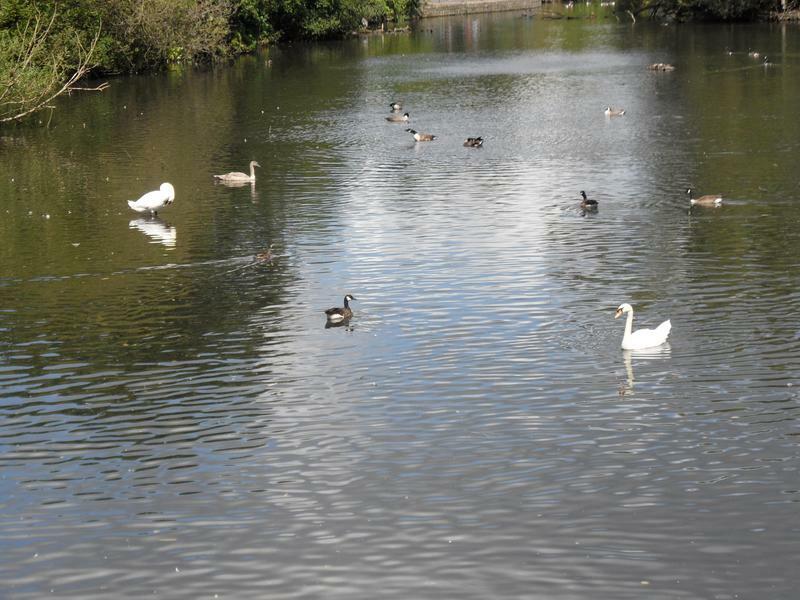 The two swans with their single remaining cygnet, and some sea gulls. 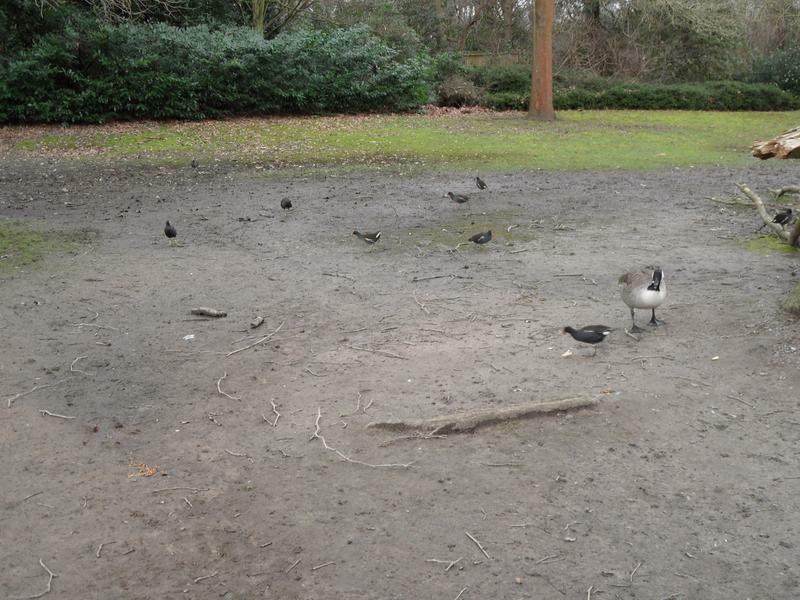 But lots of birds looking for food near the cafe. 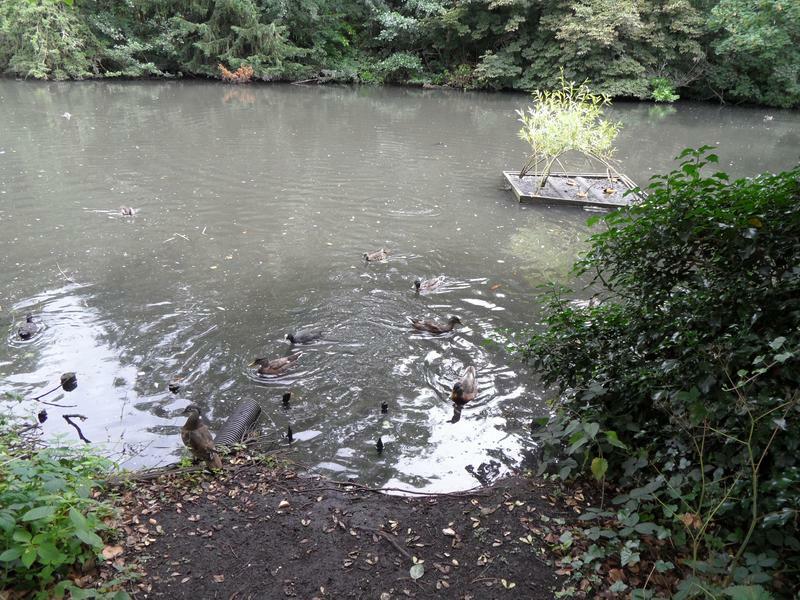 7th September 2014, again it's quiet on the top pond. 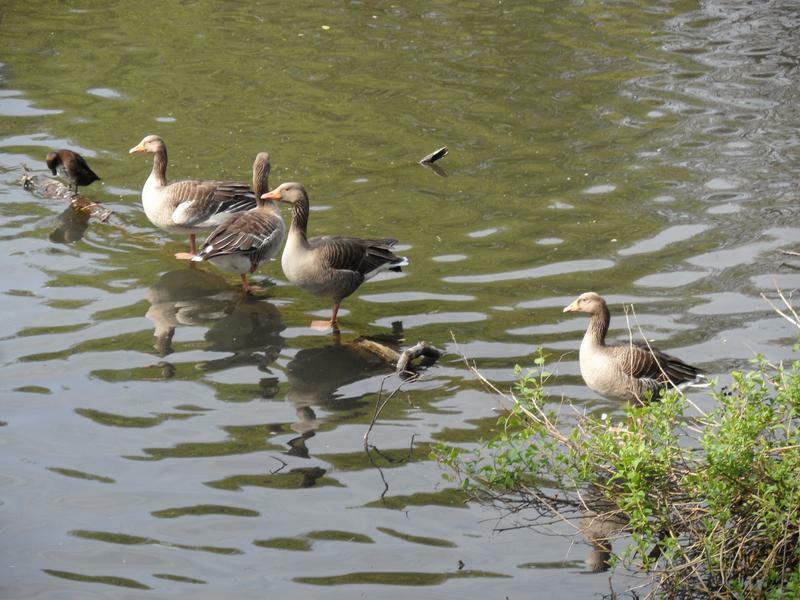 Don't often see Greylag geese up here. 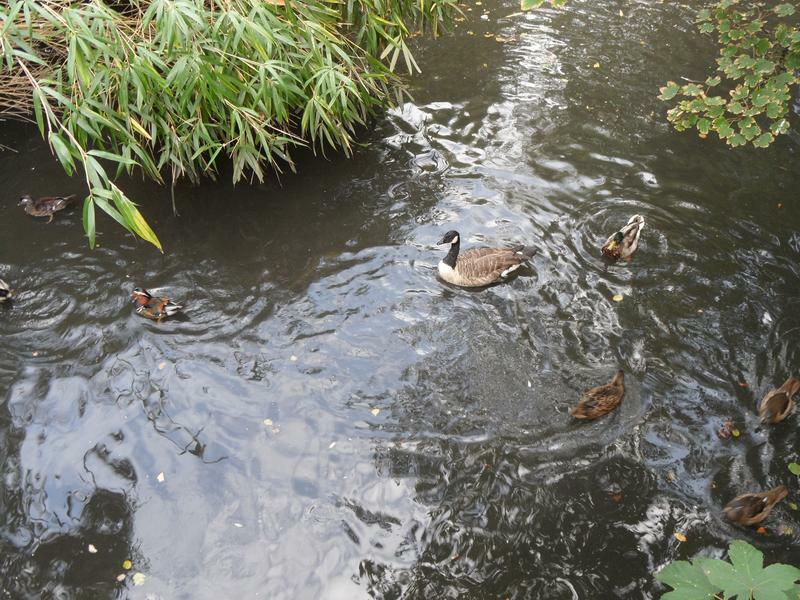 Mallards and Canada geese on the next pond. 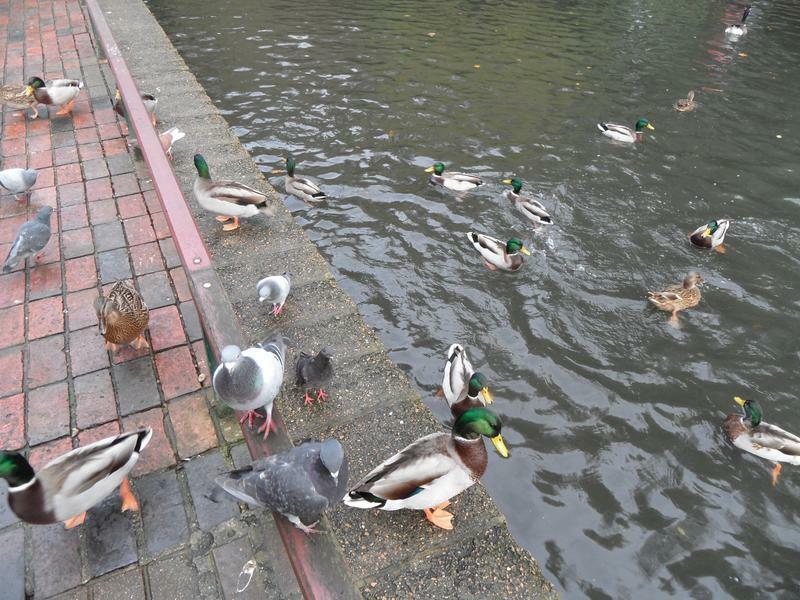 The ducks here are hungrier. 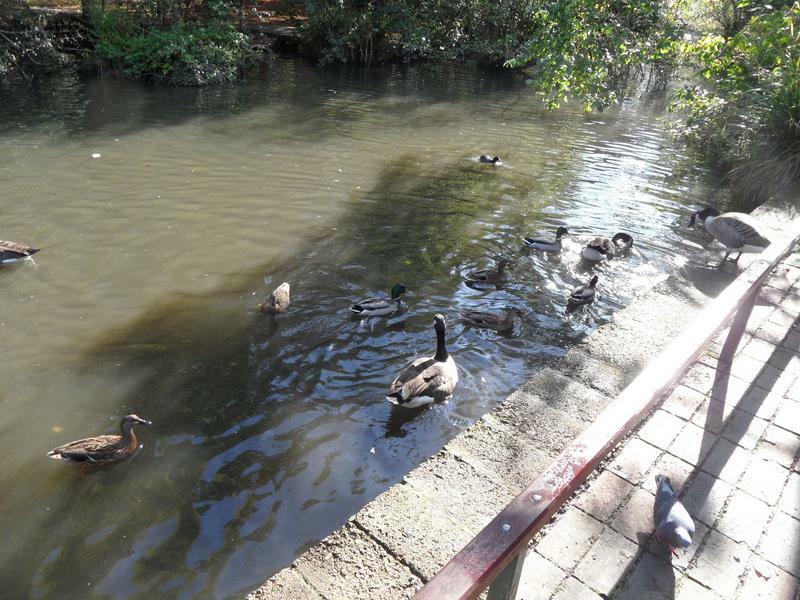 Mallards and Coots looking for food. 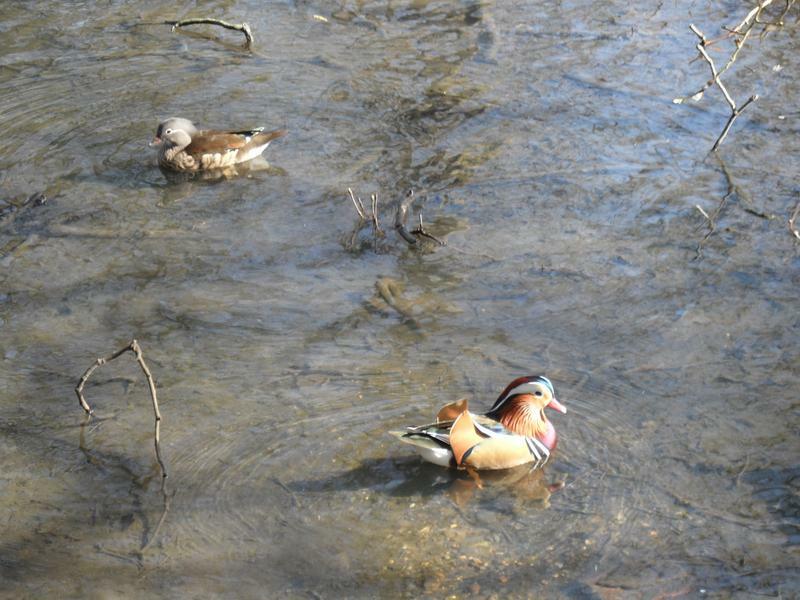 The male Mandarin ducks are slowly regaining their winter colours. 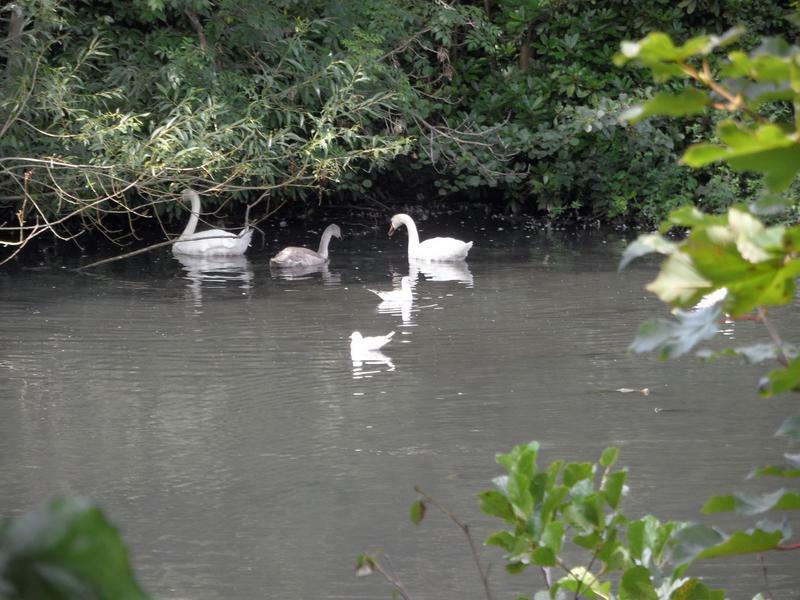 The swan family feeing on the other side of the lake. 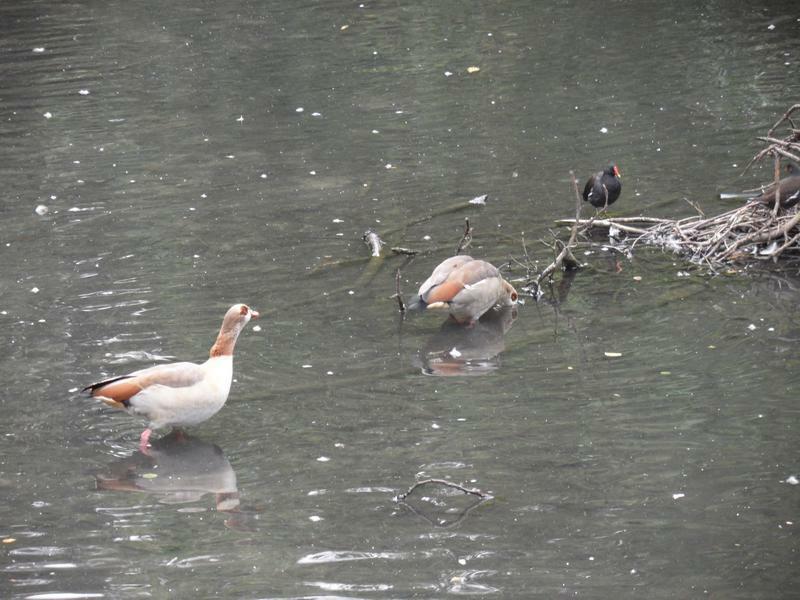 The Egyptian Geese are still living on the lower pond, with a Moorhen. 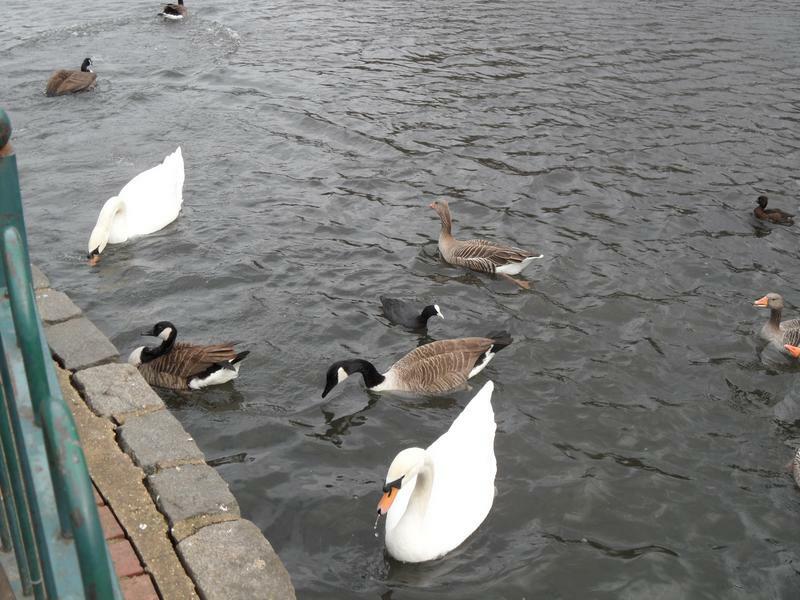 One of the swans the the cygnet. 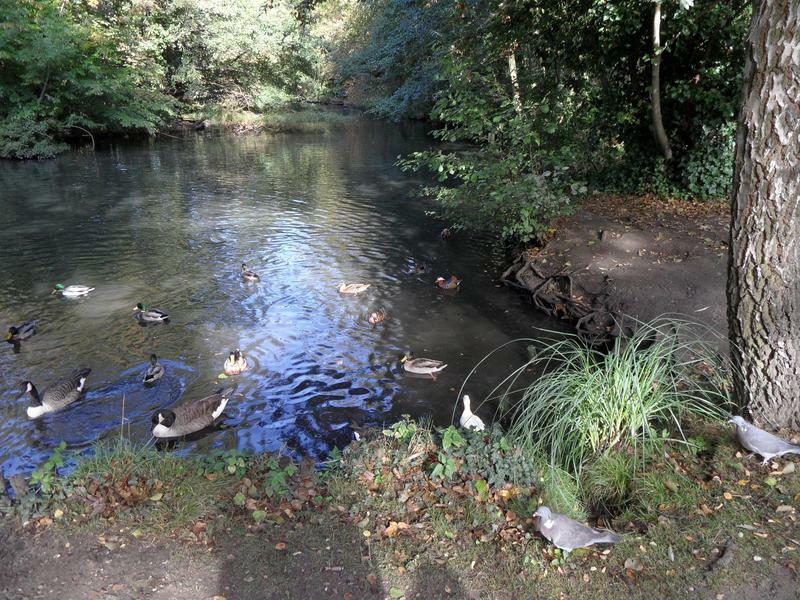 21st September 2014, again few birds on the upper pond. 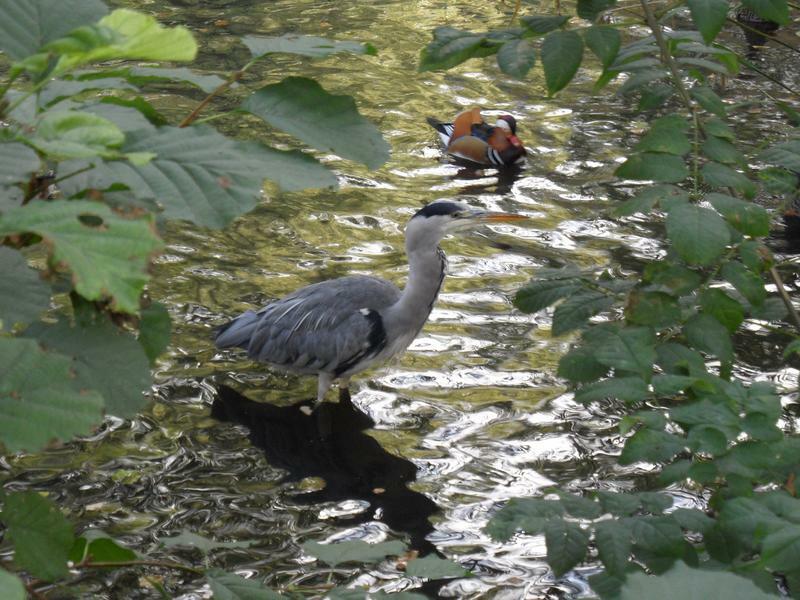 Don't often see herons this close to the path, with a Mandarin duck. 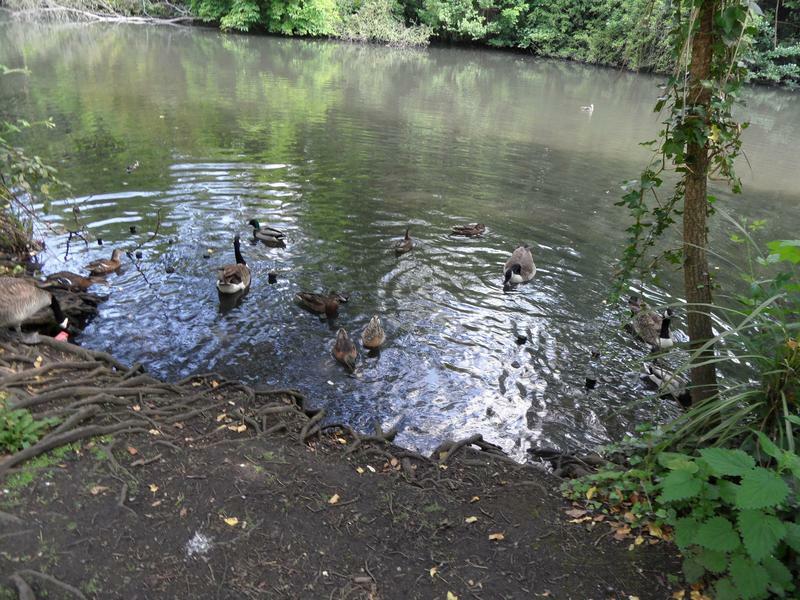 A large number of hungry ducks, geese and the heron that is following up the pond. 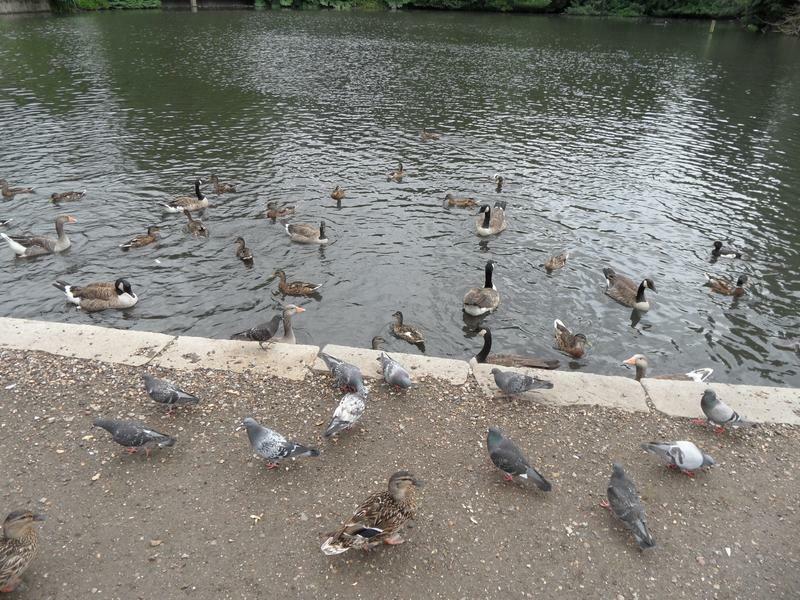 They eat a full loaf of bread in a couple of minutes. 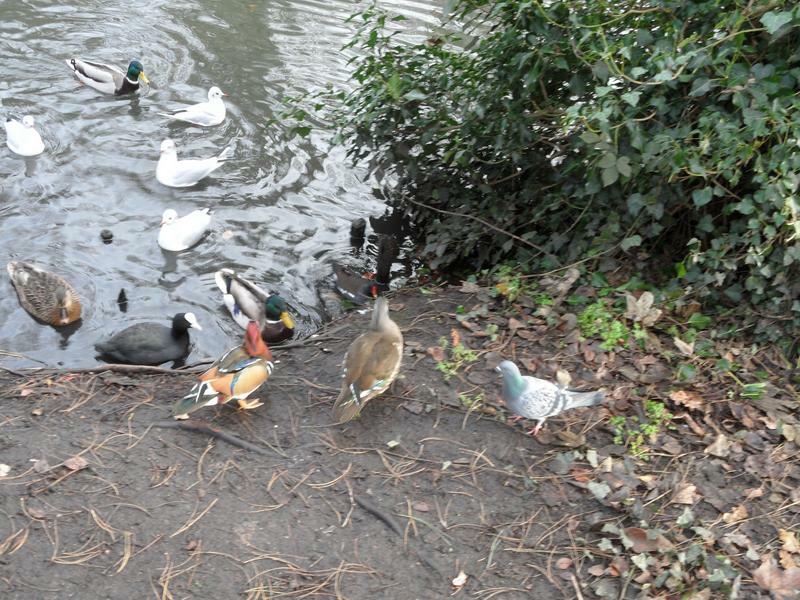 Three female Mandarin ducks and one male, the pigeons are fighting for food as well. 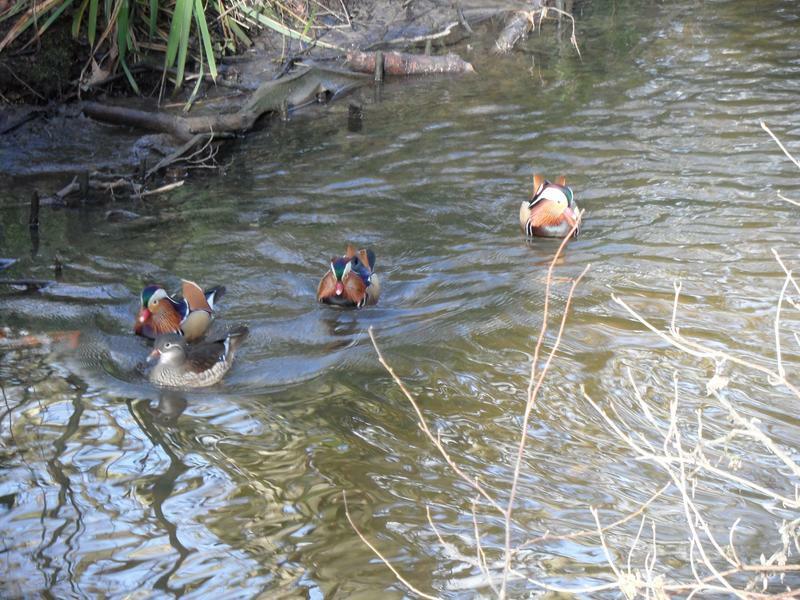 More male Mandarins have arrived. 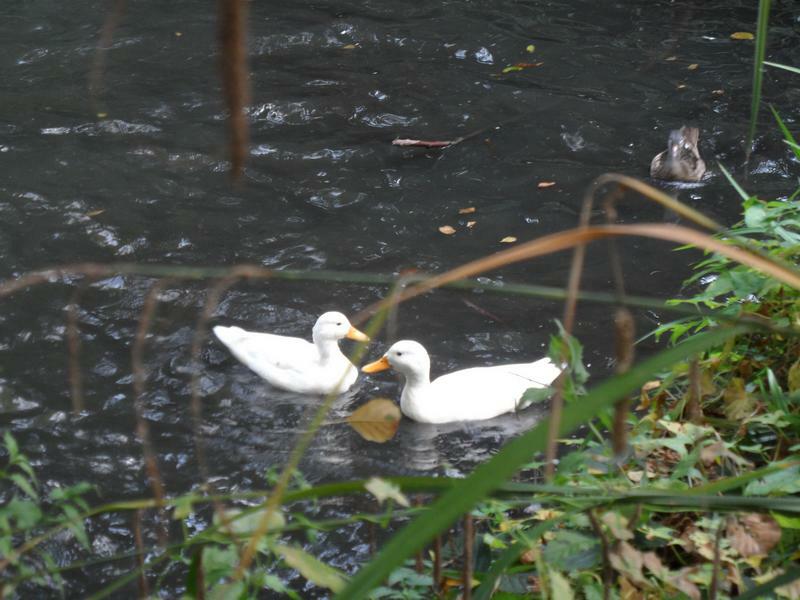 Also a pair of white ducks. 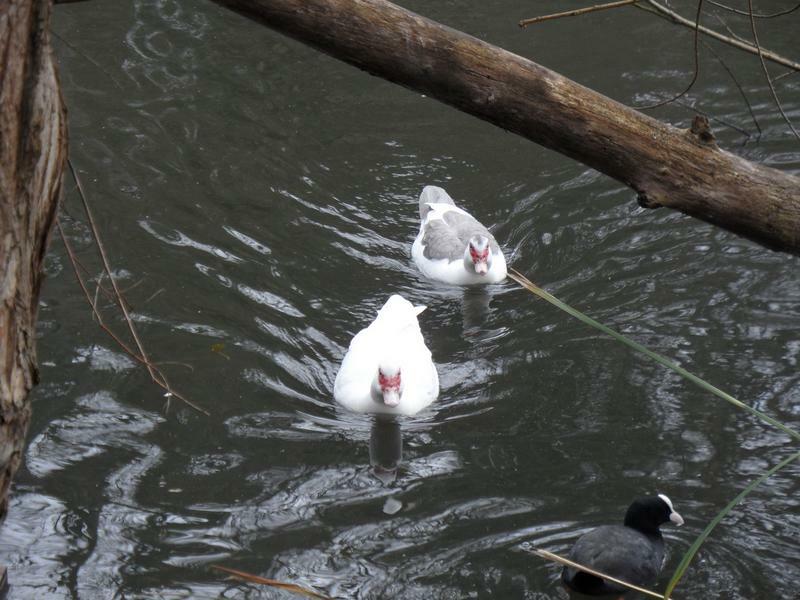 But not seen any Muscovy Ducks for a few months. 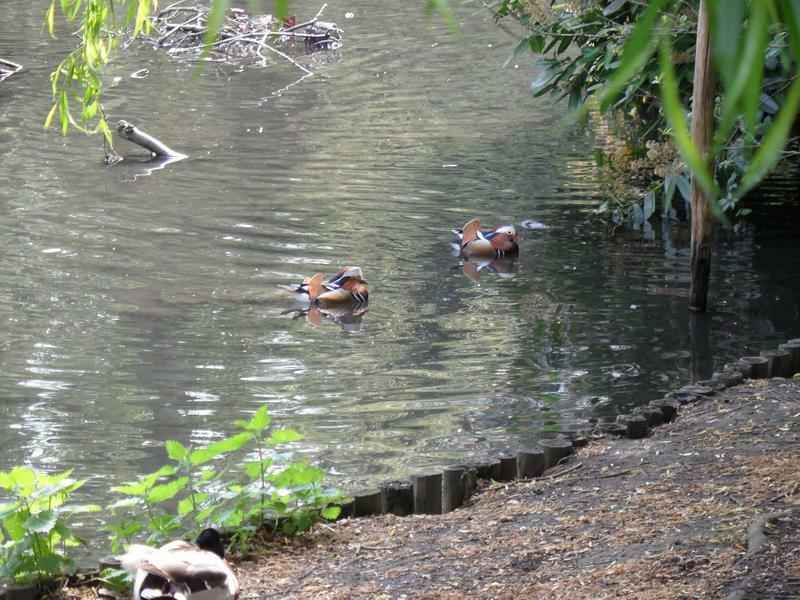 There are Mandarins on the next pond as well. 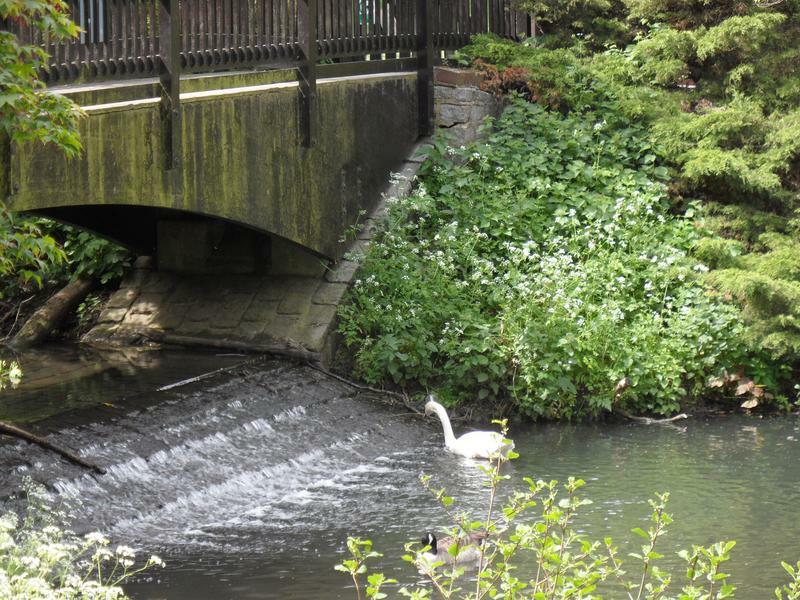 The swan family is below the waterfall bridge. 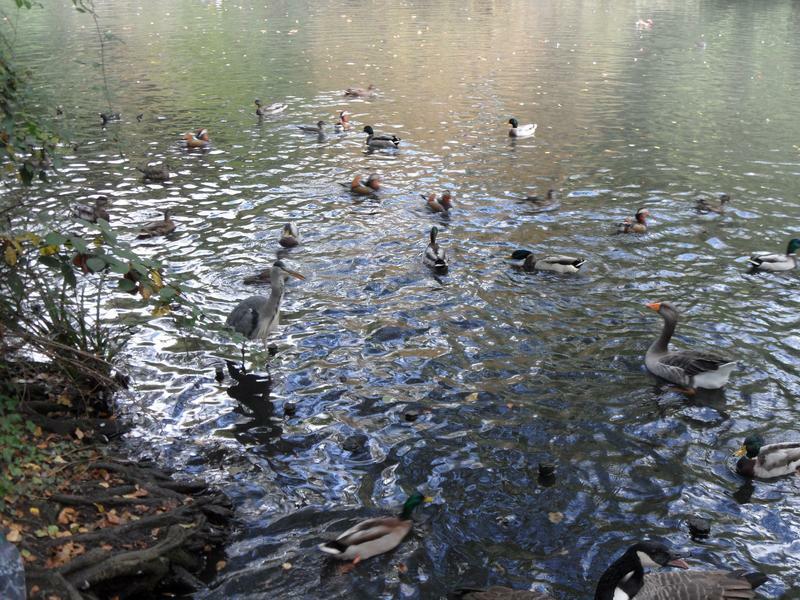 Lof of birds on the lower pond. 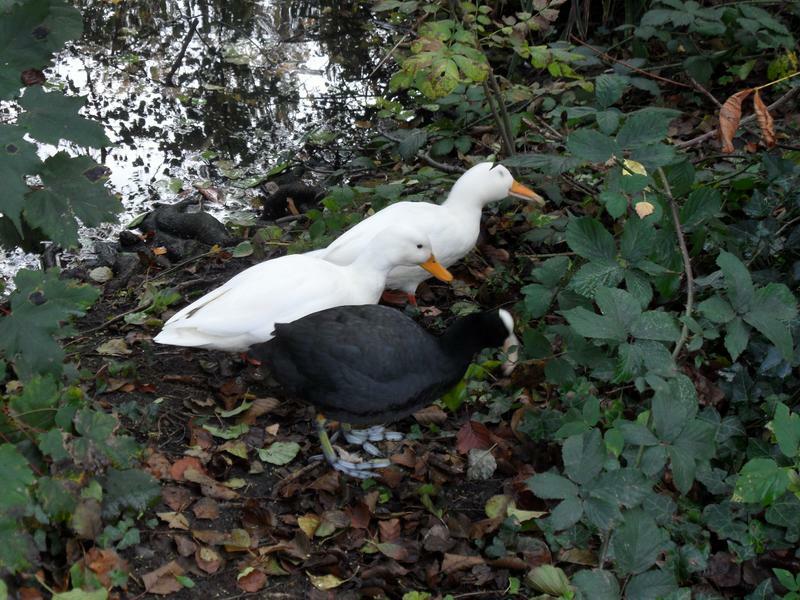 Including black and white ducks, not see a wholly black duck before. 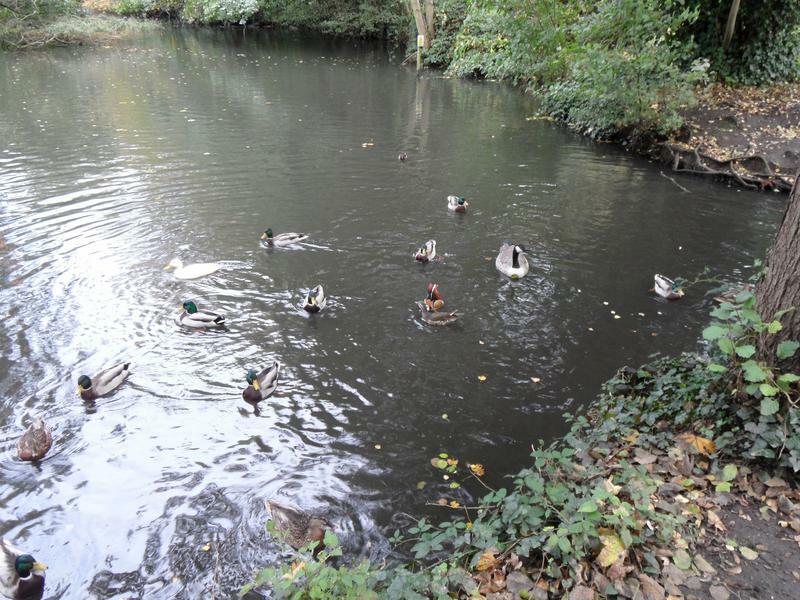 5th October 2014, getting cooler now, more interest in food on the upper pond. 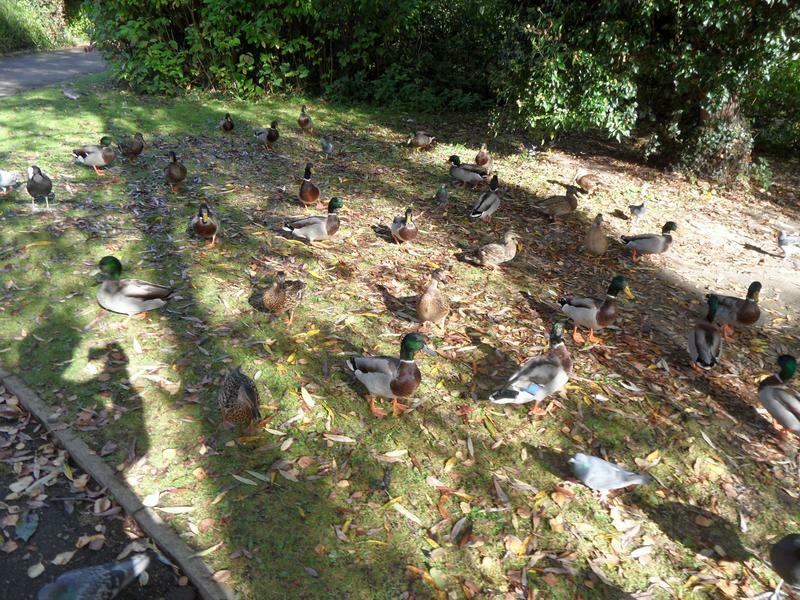 Vast number of Mallard ducks on the grass next to the path, all very hungry, ate a loaf of bread. 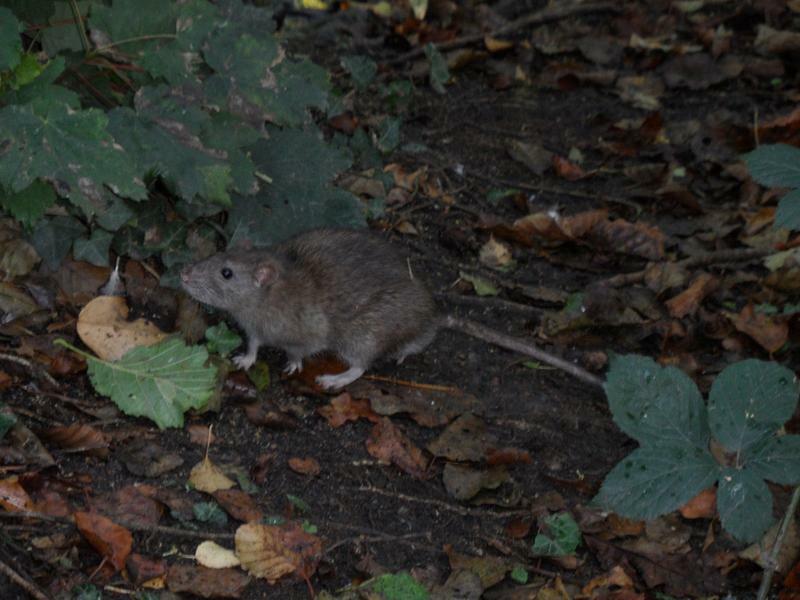 There are signs around the park warning of rats, and with good reason. 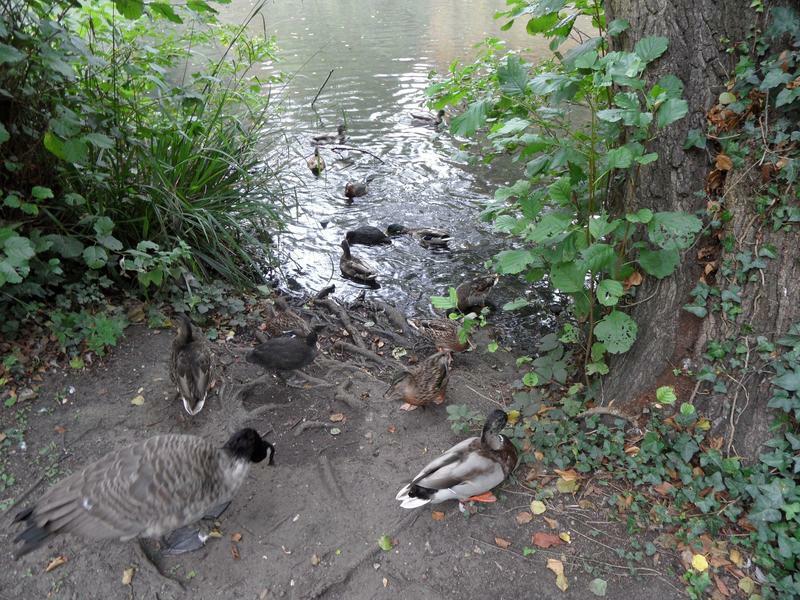 Mix of geese, Mallard and Mandarin ducks. 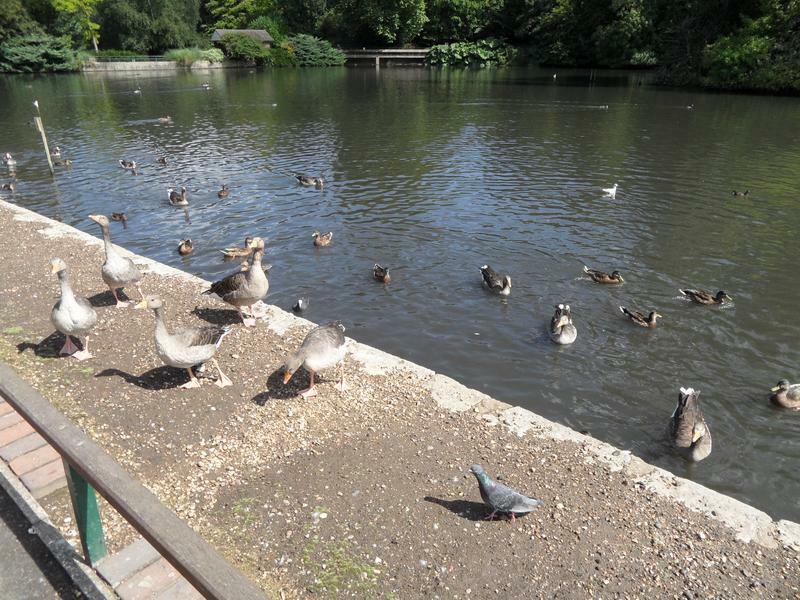 Everyone on the main lake is hungry as well, but already finished three loaves of bread. 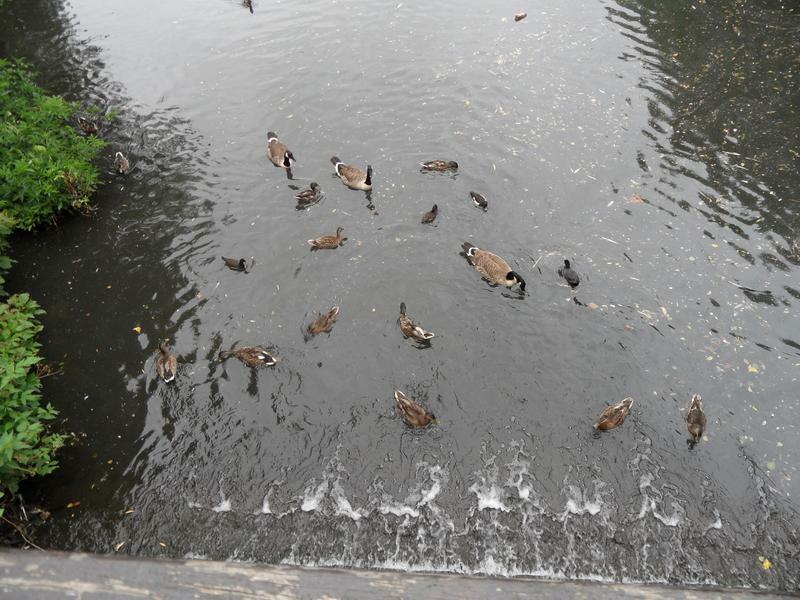 More ducks and geese on the pond below the waterfall. 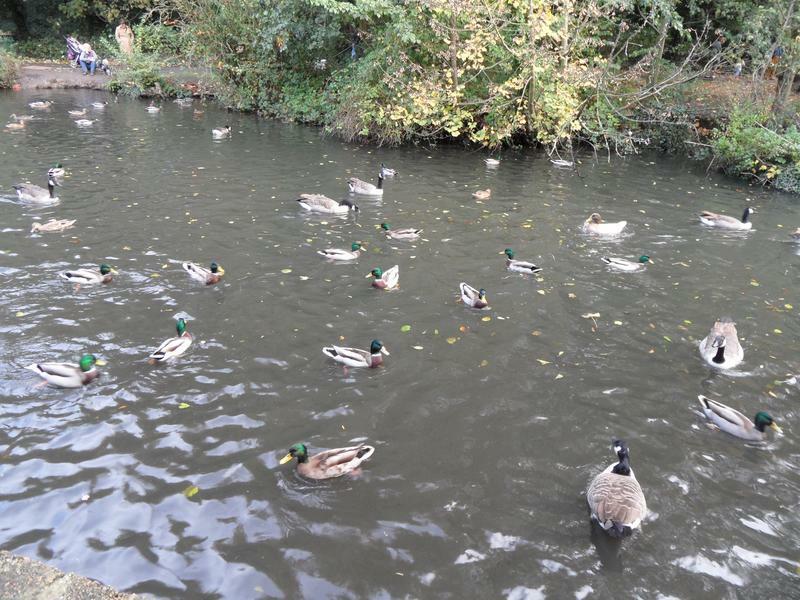 19th October 2014, lots of Mallard, Coots and Canada Geese on the top pond. 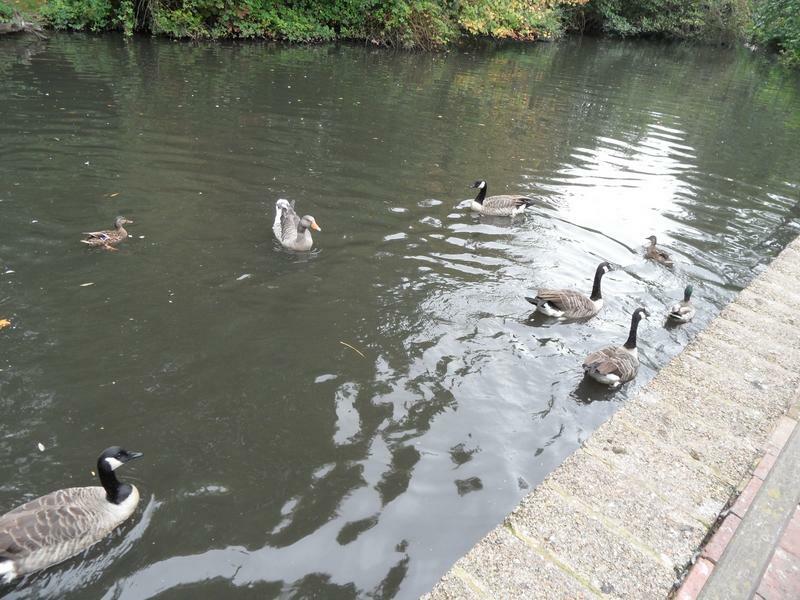 And rushing out of the water looking for food. 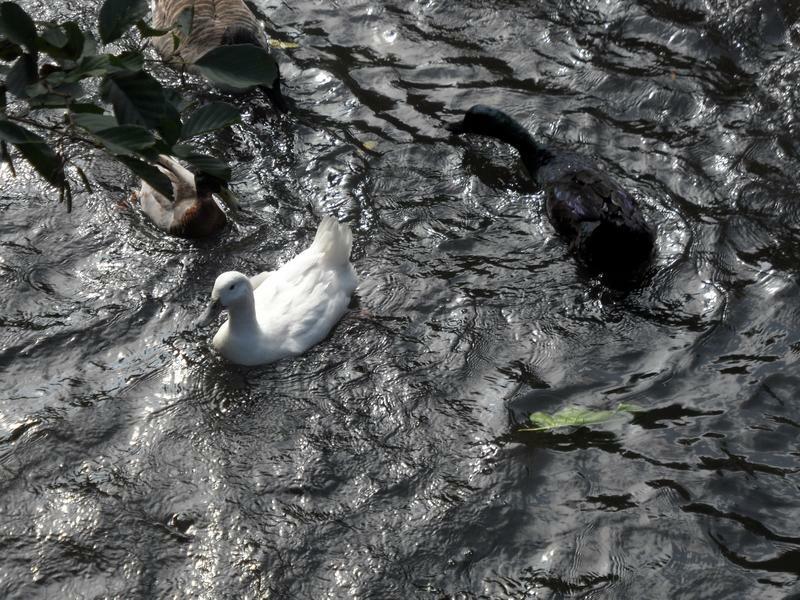 The two White Ducks seem to live on this beach, with a Coot. 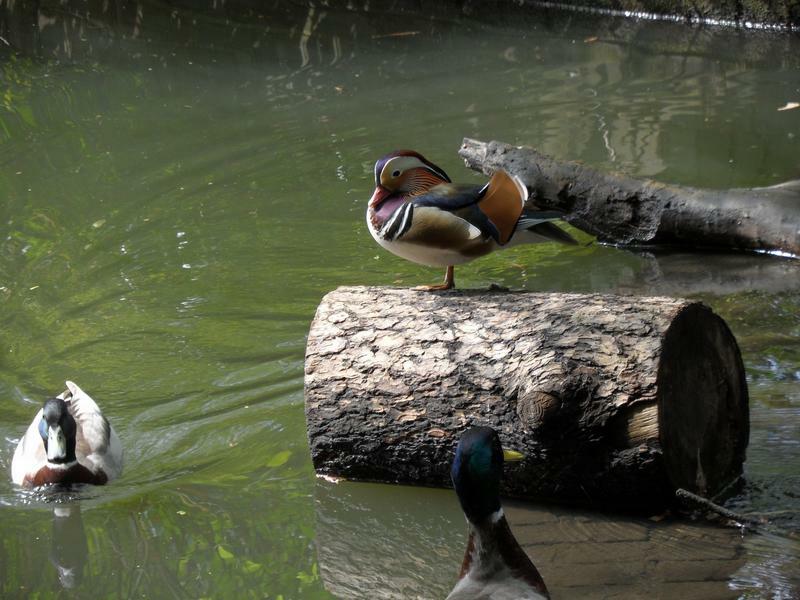 A pair on Mandarin ducks looking for food. 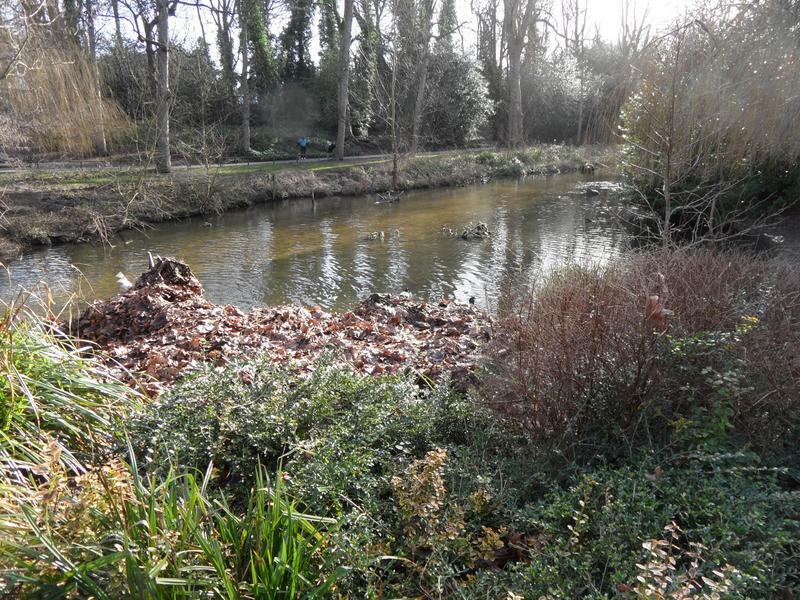 The next pond along has a male and female Mandarin. 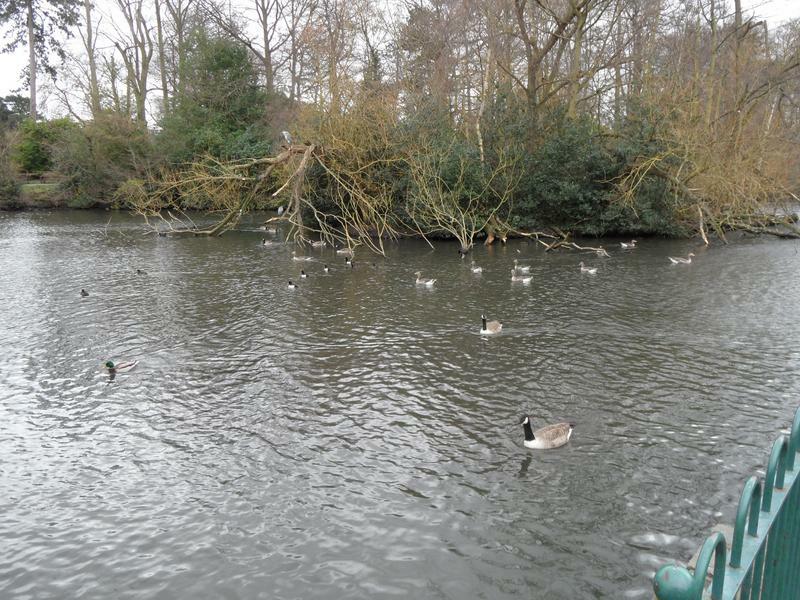 A lot of activity on the main lake, several birds following me again. 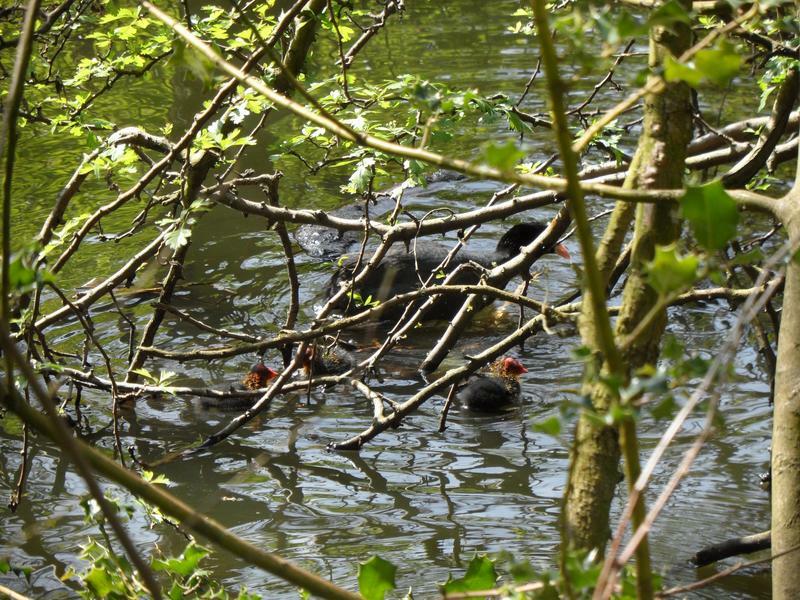 A few Moorhens near the bottom pond. 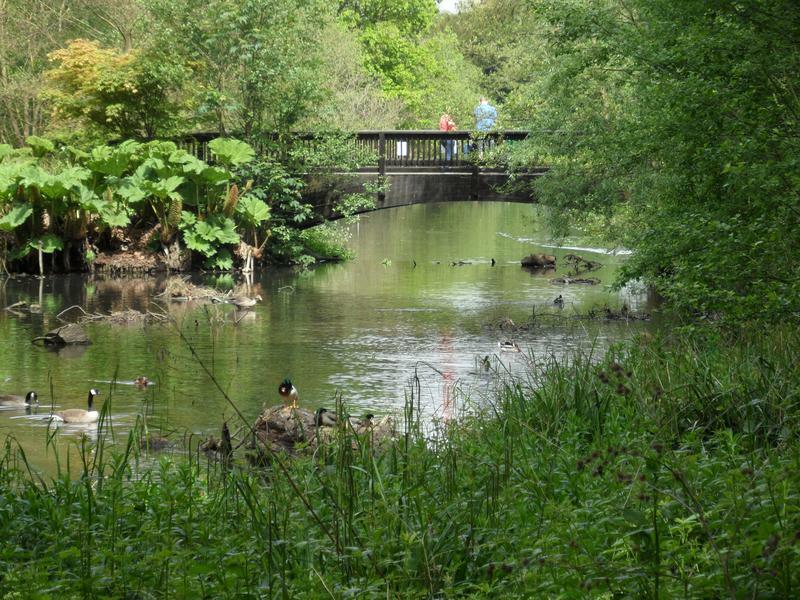 Good view of the bottom pond and bridge being fed by a stream entering the park from the south, everything has been cut back heavily. 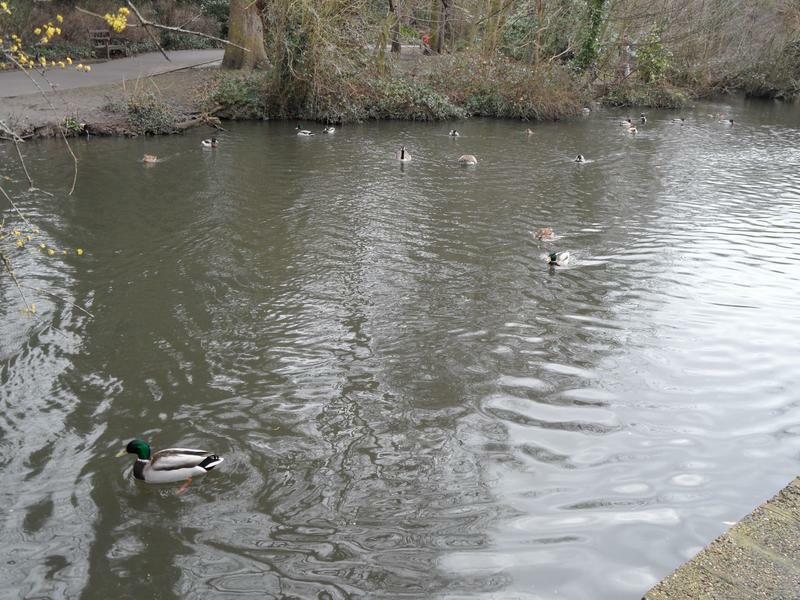 this pond, maybe they recognised me walking down the path? 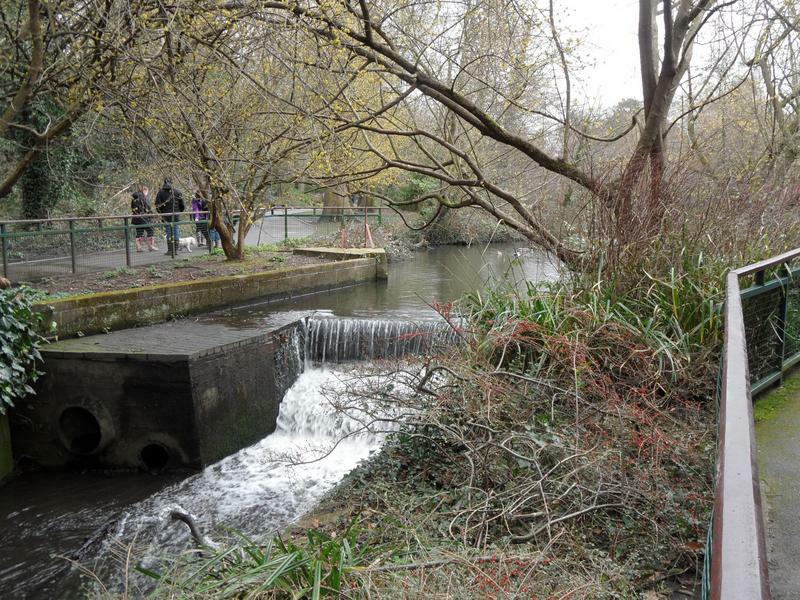 9th November 2014, after heavy rain, so the waterfall at the top of the park is in heavy flow. 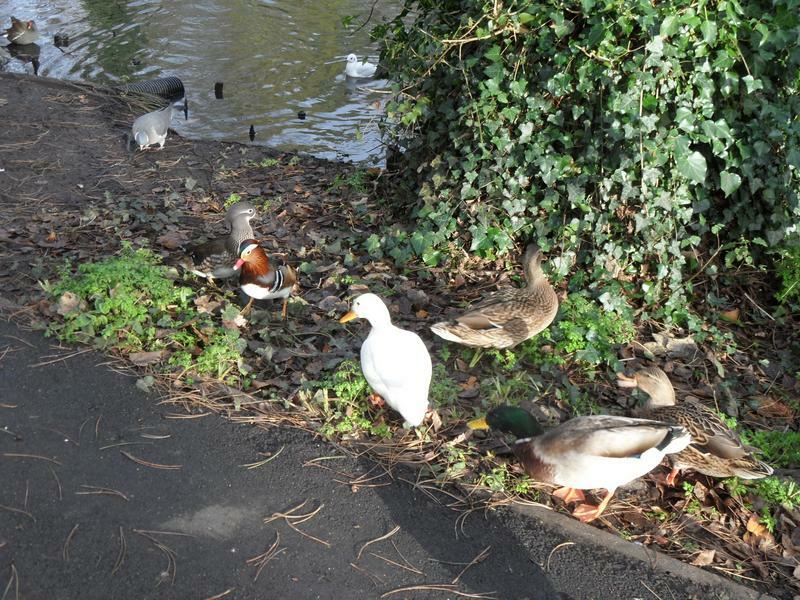 Even more ducks than usual on the path looking for food. 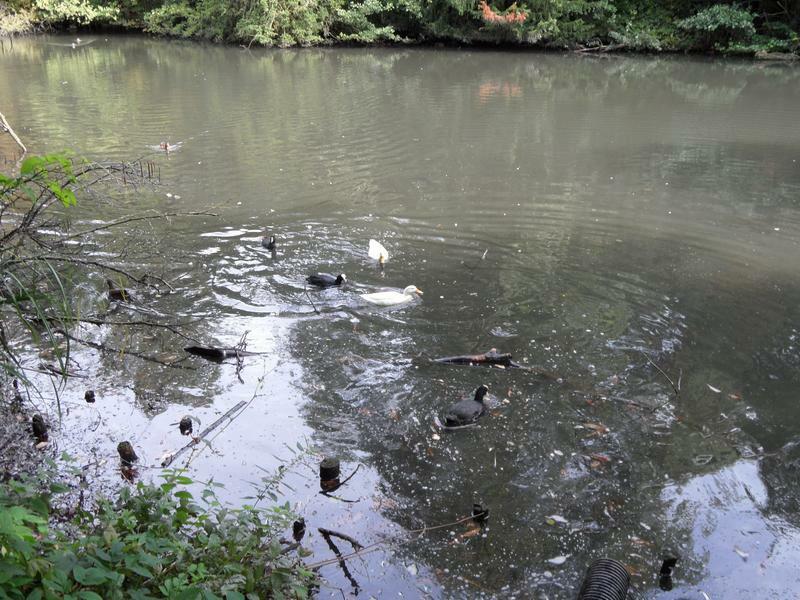 The White Ducks on their usual beach, with Mallards and Coots. 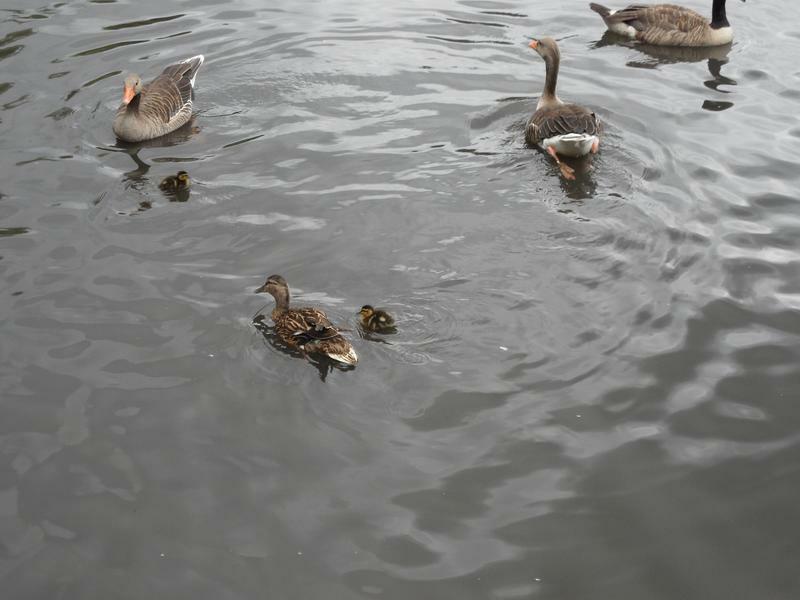 The swam family on the main lake. 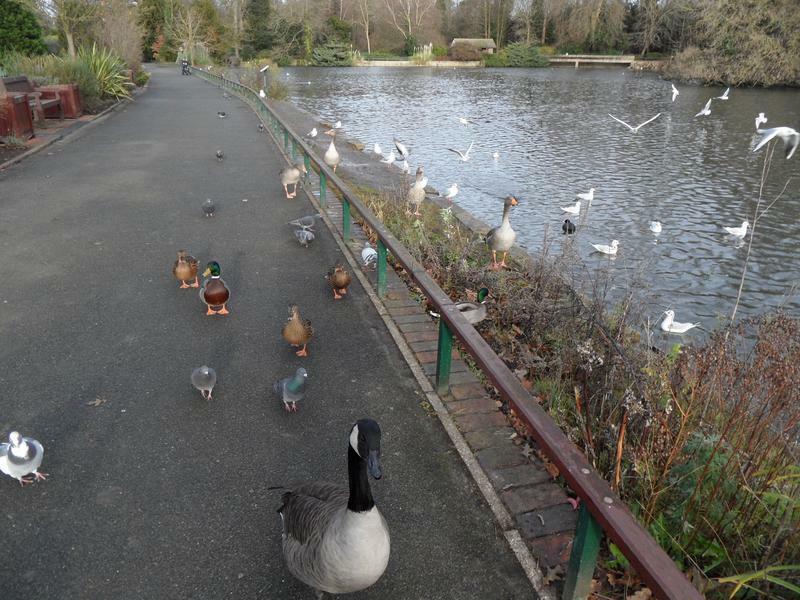 14th December 2014, lots of seabirds now it's winter, no geese, just ducks. 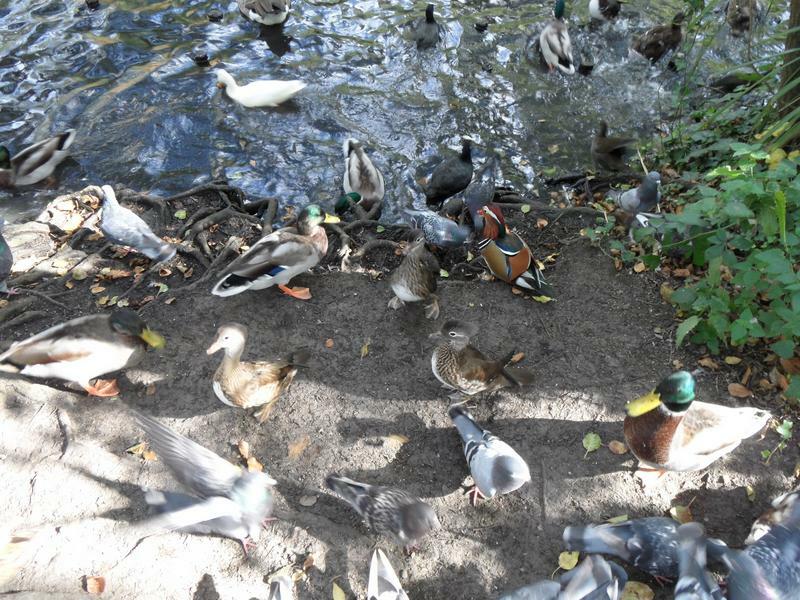 All coming out of the pond looking fof food. 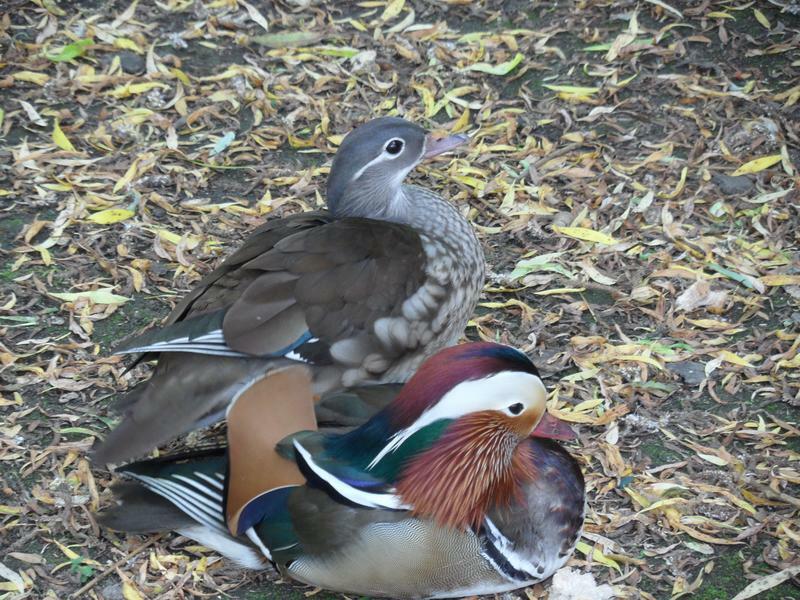 A male and female Mandarin. 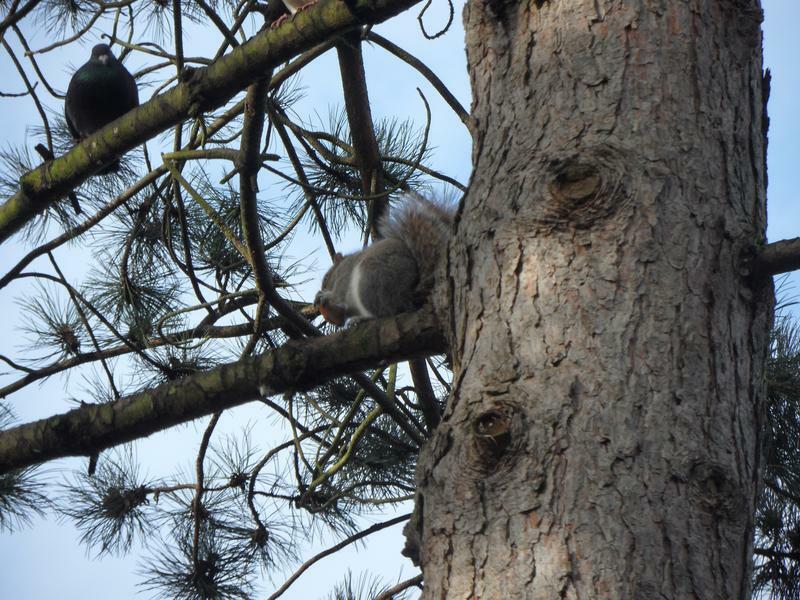 I dropped half a slice of bread, this squirrel caught it at my feet and carried it up the tree to eat, not seen squirrels eating bread before. 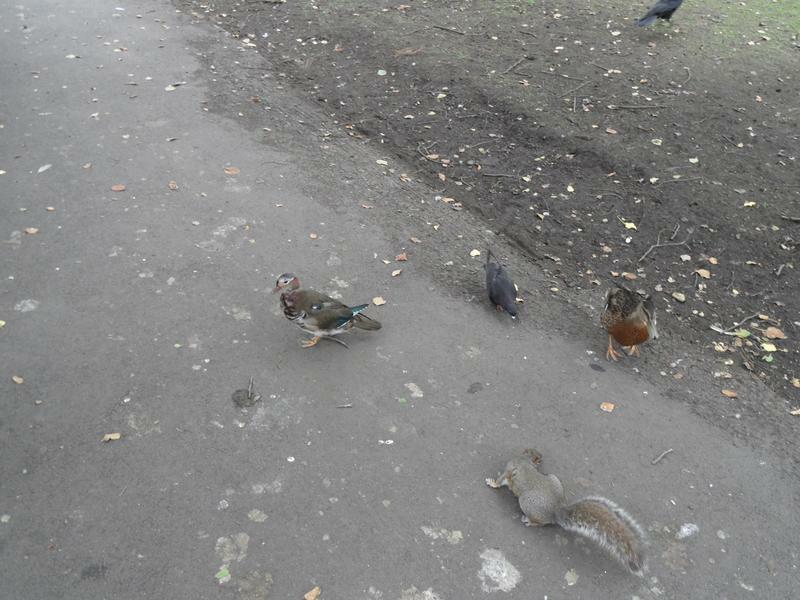 Meanwhile the Mandarins are following me looking for bread as well. 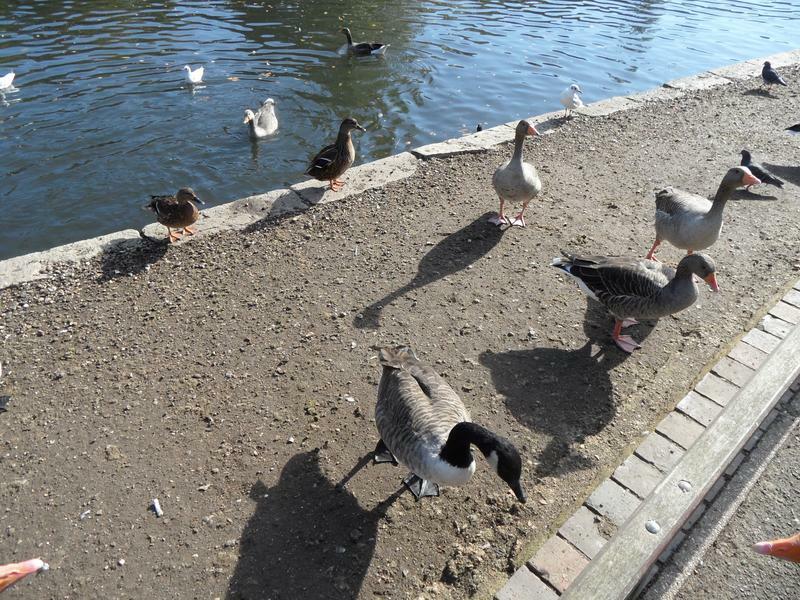 Ditto by the main lake, everyone is very hungry today and they keep following me down the paths. 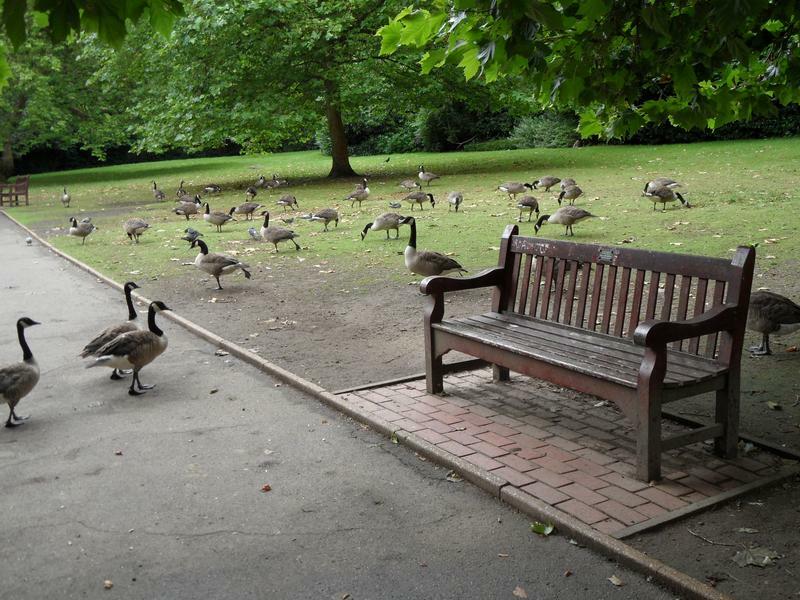 Bad weather means fewer visitors. 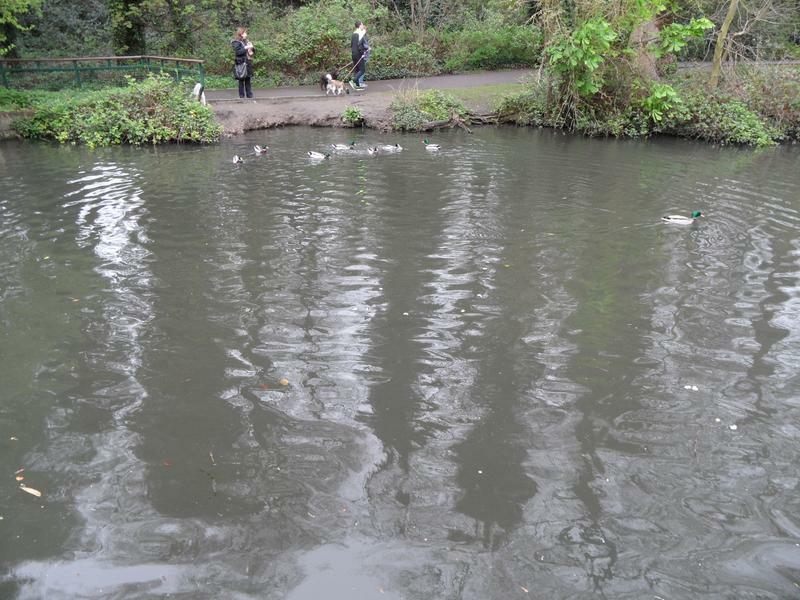 Normally this small area is home to Coots and Moorhens, but it's a free for all today. 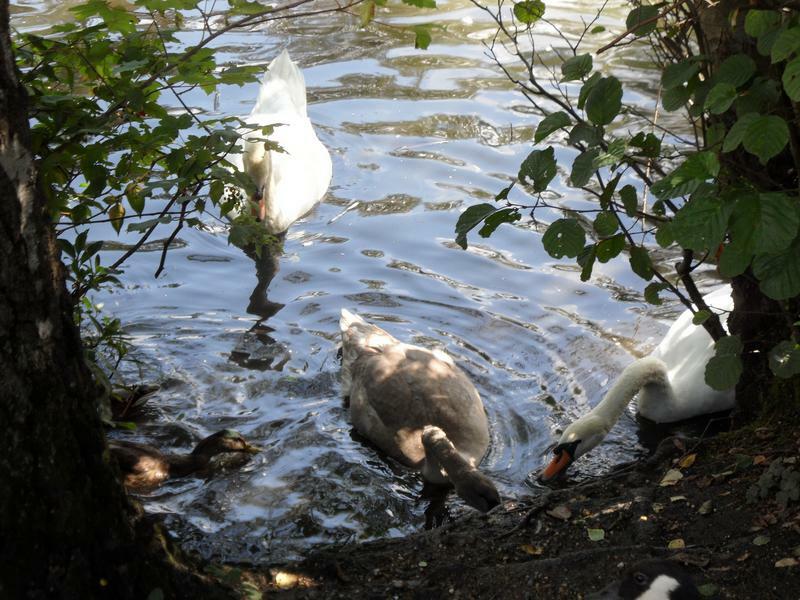 The swan family below the bottom bridge, the cygnet is not pure white yet. 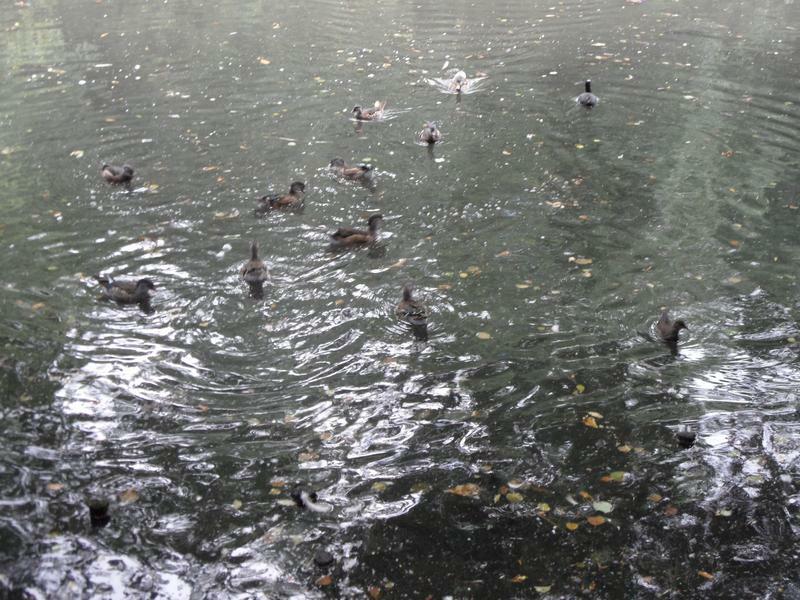 Large number of Tufted Ducks near the playground.